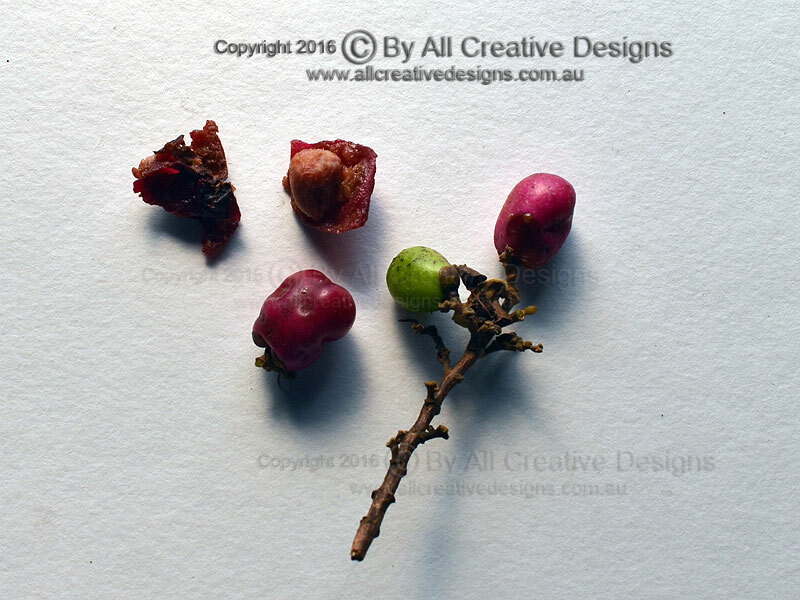 Australian tree identification using five images per species, depicting the full specimen, bark, leaf, flower and/or fruit characteristics. 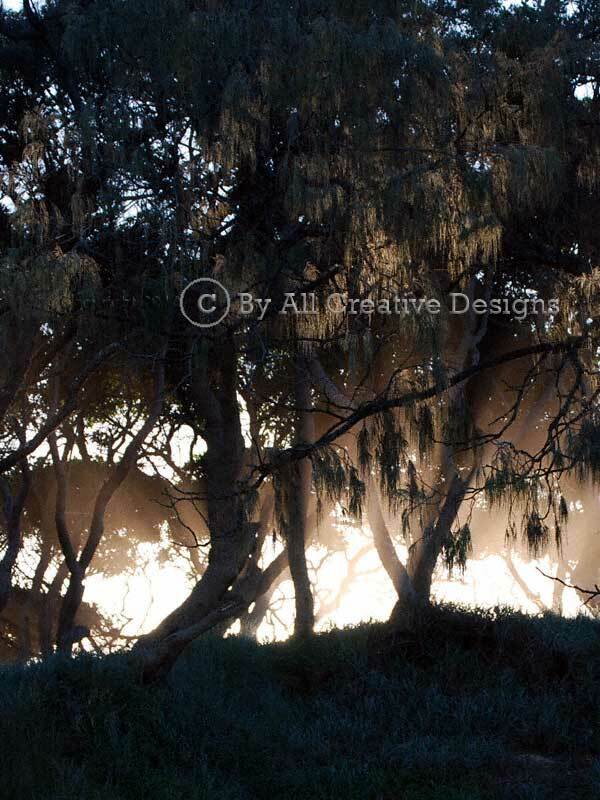 This resource provides dedicated photography of 385 native Australian trees and shrubs found on Australia's East Coast, with an emphasis on tree species occurring in rainforests. 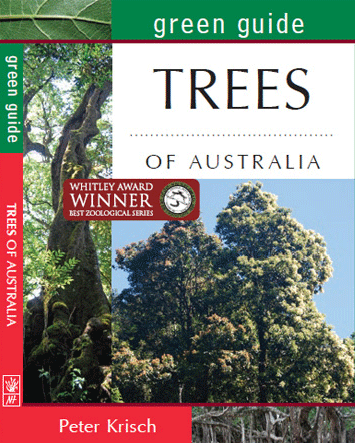 Detailed and comprehensive descriptions are given to assist in the identification of native trees and shrubs. 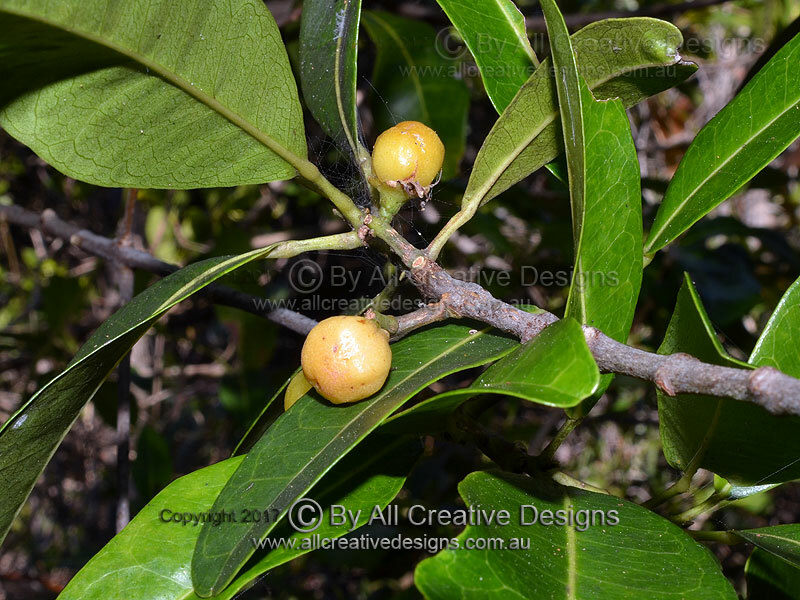 Species in following genera are listed in groups on our web pages: Australian Fig trees (Ficus spp.) 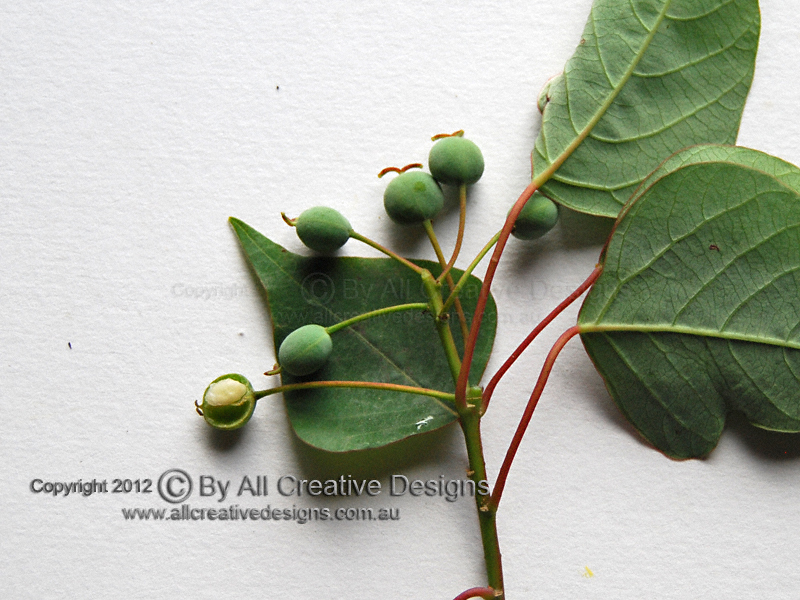 Page 5; Eucalypts (Eucalyptus spp.) 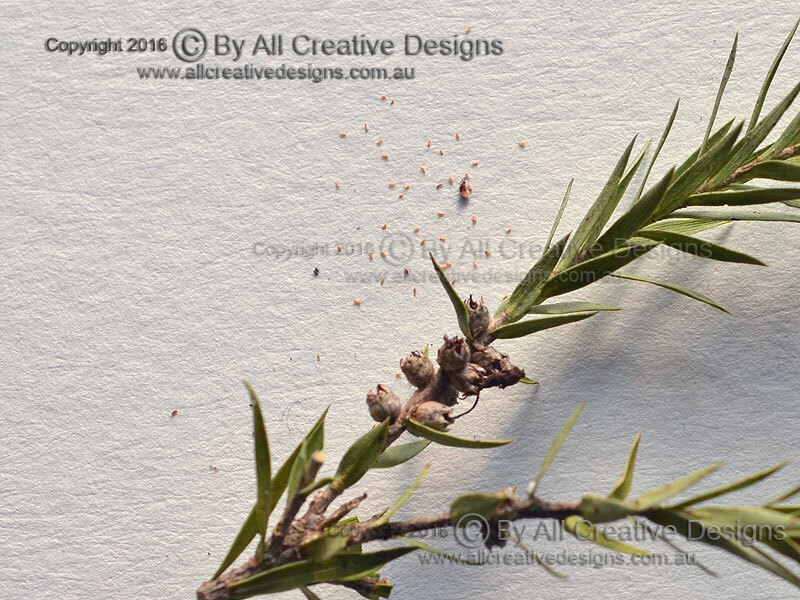 Page 4; Grevilleas (Grevillea spp.) 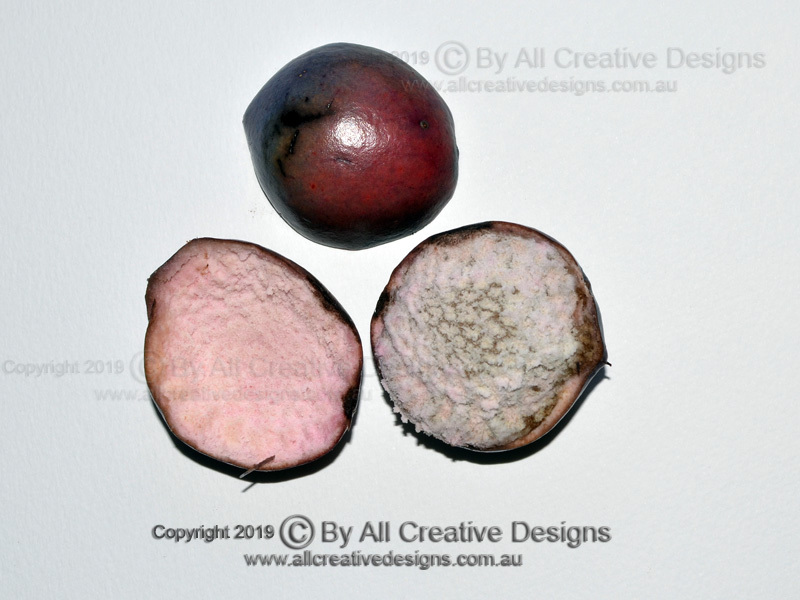 Page 6; Lilly Pillies, Satinashes (Syzygium spp.) Page 10. 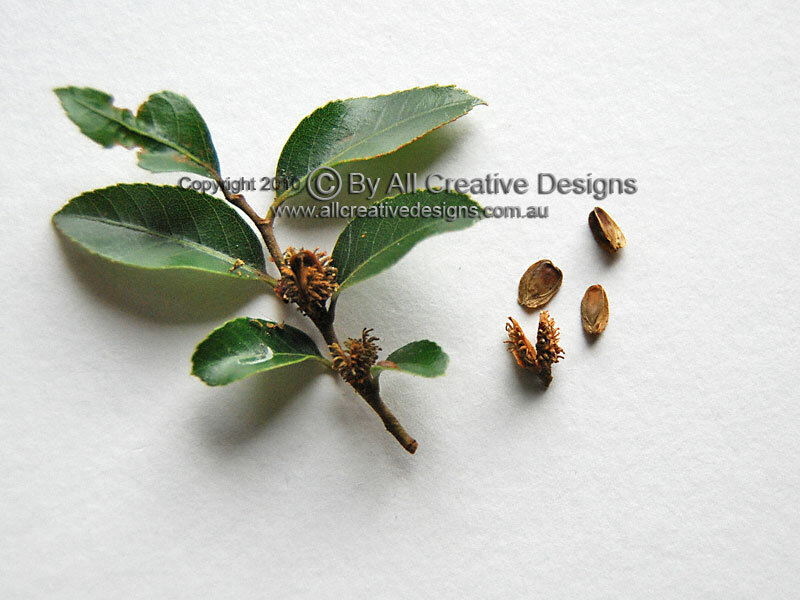 Otherwise all native Australian tree species are listed by common name in alphabetical order. This free resource is revised and extended on a regular basis. See the Flower Identification, Leaf Characteristics and Bark Characteristics pages for information on botanical definitions and concepts used in descriptions. 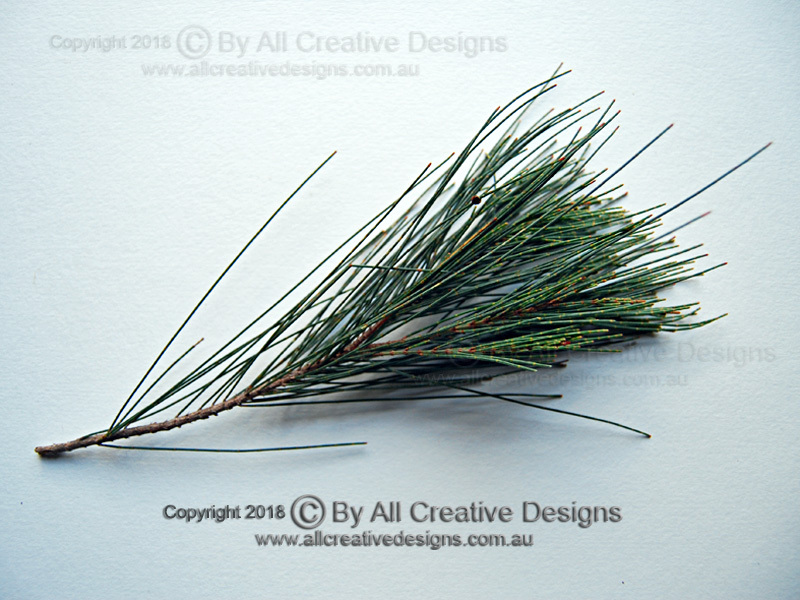 How to recognise Australian tree families and genera. A practical field guide to the identification of native species. More than 200 full colour photographs and detailed descriptions explaining leaf, bark, flower, fruit and other tree characteristics. 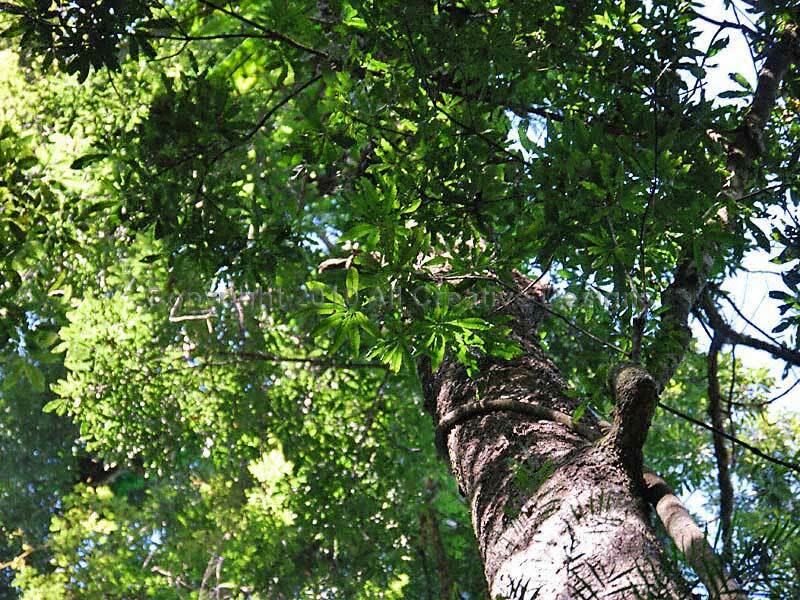 The last remaining upland tropical rainforests are habitats for this very ornamental tree, which under ideal conditions can reach a height of 30m. It is a member of the Protea family (Proteaceae), one of the oldest flowering plant families. 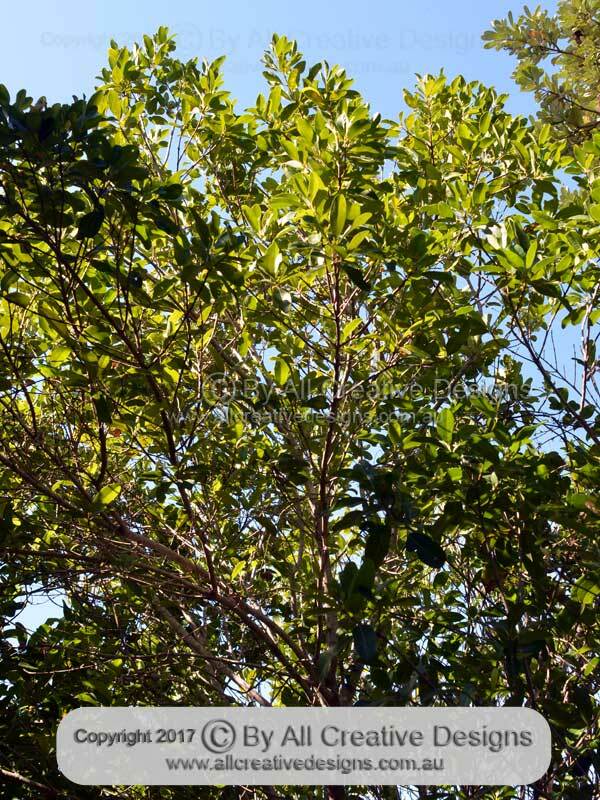 The name of the genus relates to its natural distribution and the species name refers to the diverse shapes of the leaves, present on mature trees (1). 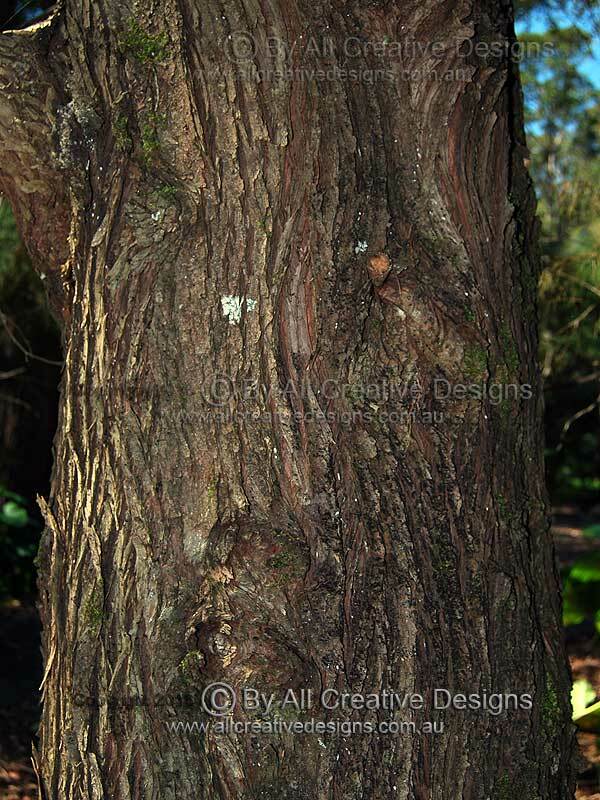 Bark is firm and shades of grey with fine horizontal ridges (wrinkles) present at the base of older trunks (2). The rounded but flattened fruit (a drupe) features a thin bluish skin and reaches about 4cm in diameter. A thin layer of mealy pulp surrounds a very hard and deeply grooved stone (endocarp) that contains a single (edible?) seed (3). 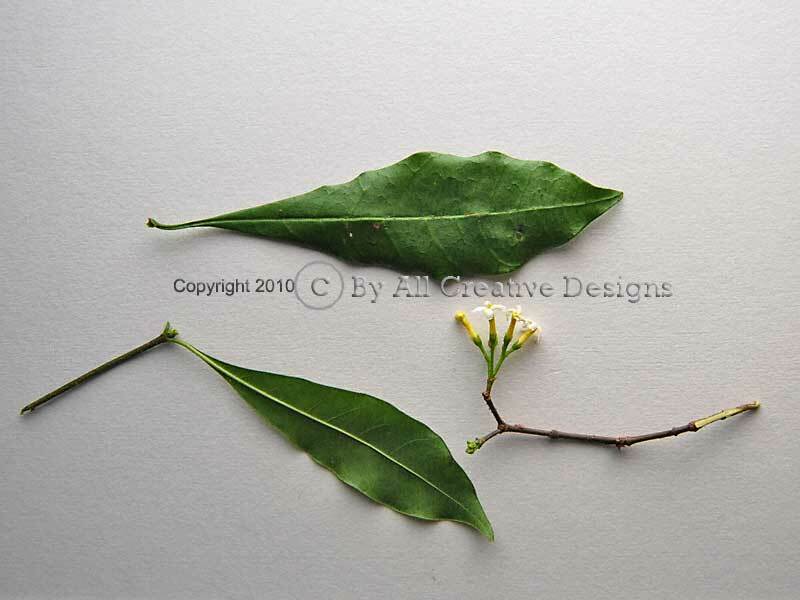 Simple leaves are crowded at the end of branches and mostly have an alternate arrangement. They are either deeply lobed or broadly oblanceolate (reverse lance-shaped) with margins that can be entire (smooth) or toothed. Leaves are up to 25cm long, covered in brownish hair when young, thick and firm in texture. Venation is very prominent and raised on lower leaf surface (4 & 5). Distribution: Atherton tablelands and mountain ranges behind Cape Tribulation, north Qld. 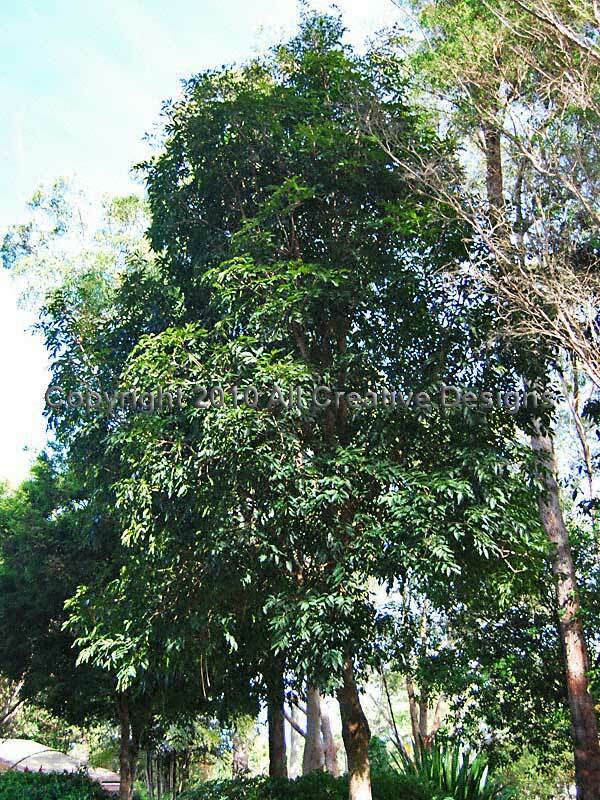 Under favourable conditions this medium sized tree can reach a height of about 20m in its natural habitat of monsoon and open forests close to the coastline. It is semi or fully deciduous at the end of spring with most leaves turning a reddish brown before falling, which is a helpful identification feature. The very upright, column like trunk supports far reaching and horizontally held branches (Image 1). 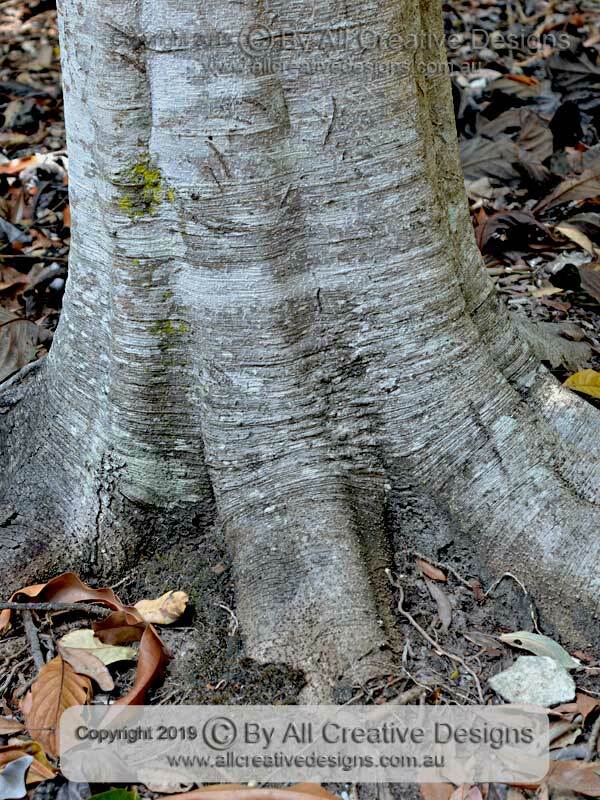 On softer or steep sloping ground large buttress roots will form, which are covered in a hard, flaky and tessellated (scaly) bark extending to the base of the trunk. 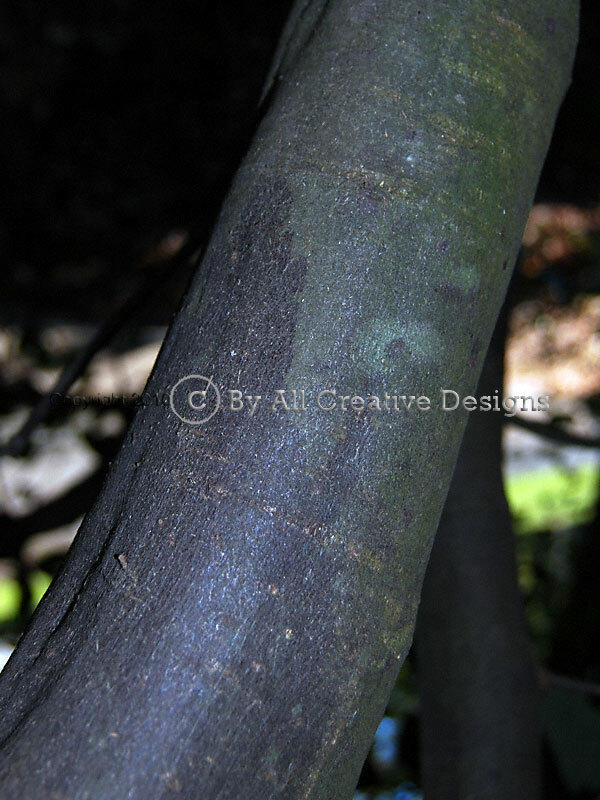 Bark further up the trunk weathers to a light grey colour with fissures showing a darker grey brown under-layer (2). The fleshy fruit (a drupe) is ovoid in shape and up to 20mm long. When fully mature the fruit is hairless, dark blue in colour with a smooth and shiny surface. It contains a single hard, cream to orange coloured seed up to 12mm long (3). 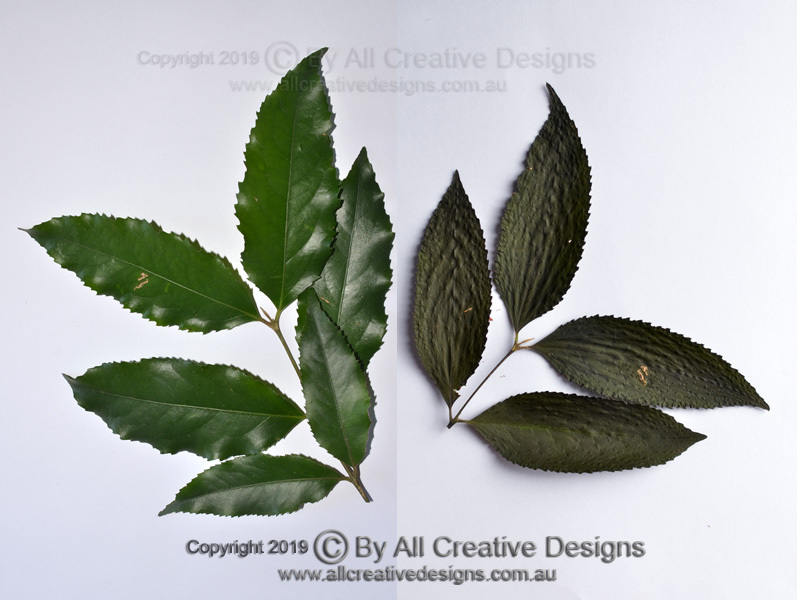 Simple leaves with an alternate arrangement are; up to 12cm long, obovate in shape with entire margins, hairless, dark green on top, paler green beneath, rather dull, strong and firm in texture. Leaf apex varies from fully rounded (obtuse) to mucronate (ending in a blunt or fine tip), base shape is cuneate to more attenuate. Two swellings (glands) are located along the centre vein towards the base of the leaf blade (lamina), but are not present on all leaves. Venation is clearly visible on both surfaces showing up to 7 pairs of lateral veins. Distribution: Within proximity to the coast from central to northern Qld & NT. 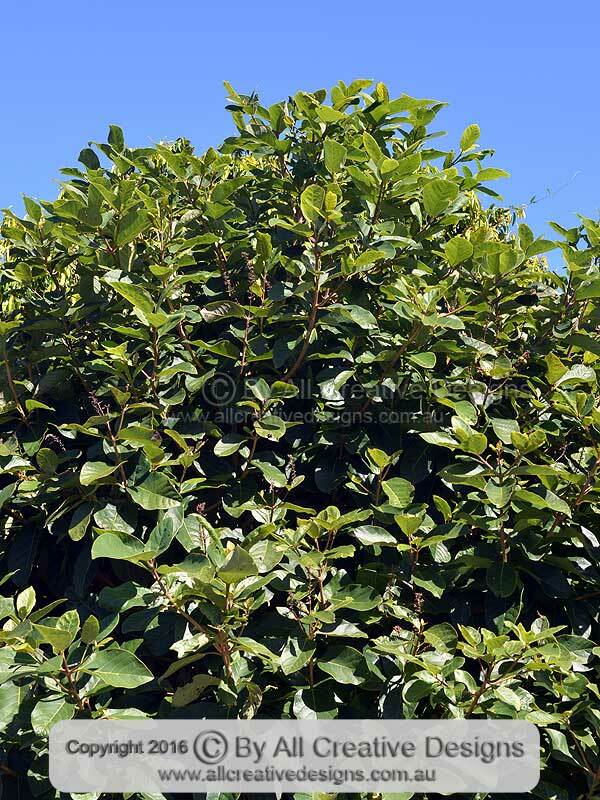 This native shrub is very adaptable to different environments and therefore has a very wide distribution range from high rainfall areas along the coastline to arid inland regions. Under favourable conditions it can reach a height of 2.5m and most specimens feature a single stem (Image1). Bark is brown in colour with a firm texture and often covered in small irregular shaped blisters (2). Flowers, characteristic for the pea & bean family (FABACEAE Subfamily FABOIDEAE), are up to 15mm long with the standard, wings and keel varying from mauve to more pink or purple in colour. Often more than 20 individual flowers are held on a single raceme emerging from an axillary joint (3). 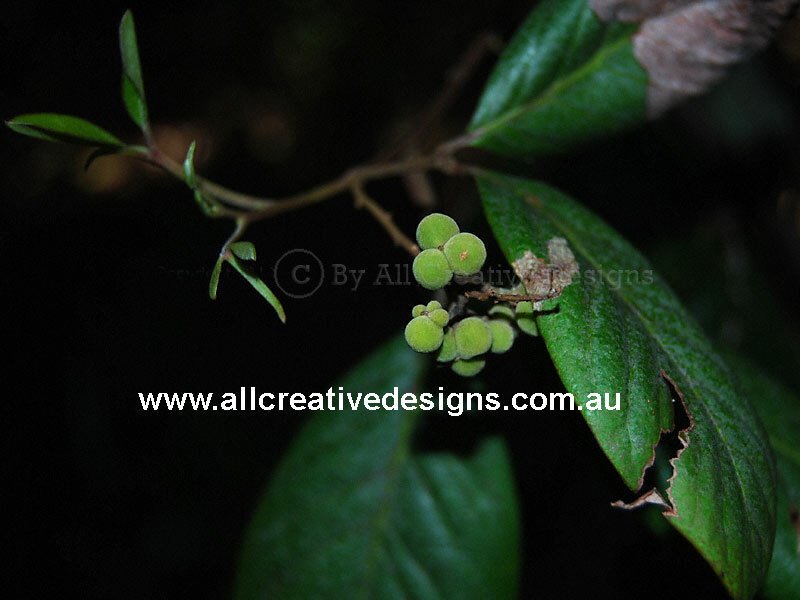 The fruit is a small pod up to 50mm long, green at first, then turning black with maturity. It splits at the sides to release flat and roughly square shaped seeds (4). 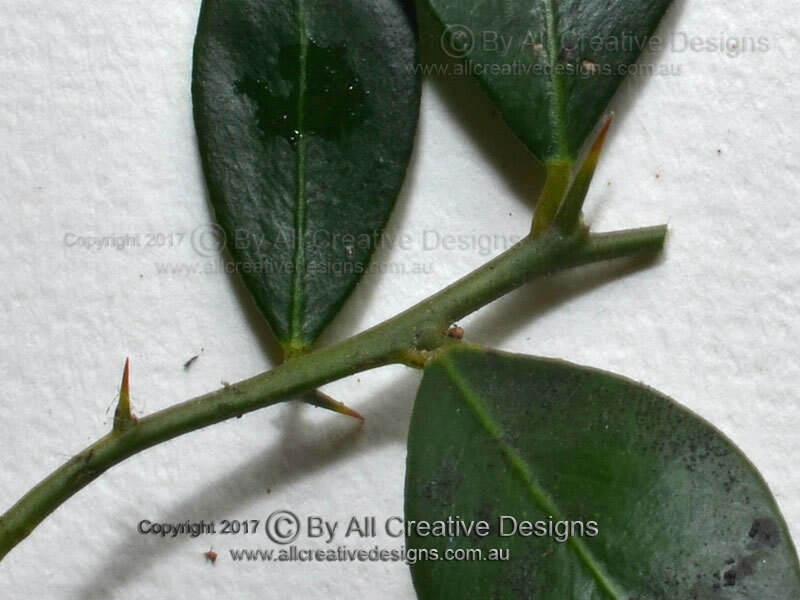 Pinnate compound leaves consist of 7 to more than 19 leaflets, which are; 2 to 4cm long, mostly elliptic in shape with entire margins, hairless, dark bluish green in colour, thin with a smooth texture. Leaflet apex is rounded (obtuse) with a fine tip (mucro), base shape is also obtuse. Except for the mid rib, venation is only faintly visible (5). Distribution: Australia wide. See Flower Identification and Leaf Characteristics Page for information on botanical terms used. 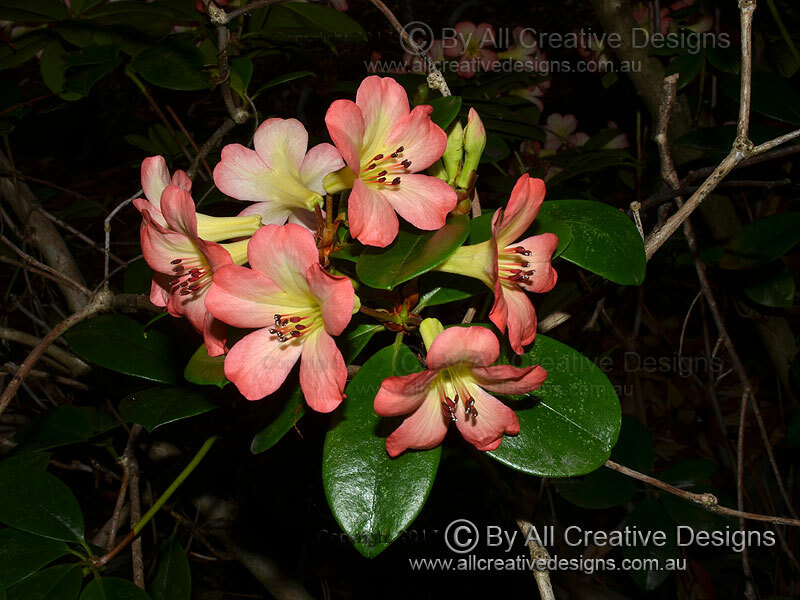 This very attractive shrub is one of only two Rhododendron species naturally occurring in Australia. 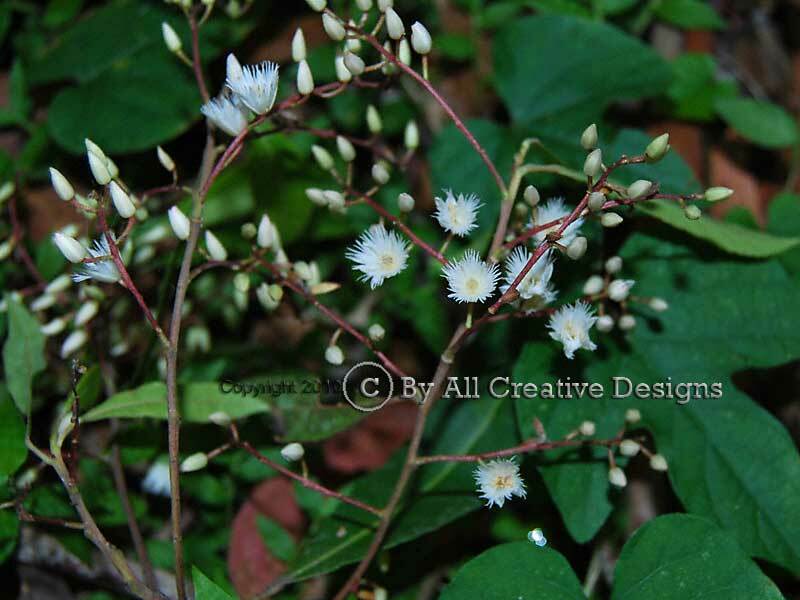 It is a small terrestrial shrub or sometimes can be an epiphyte (growing on a host). 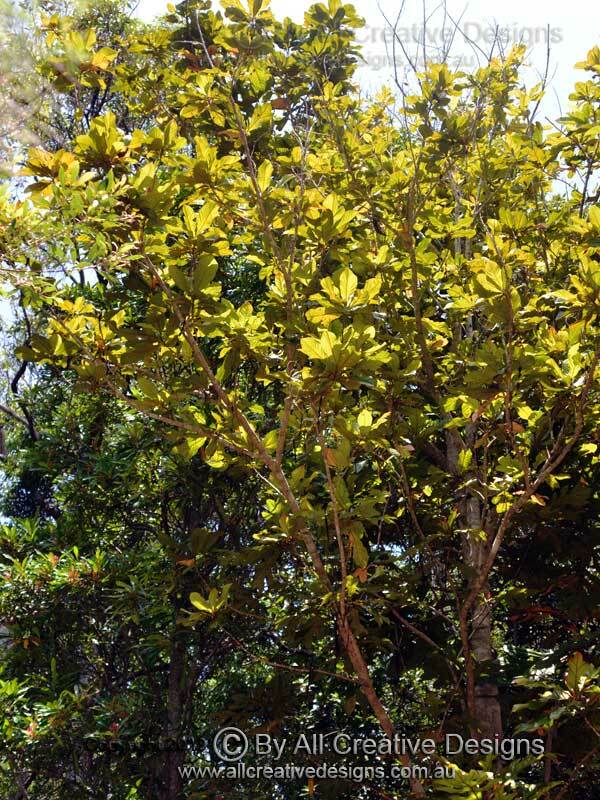 The Native Rhododendron is up to 1m tall and occurs as an understorey species in upland tropical rainforests. This shrub is a beautiful native ornamental plant that can be grown in frost-free areas (1). 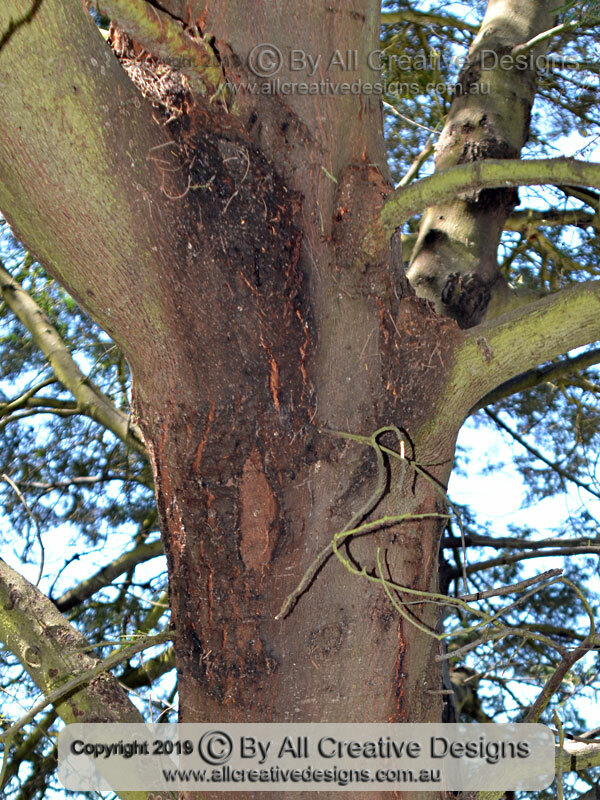 Bark is salmon coloured, weathering to grey with a flaky texture on older stems (2). Gorgeous bell-shaped flowers are up to 5cm long and held in groups of up to six individuals, which appear at the end of young branches (terminal). The five rounded lobes are reddish pink in colour, fading to yellow, and fused into a corolla at the base (3). Simple leaves clustering at the end of branches are arranged in a whorl of 5. They are; up to 10cm long, broadly elliptic in shape with entire margins, hairless, glossy dark green on top, rather thick and rigid in texture. 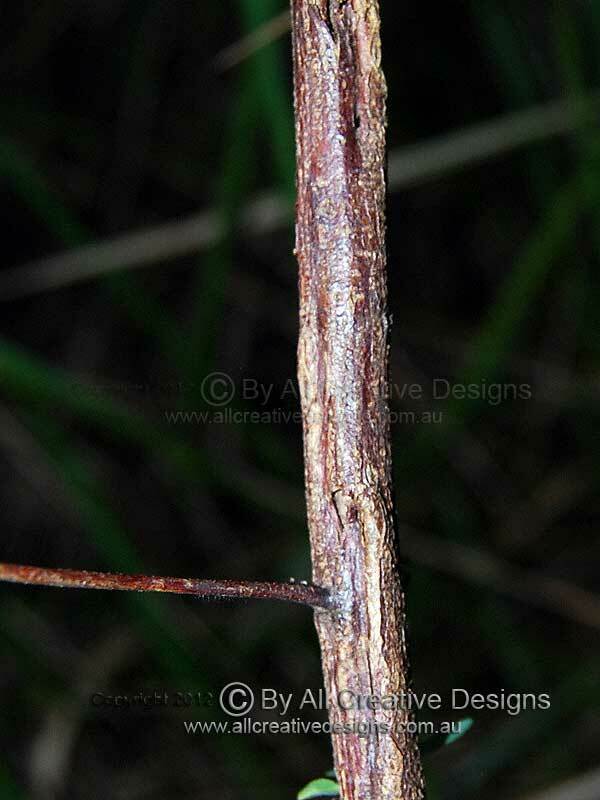 The straight petiole (leaf stalk) is grooved on the upper surface and up to 2cm long (4 & 5). Distribution: Tropical Far North Qld. See Flower Identification and Leaf Characteristics Page for information on botanical terms used. 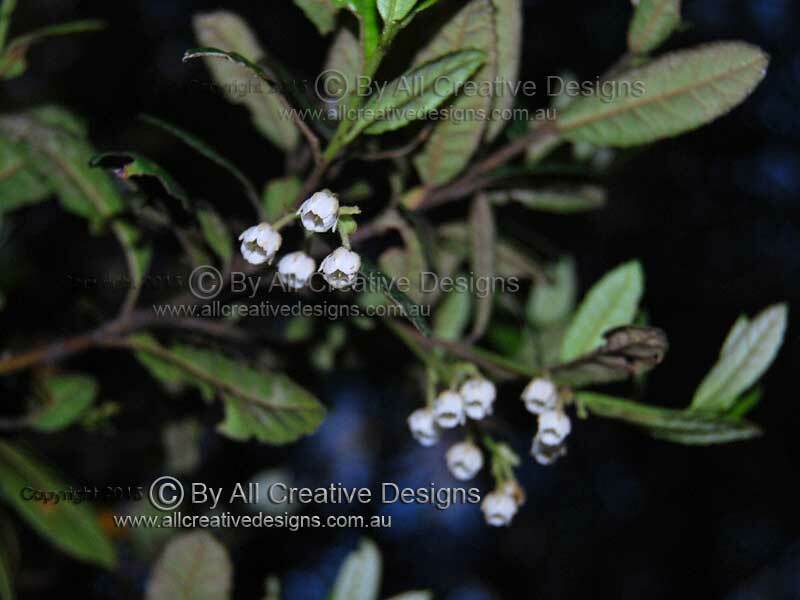 This native tall shrub or small tree reaches a height of 8m and occurs in the drier parts of ecotones surrounding rainforests. It is a member of the Citrus genus and closely related to the Finger Lime (Citrus austalasica) (1). 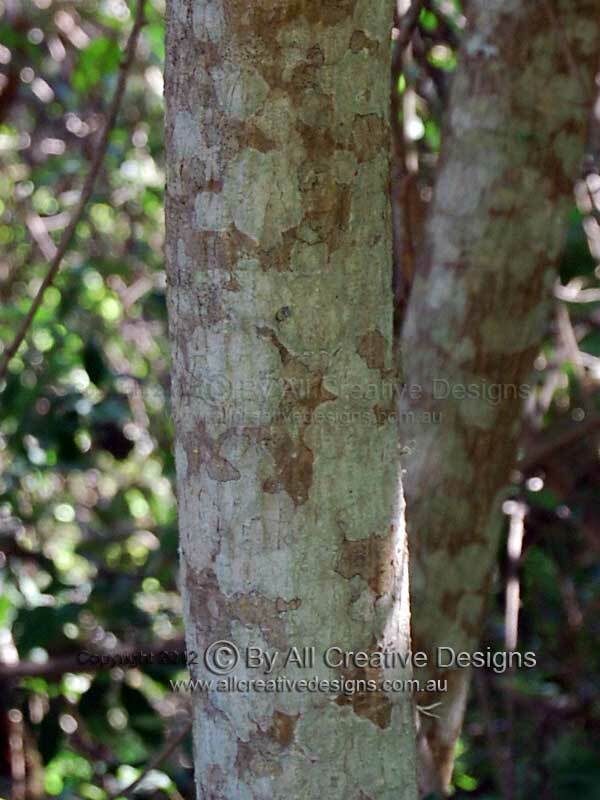 Bark is pale brown in colour with a finely rough, fissured texture (2). The rounded fruit with its dimpled surface closely resembles a lime and has a strong sour taste. It reaches 4 to 5cm in diameter and is a yellowish green colour when fully ripe. Fruit shown is still immature. (3). Branches are covered in sturdy and very sharp spines up to 3cm long (4). 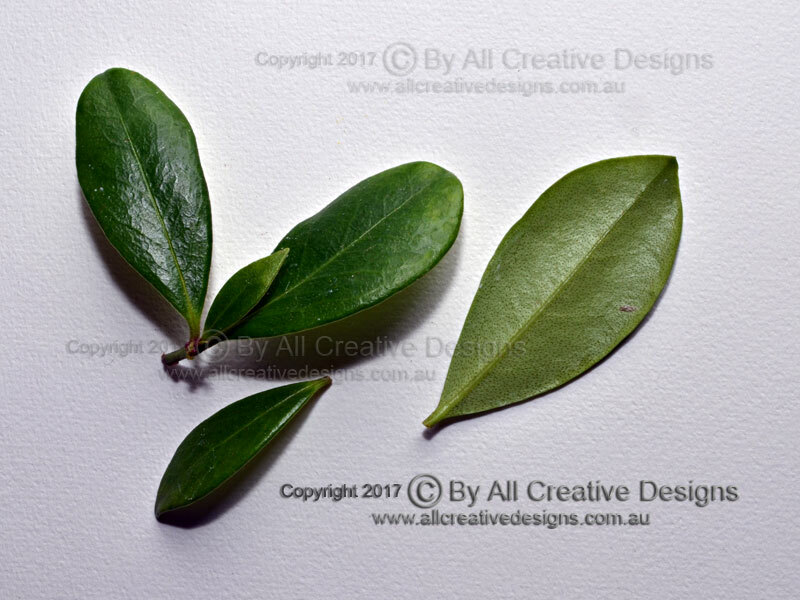 Simple leaves with an alternate arrangement are; up to 5cm long, obovate or broadly elliptic in shape with entire margins, hairless, dark green, glossy on top, paler, dull beneath and emit a strong citrus scent when crushed. The leaf apex is distinctively notched (emarginate) and except for the prominent midrib venation is rather faint (5). Distribution: North from south-eastern Qld. 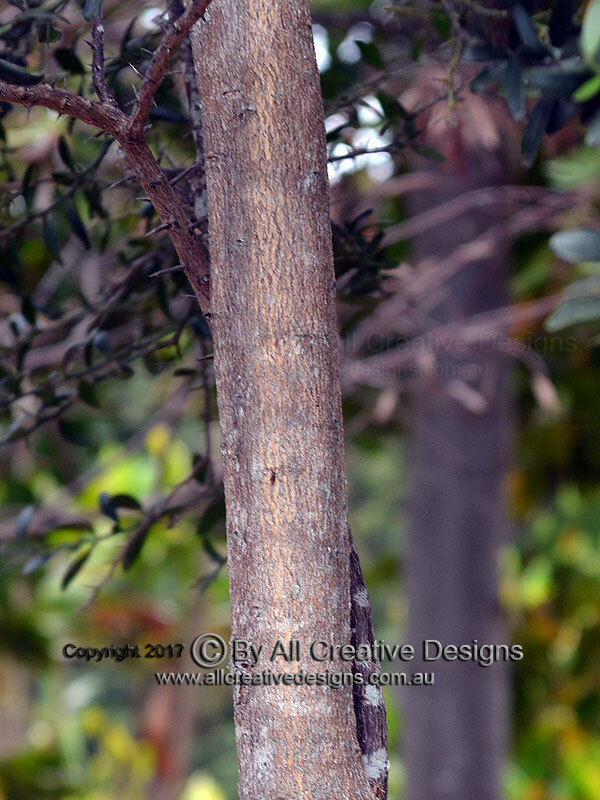 The Australian Teak is a medium to tall tree species found along the east coast. 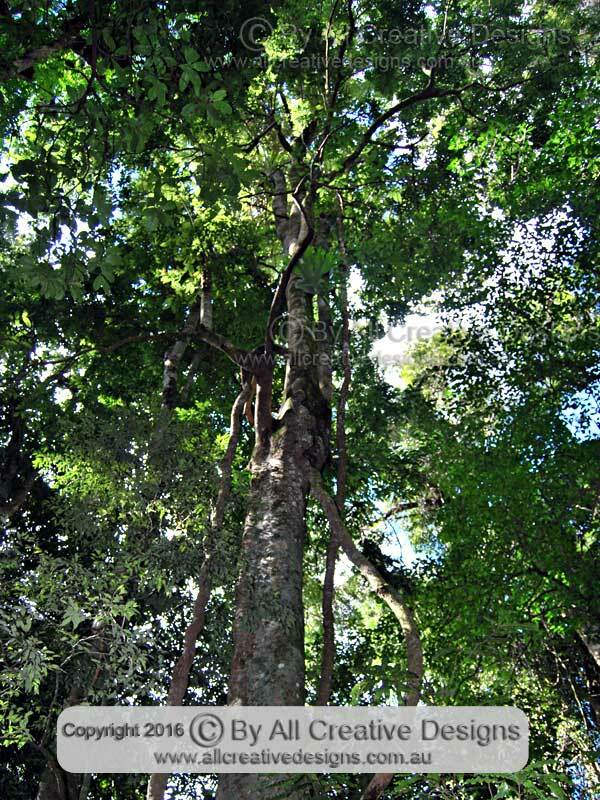 When growing on nutrient rich soils within subtropical rainforests, it can reach a height of 40m (Image 1). 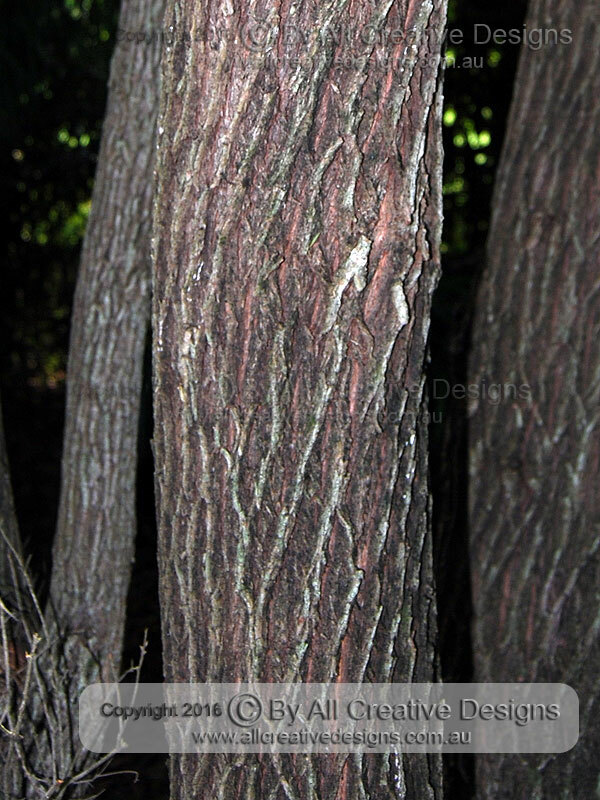 Bark has a smooth firm texture and is a dark brown in colour (2). New growth can flush in pink and salmon tones before changing into a vibrant bright green (3). 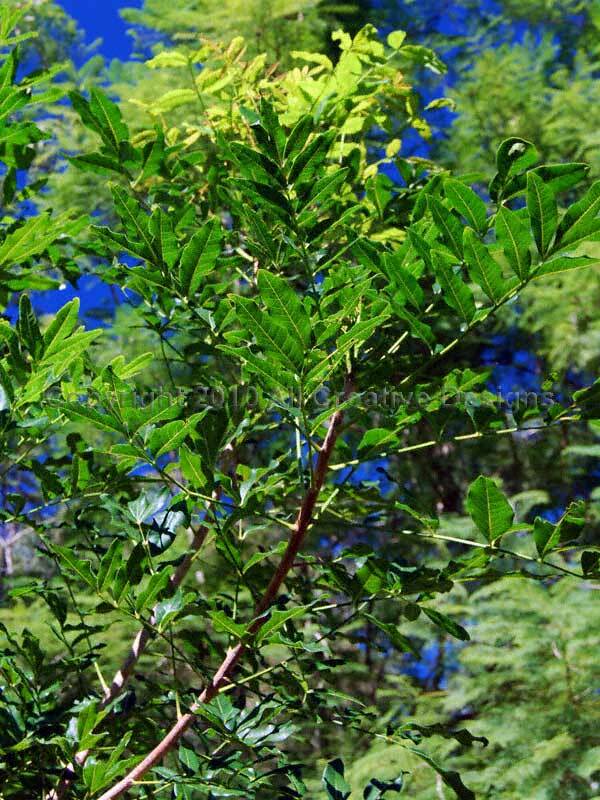 Pinnate compound leaves feature between 5 and 13 leaflets. 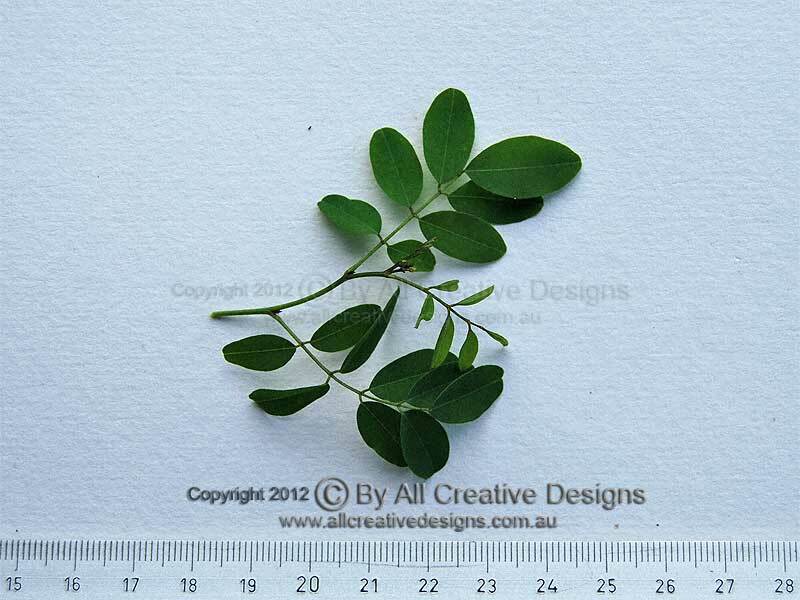 Leaflets are; up to 14 cm long, ovate to elliptic in shape with entire margins, hairless, dark green, glossy on top, paler beneath, firm, smooth and scented when crushed. Leaflet apex is acute; base shape is cuneate and sometimes asymmetric (4 & 5). Distribution: From the NSW north coast to central Qld. 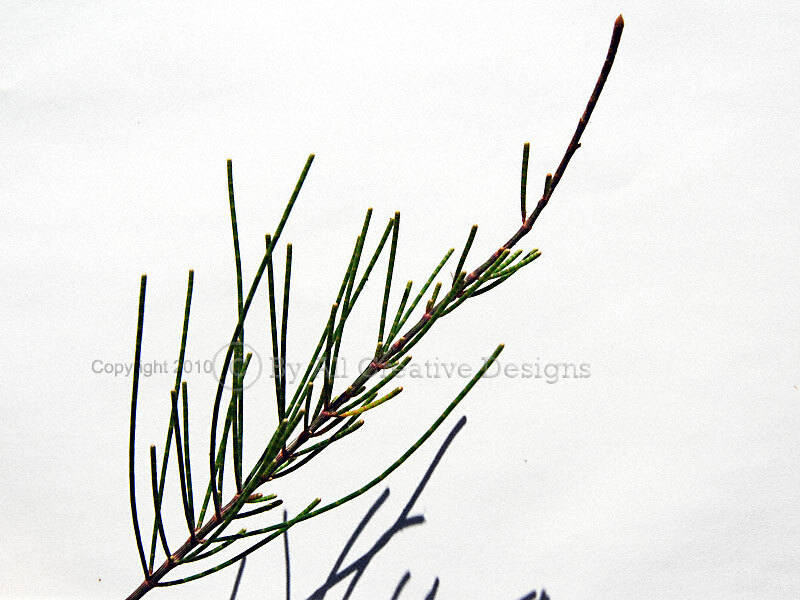 Due to habitat depletion this native endemic conifer species has become increasingly rare. 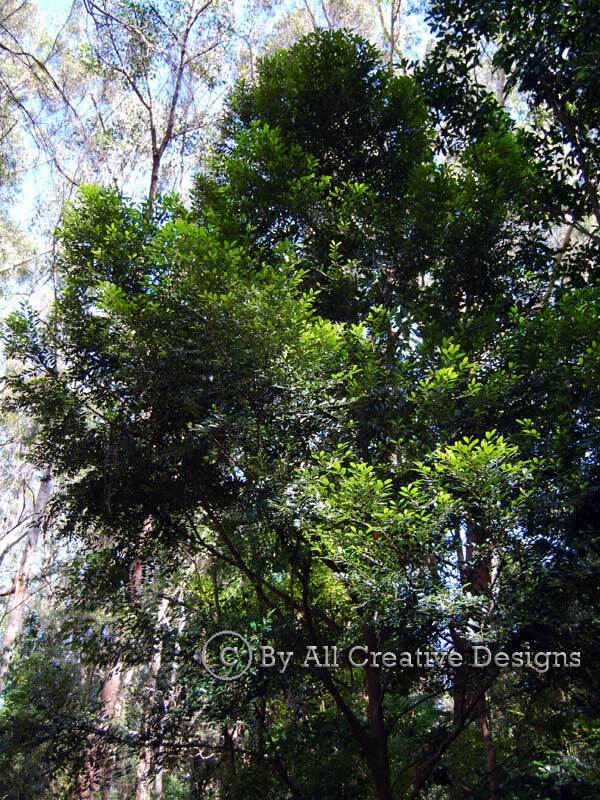 It is able to reach a height of 20m and occurs in open Eucalypt dominated forests (Picture 1). 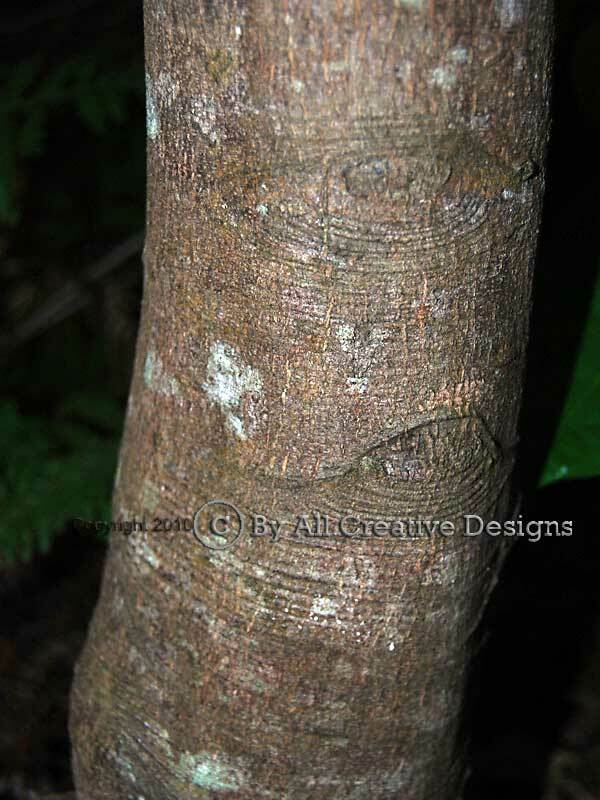 Bark is brown in colour, weathering to dark grey with age, very rough and fissured in texture (2). 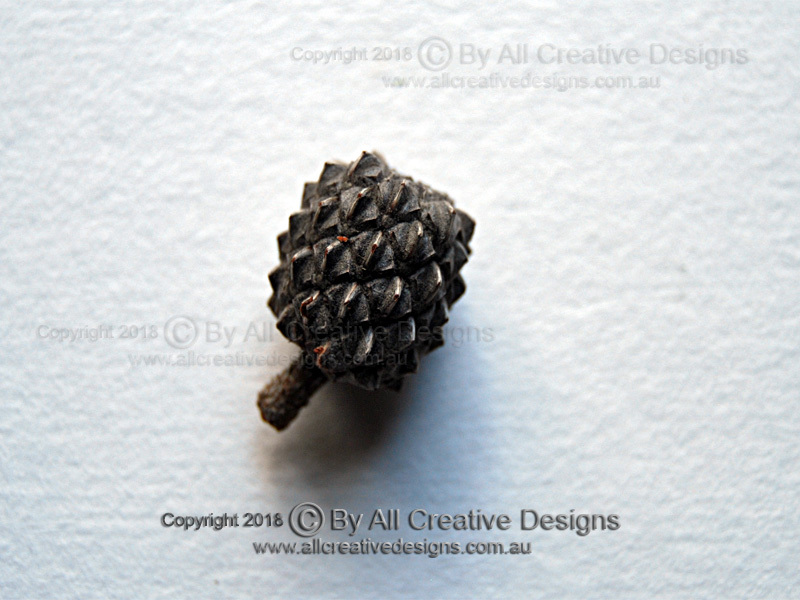 Woody female cones measure up to 13mm in diameter (before opening) and consist of 6 scales, 3 larger and 3 smaller, which open widely at full maturity (3). 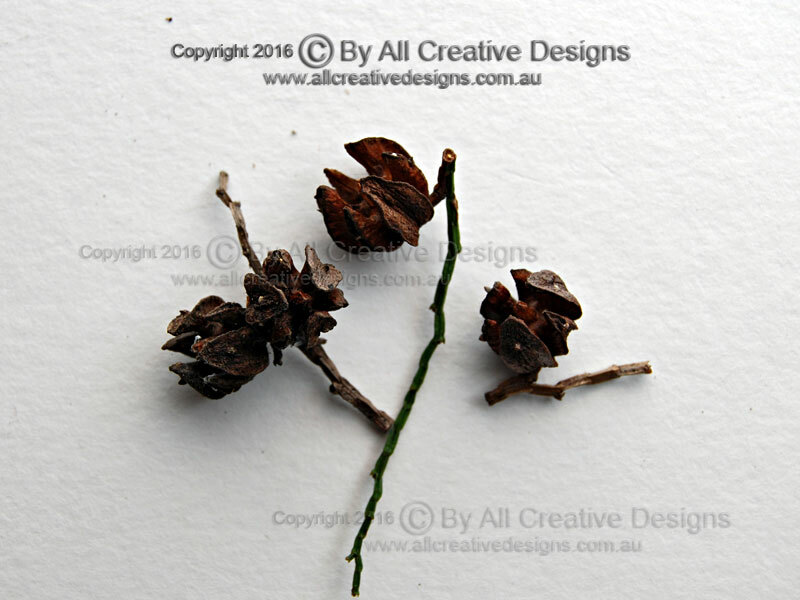 The light brown male cones are up to 4mm long and appear at the very end of young branchlets. Male and female cones are borne on the same tree (monoecious) (4). Minute scale-like leaves are keeled (ridged), between 2 to 4mm long and appear in a whorl of three, which is characteristic for the genus (5). Distribution: Northern NSW and Qld. 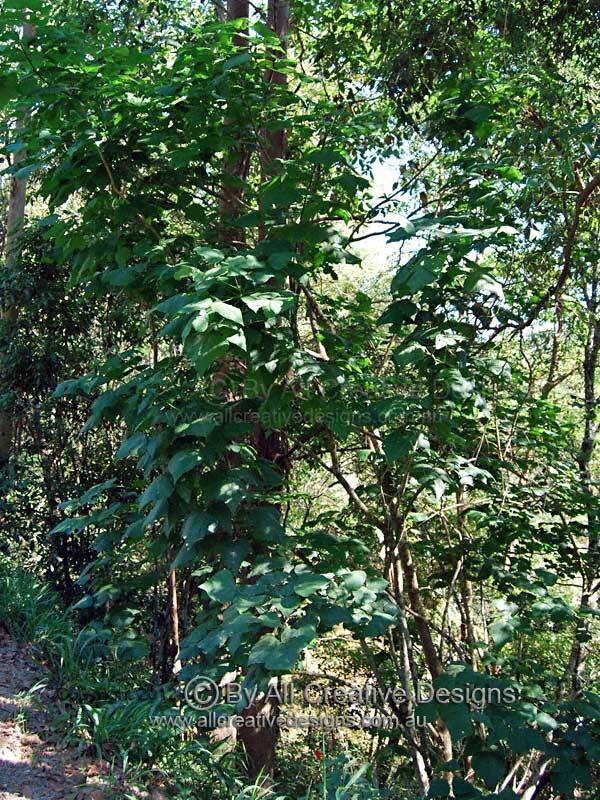 The Banana or Windmill Bush is a native shrub up to 3m tall. 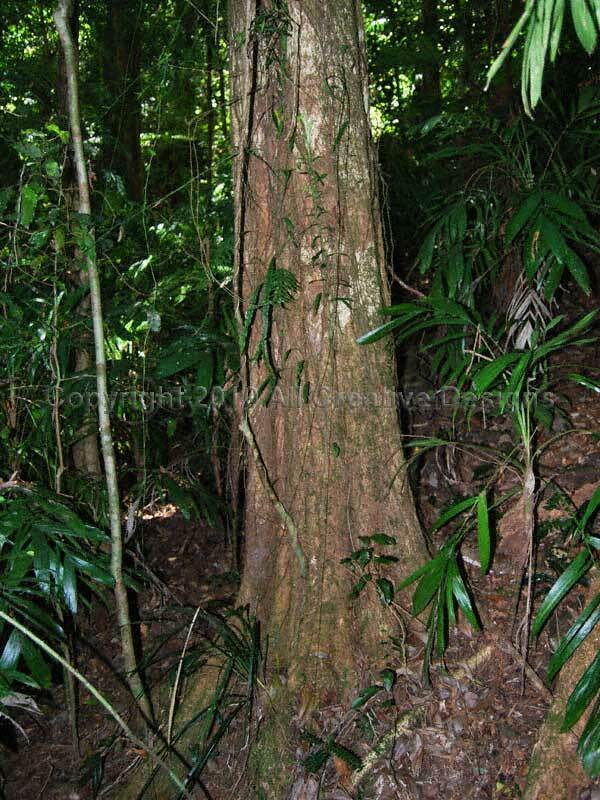 It is found as an understorey species on margins and within subtropical and warm temperate rainforests (Image 1). Bark on older stems is a light brown in colour with a finely rough texture (2). The handsome flowers feature petals which are fused at the base to form a yellowish tube and split into 5 separate white lobes at the apex (3). The shape of the poisonous fruit (a follicle) corresponds to the common naming of this species. The follicle contains a number of seeds covered in a reddish sticky pulp (4). Stems, twigs and petioles exude a milky sap when broken, which is a helpful identification feature. 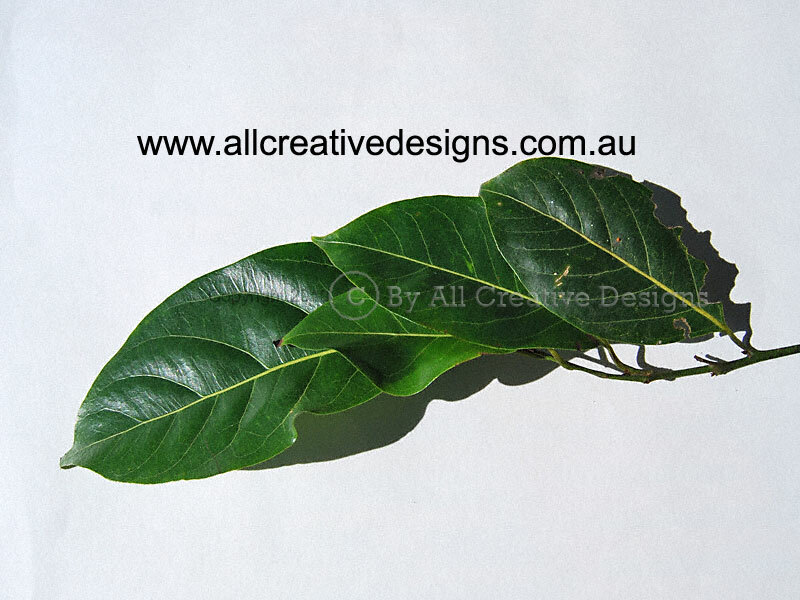 Simple oppositely arranged leaves are; up to 12cm long, mostly oblanceolate with slightly incurved and undulating margins, hairless, mid green, satin glossy on top, paler and rather dull beneath, soft and smooth in texture. 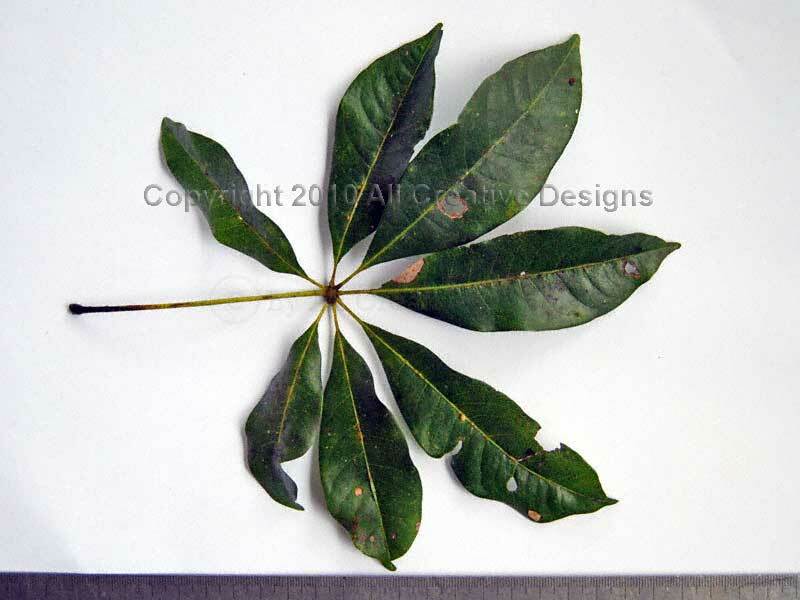 Leaf apex is short acuminate, base is attenuate. Fine lateral veins are visible and raised on the upper leaf surface, mid vein is raised to half the length of the lamina on the lower surface (5). Distribution: NSW mid-north coast to southern Qld. 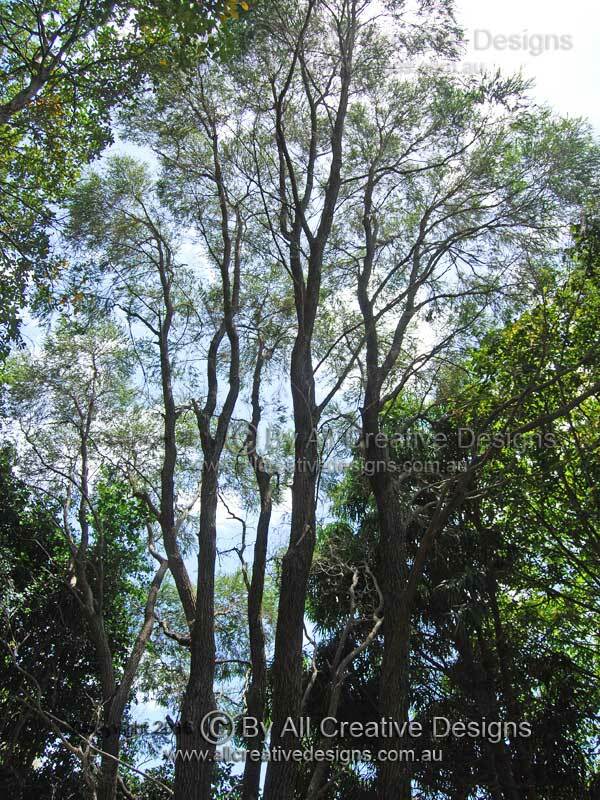 Depending on conditions, this handsome species is a tall shrub or small tree up to 10m in height. As the name implies this species prefers habitats in proximity to the coastline and occurs in remnants of littoral rainforests within subtropical areas, whereas in tropical regions it is also found in upland rainforests at a height of up to 900m (1). Bark is pale brown in colour with a relative smooth texture marked by fissures and small whitish ridges at the base of older specimens (2). 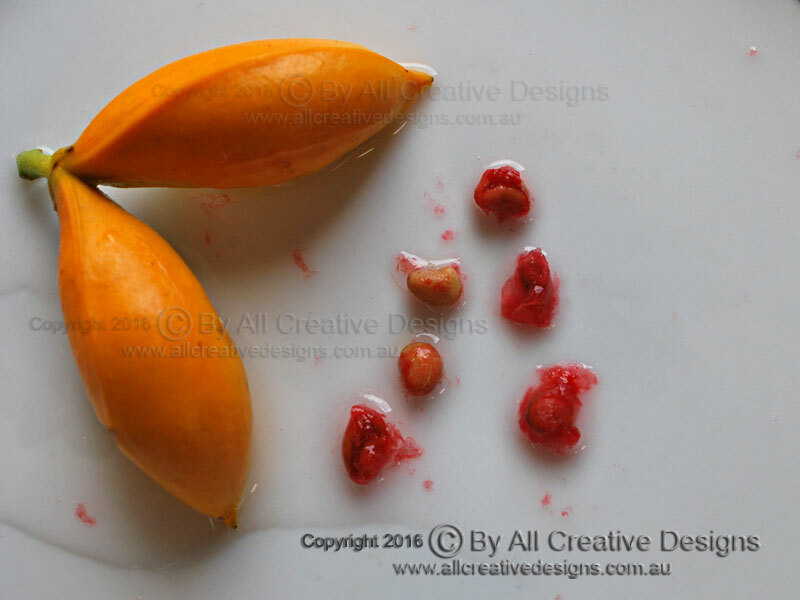 The brightly yellow or more orange coloured fleshy fruit (a drupe) is up to 12mm long and globose (rounded) or more obovoid (pear-shaped). Due to its extensive distribution range fruiting season stretches from winter to midsummer (3 & 4). 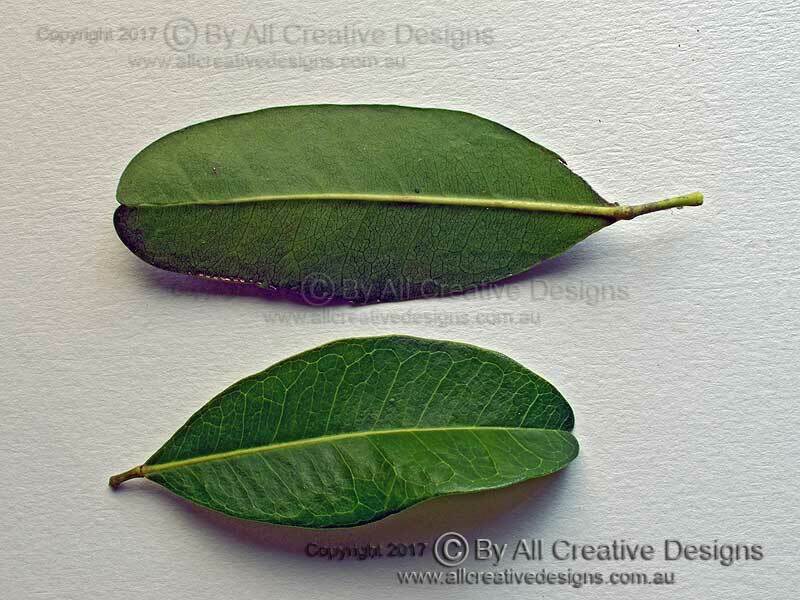 Simple (1-foliate) leaves with an opposite arrangement are; up to 12cm long, obovate to broadly elliptic in shape with entire margins, hairless, green glossy on top, paler beneath, rather thick, leathery and only faintly scented when crushed. A distinct swelling at the joint of the petiole (leaf stalk) with the lamina is typical. The leaf apex is notched and reticulate (looped) venation is more prominent on upper surface (5). Distribution: From the central coast of NSW to northern Qld. 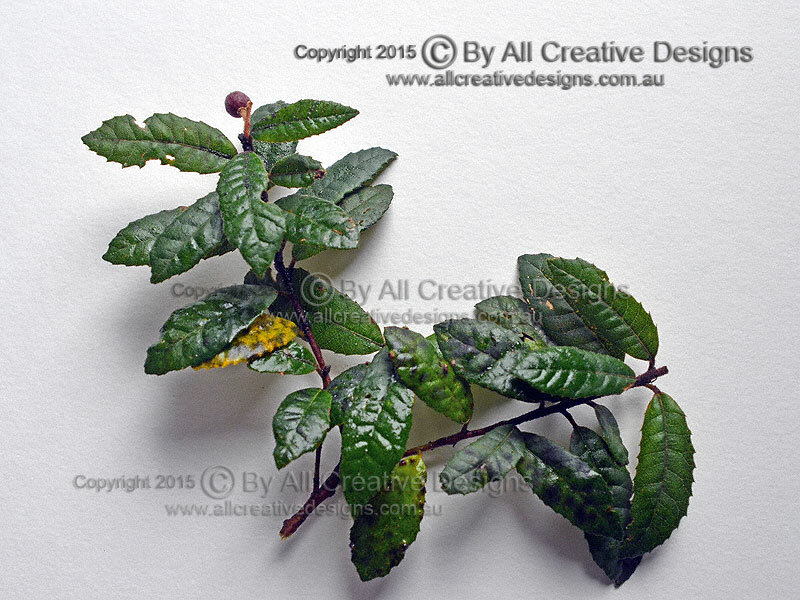 This native species is a shrub found in more exposed coastal positions and a small tree up to 12m high within sheltered littoral rainforests (Image 1). 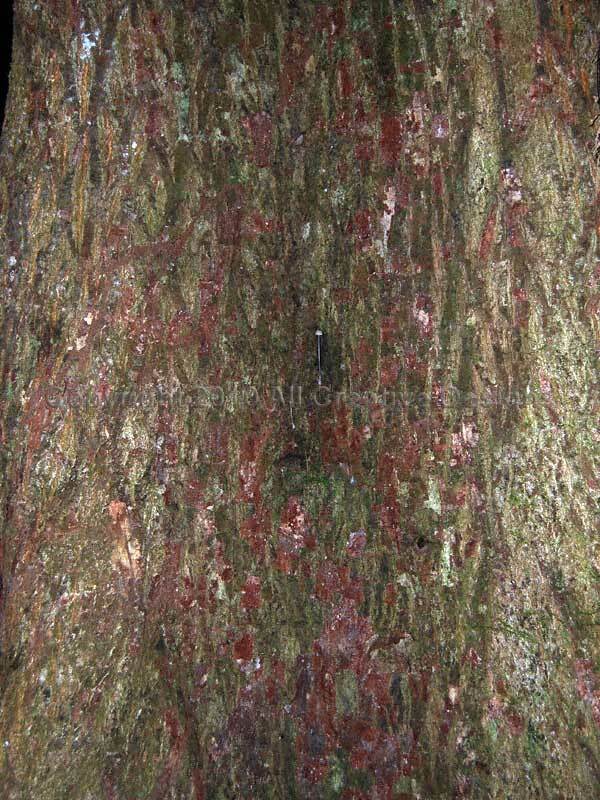 Bark is dark green to nearly black in colour with a smooth and firm texture (2). The fruit is; 2 to 5 lobed (mostly 3), up to 12mm across, finely hairy and a yellowish green in colour. Each lobe contains a shiny and hard black seed, which is partly covered in a red aril (3 & 4). 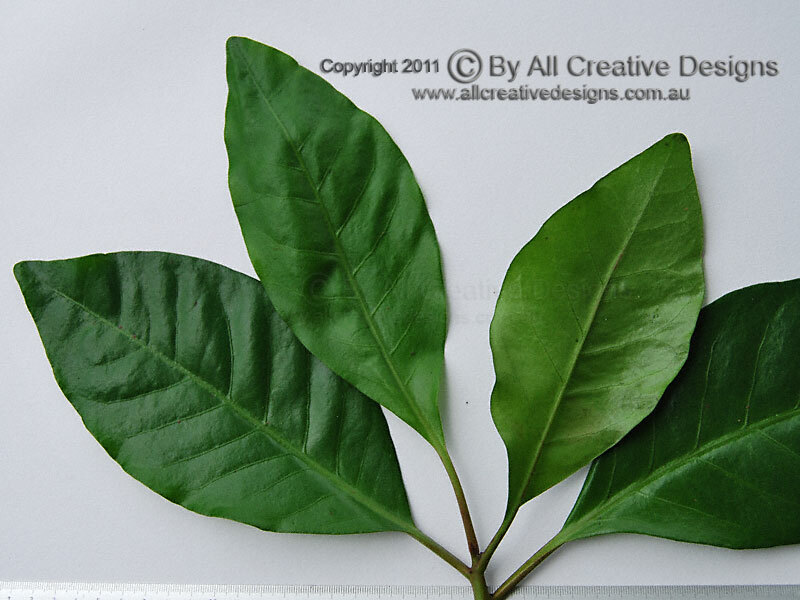 Compound leaves consist of 2, rarely 3 or 4 leaflets, which are; up to 14cm long, broad obovate to broad elliptic in shape with entire margins, hairless, smooth and slightly leathery in texture. Young leaflets are quite glossy turning dull with age and the lower leaflet surface is a greyish green. Leaflet apex is rounded or notched often with a tiny callous tip (mucronate), base shape is mostly cuneate. Venation is very noticeable with mid vein and laterals being raised on both surfaces (5). Distribution: Close to the beach from NSW mid-north coast to southern Qld. 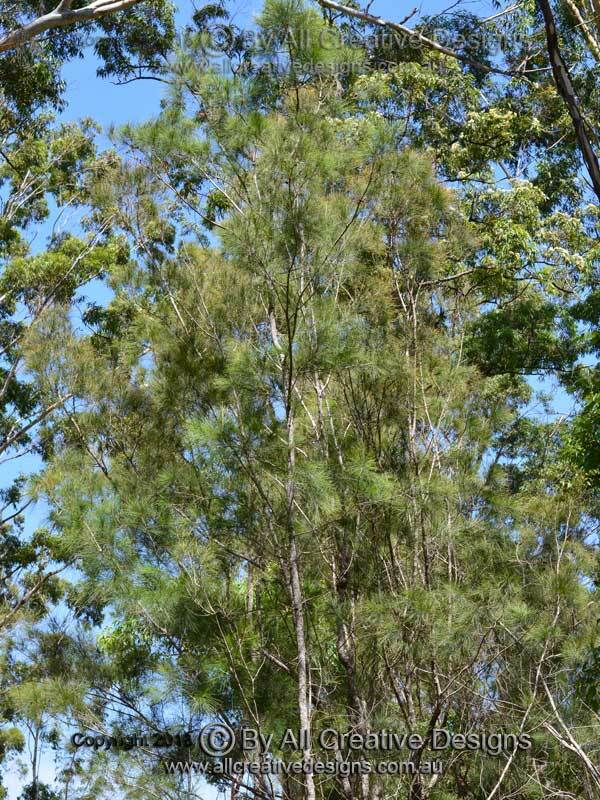 The Beach Casuarina or Beach Sheoak can reach a height of more than 20m, but is often smaller with a crooked and windblown trunk when growing in exposed locations close to the beach (Image 1). 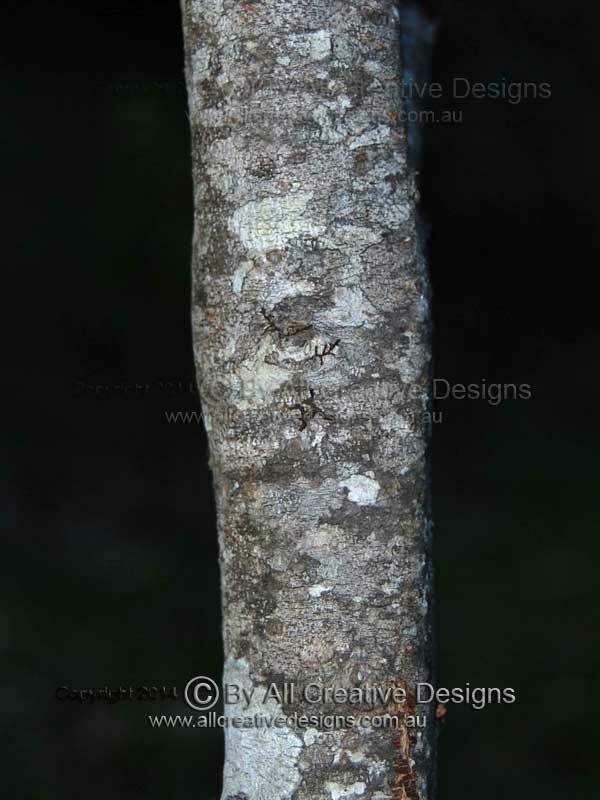 Bark is grey brown in colour with a hard and fissured texture on mature specimens; younger trees are more grey in colour with a smoother texture (Image 2). Attractive female flowers are pinkish red in colour and bloom from late winter into spring (3). 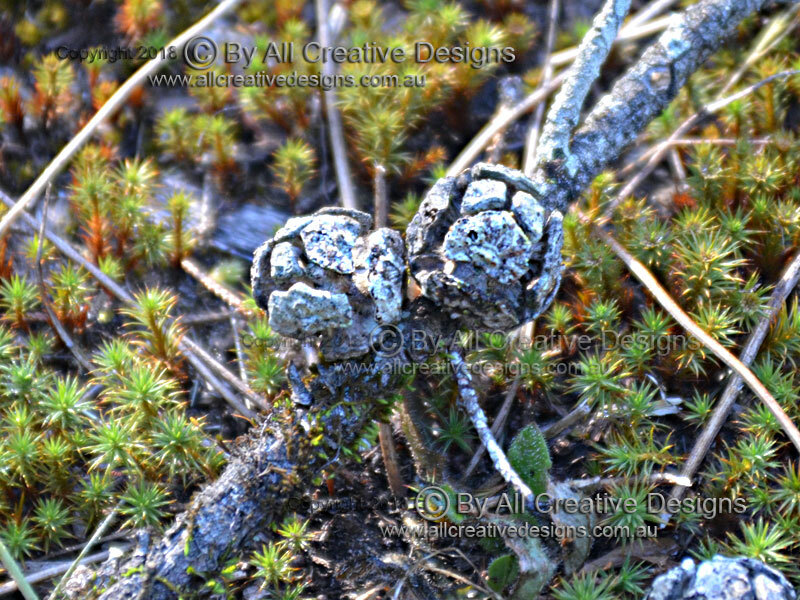 The woody and spiky cones are borne on stiff stalks and up to 12mm long, the image shows cones still maturing (4). 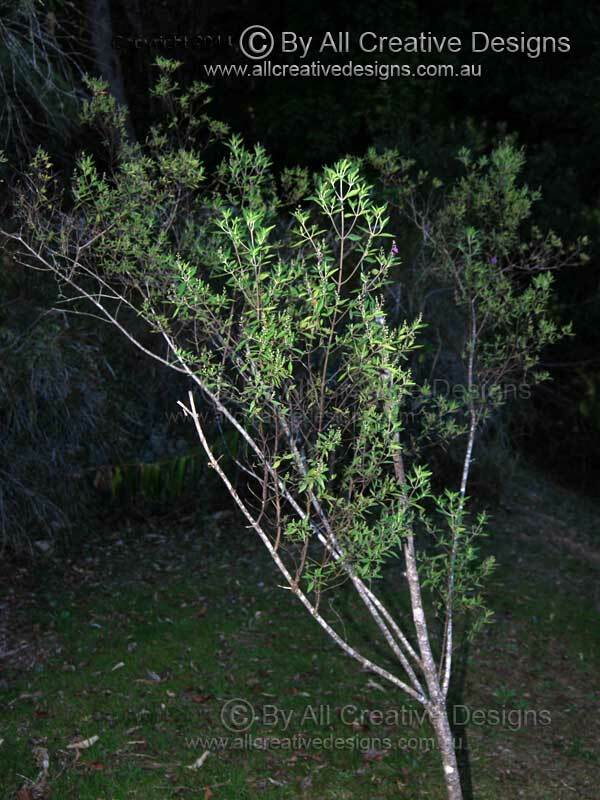 Branchlets with a weeping habit are fine, needle-like and reach 30cm or more in length. Pointed teeth-like leaves are minute, less than 1mm long and arranged in a whorl of 7 or 8 at internodes. A magnifying glass may be needed to observe them, but they are a reliable identification characteristic (5). Distribution: Coastal areas of NSW, Qld and NT. 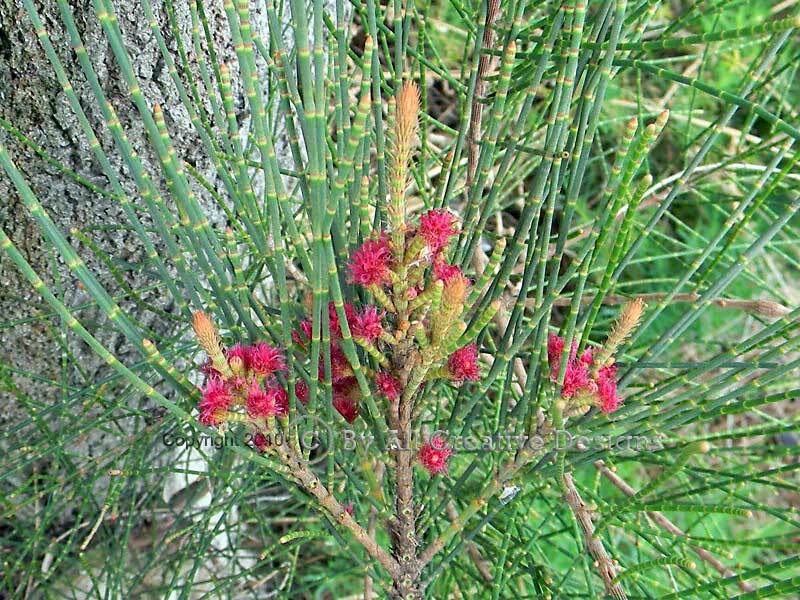 Note: See also River She-oak Casuarina cunninghamiana Page 9 and Forest Oak Allocasuarina torulosa Page 6. 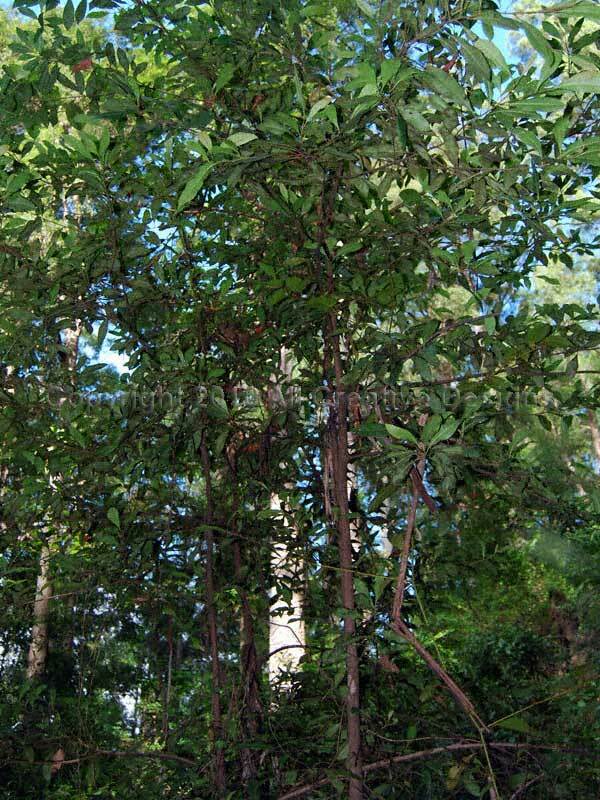 This small and densely foliated tree prefers wet habitats, such as tropical rainforests, marshes and banks of water courses. 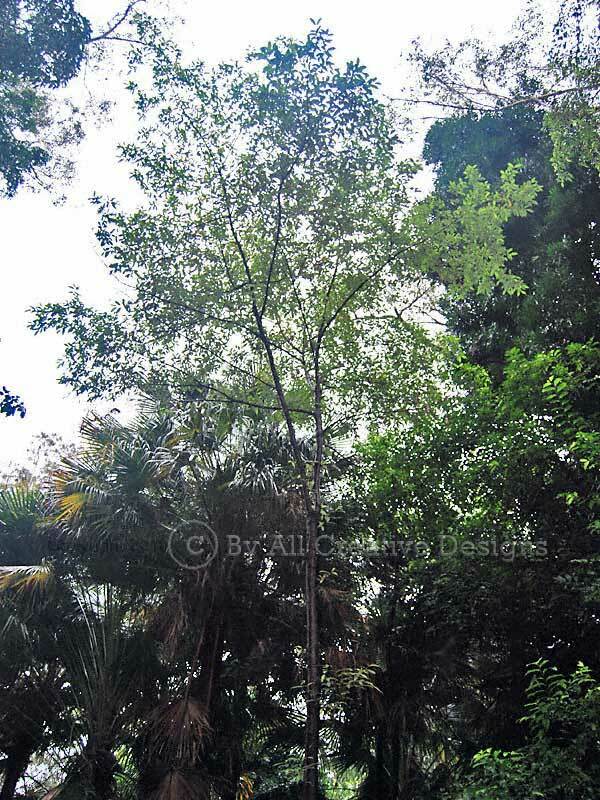 It is closely related and shares its common name with the White Beech Gmelina leichhardtii (Page 12), which is a stately tall tree found in subtropical rainforests only (Picture 1). Bark becomes rough and fissured on trunks and older branches. It is brown in colour, weathering to grey before shedding (2). The fleshy fruit (a drupe) changes from green over pink to a dark red at full maturity. It is less than 2cm long, obovoid (reverse egg-shaped) or more pear-shaped and contains a single rounded hard seed (3). 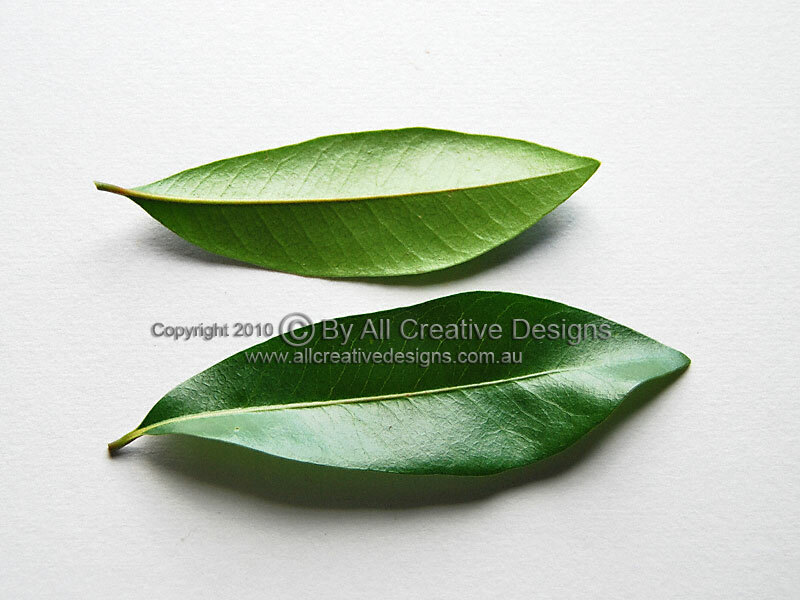 Simple leaves with an opposite arrangement are; up to 25cm long, broadly elliptic or obovate (egg-shaped) with entire margins, hairless, dark green above, pale whitish green beneath, rather thick and firm in texture. The mid rib, laterals and main net veins are sunken on the upper and prominently raised on the lower leaf surface. Two clearly visible glands at the base of the lamina (leaf blade) are a helpful identification feature (4 & 5). Distribution: Tropical north Qld. 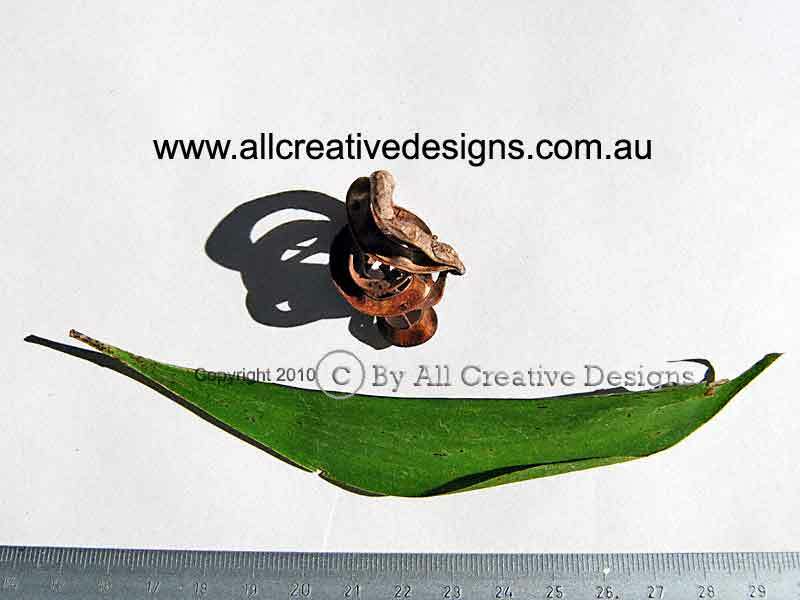 Descriptions and all images copyright ©2019 by www.allcreativedesigns.com.au world wide rights reserved. 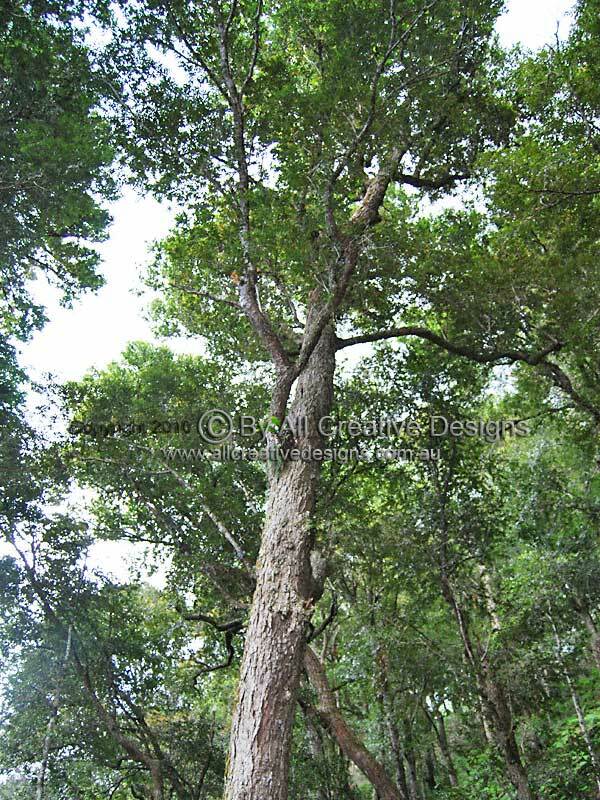 VISIT US ON FACEBOOK and if you like make a comment or tree identification query. 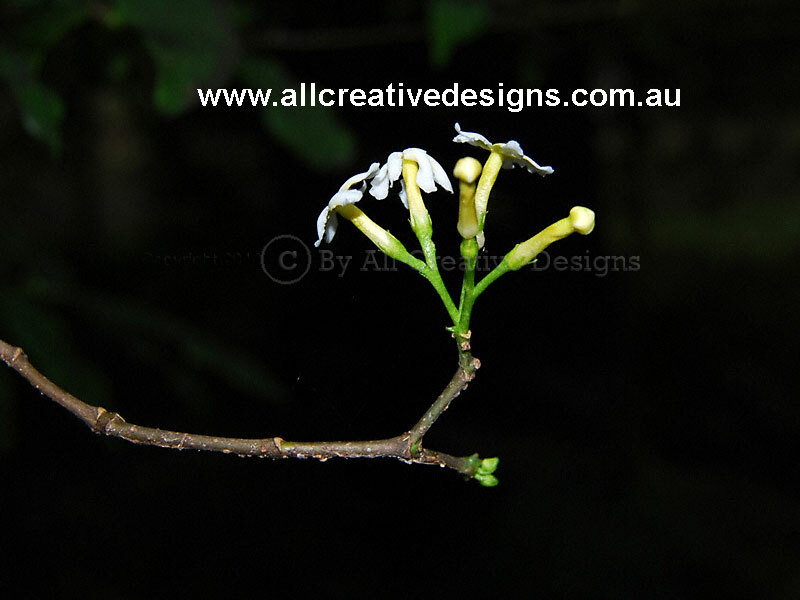 This interesting tree is the only species belonging to the family (NYCTAGINACEAE) in Australia and occurs in lowland subtropical and tropical rainforests. In cooler climates it reaches a height of less than 10m, whereas in tropical rainforests this species can be more than 20m tall. 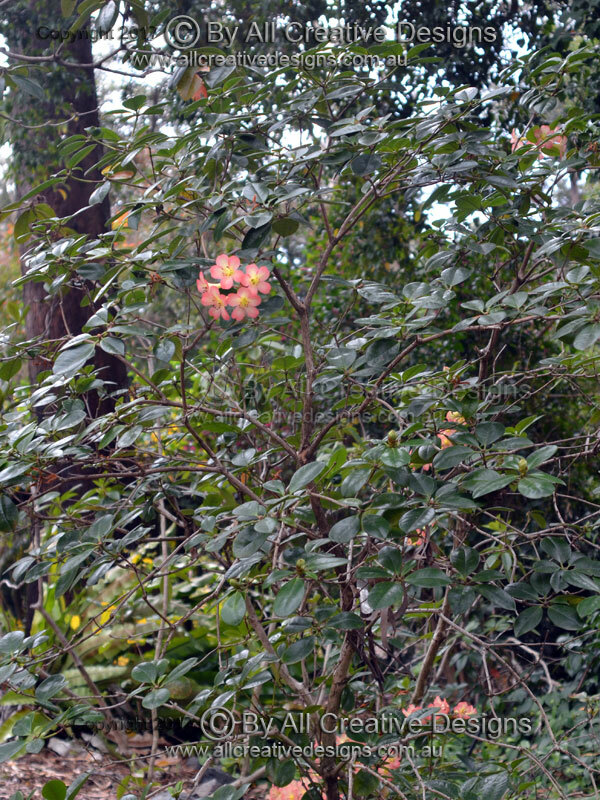 Mature specimens feature a sturdy trunk more than 50 cm in diameter and a compact crown (Picture 1). Bark is hard, firm and a light grey/brown in colour with vertical ridges and furrows on older specimens (2). 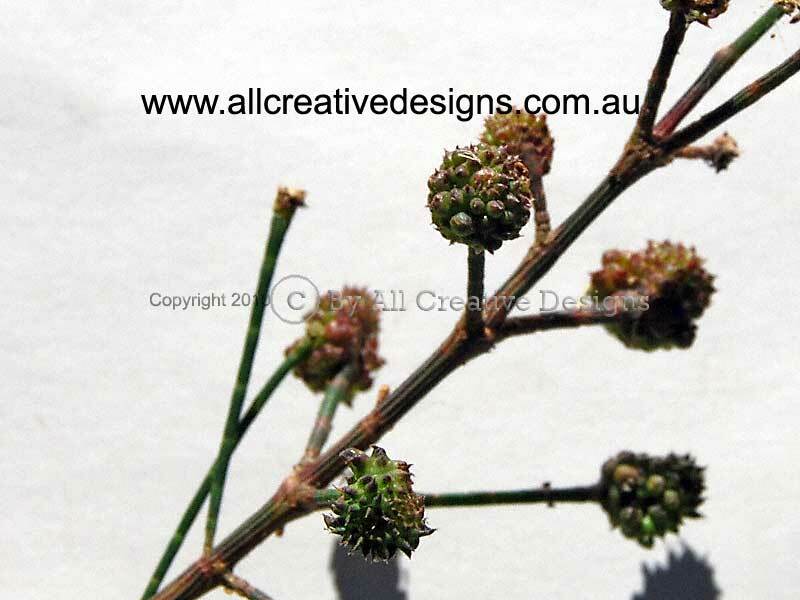 Flowers, measuring up to 10 mm long and 8 mm in diameter, are borne on large panicles. The flower is referred to as a perianth (no petals), here the calyx forms a cone-shaped tube before separating at the top and curving outwards, with calyx lobes (sepals) taking on the appearance of petals. Colour graduates from bright green at the base to off-white at the top. 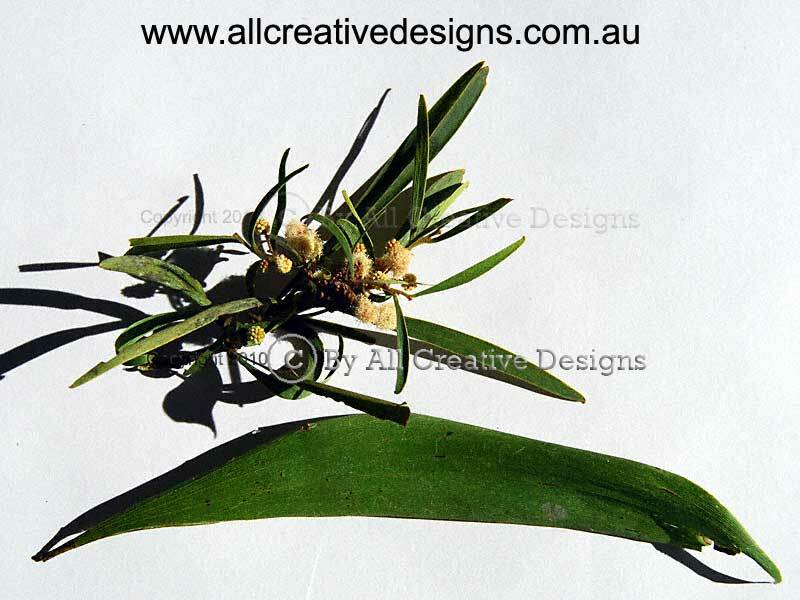 Anthers are pure white at first changing to a reddish brown with age (Picture 3 and inset). 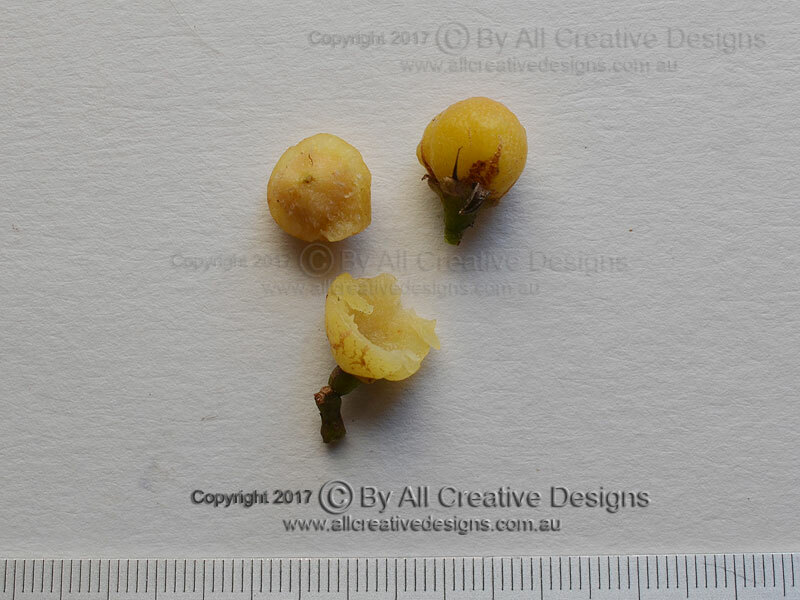 The fruit is a small nut enclosed by the remaining calyx tube, which is covered in a very sticky substance and up to 5cm long (4). 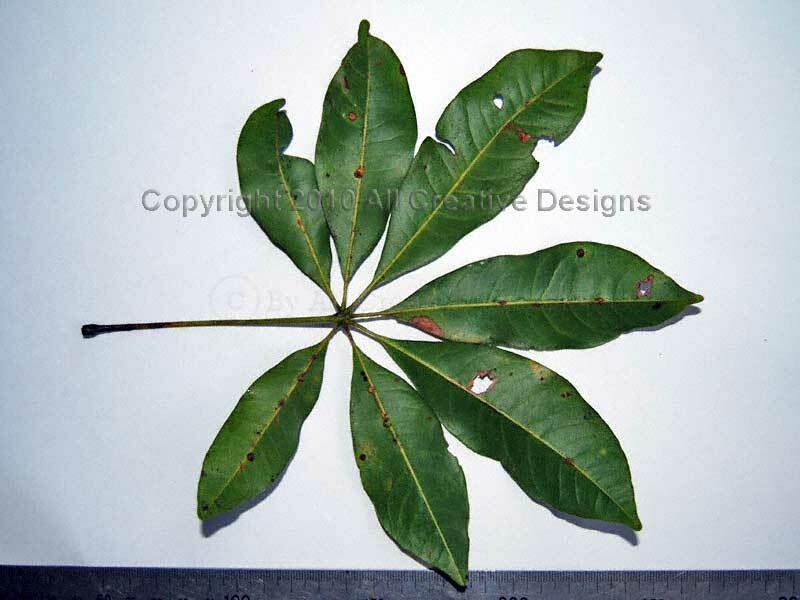 Simple leaves show a varied arrangement changing from a cluster (pseudo-whorl) to an alternate or sometimes opposite formation. They are; up to 25cm long (larger on saplings), mostly broad elliptic in shape with entire margins, hairless, glossy on both surfaces, paler green beneath, thick, smooth and polished in texture. Leaf apex is acute ending in a rounded point; base shape is cuneate. 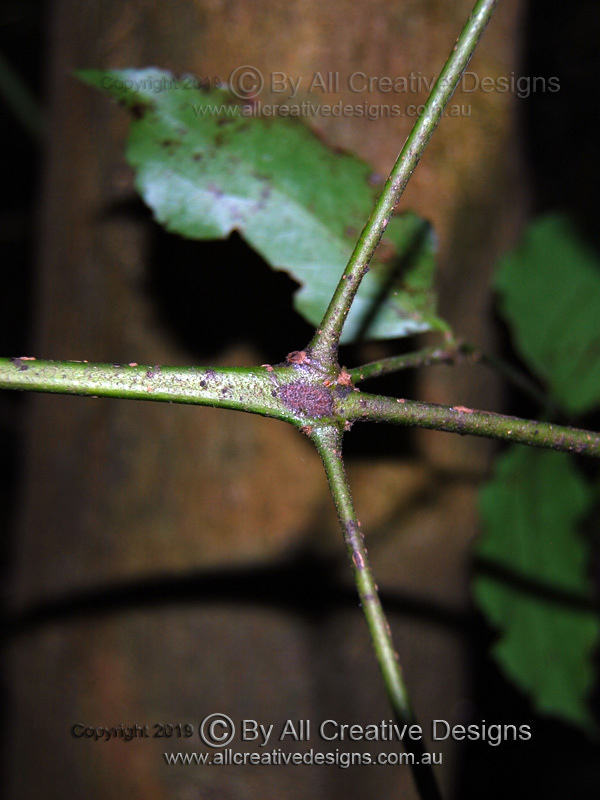 The strong petiole is up to 5cm long and turns purple on mature leaves (5). Distribution: From NSW south coast to north Qld. See Flower Identification and Leaf Characteristics Page for information on terms used. The largest specimens of the Black Apple are found on fertile soils within subtropical rainforests, where it can attain a height of 30m. 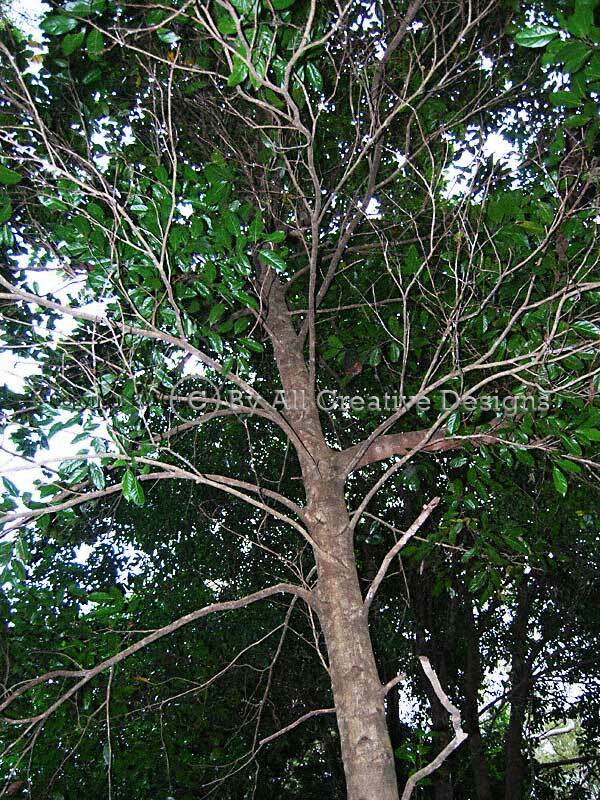 In dry rainforests it is a smaller tree less than 20m tall (Image 1). A beautiful fluted trunk is a prominent feature of mature trees. 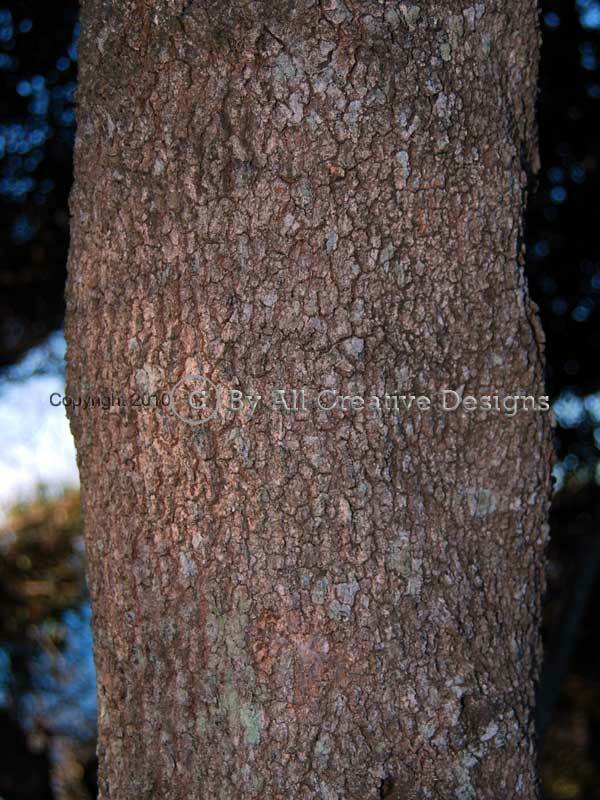 Bark is a reddish brown colour and has a finely rough texture (2). Pale green flowers are held on individual stalks up to 3cm long (between 2 to 4 per axillary bud). Flowers are cylindrical in shape, measure about 10mm across when fully opened and bloom over spring (3). The fleshy fruit (a berry) is more plum than apple-shaped, up to 5cm across and 8cm long. 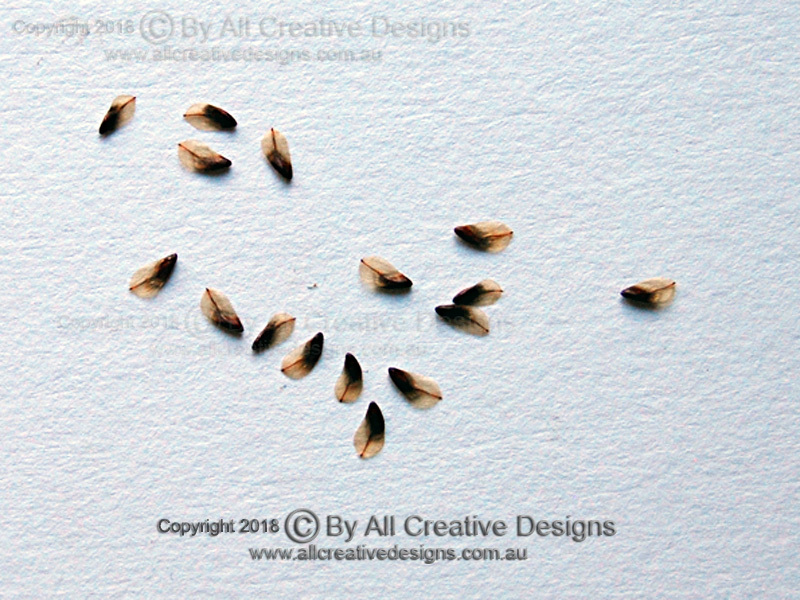 Almond shaped seeds are shiny dark brown and between 3 to 5cm long. 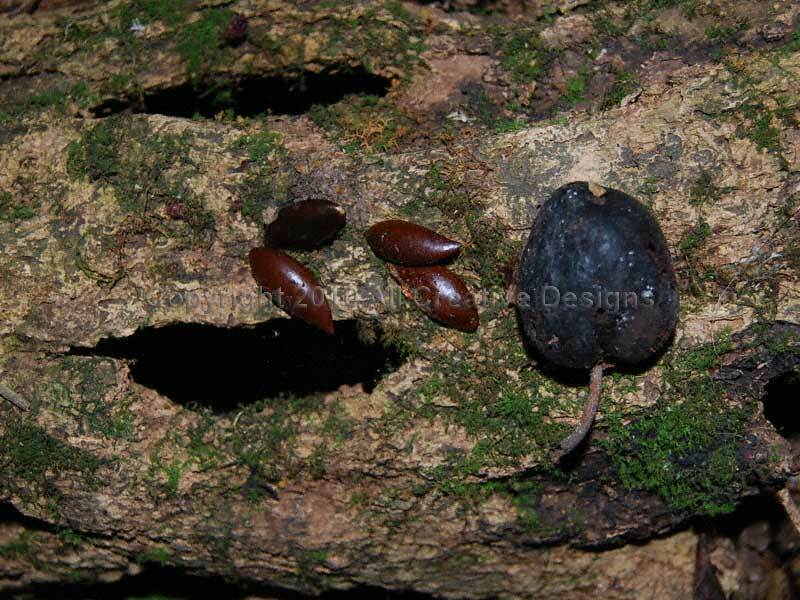 Fruit and seeds found lying on the forest floor are a helpful identification feature (4). Simple leaves with an alternate arrangement are; up to 15cm long, oblanceolate (reverse lance-shaped) to narrow obovate (reverse egg-shaped) with entire margins, hairless, dark green and very glossy on top, paler but also shiny beneath, rather thick with a firm and smooth texture. Petiole (leaf stalk) is grooved on top, 1 to 2cm long, and may exude a little white sap when broken, which is more likely on new growth. The leaf venation except for mid vein is rather faint (5). Distribution: from the NSW central coast to central Qld. 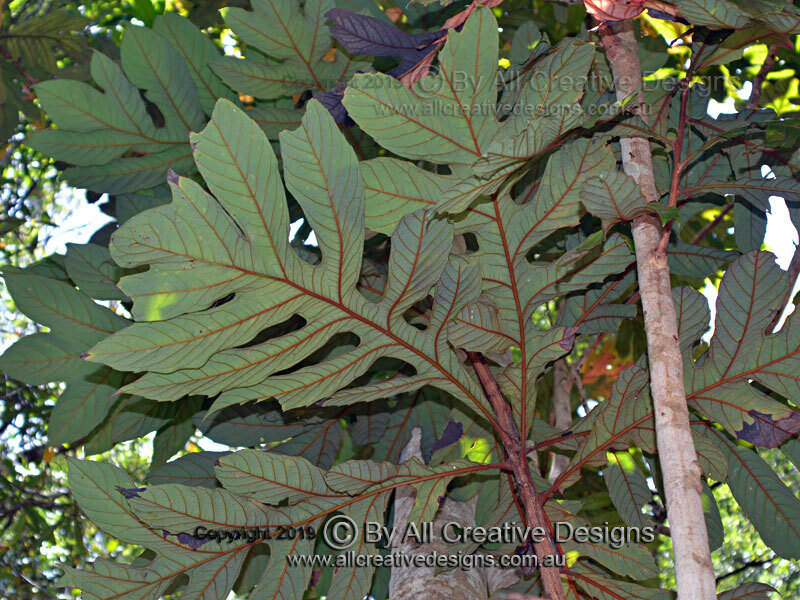 The Black Bean is a tall tree that inhabits subtropical and tropical rainforestsand favours locations along watercourses. 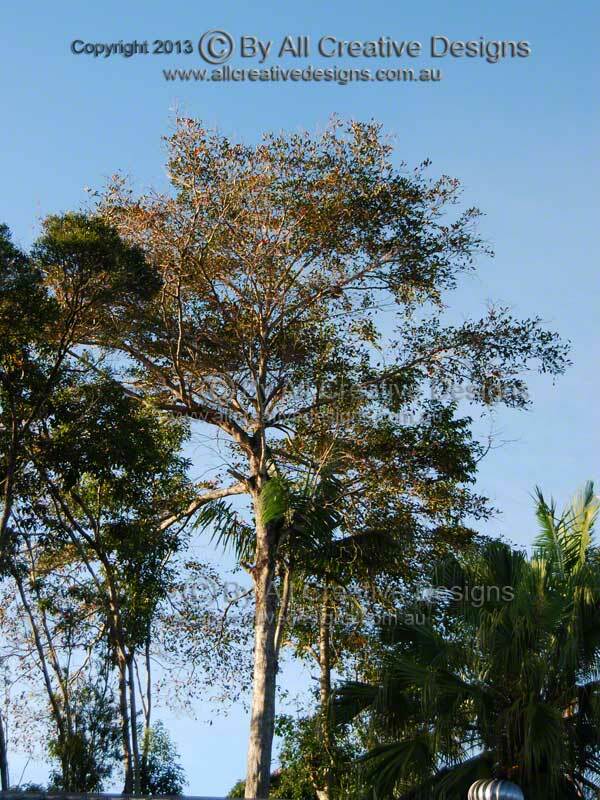 It is grown in forest plantations for its valuable timber and often seen as an ornamental street tree (Images 1 & 2). 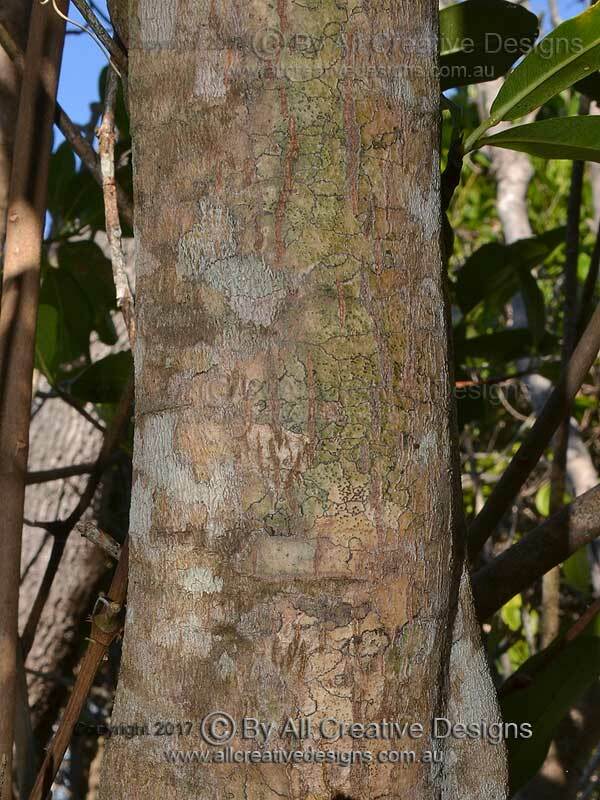 Bark is dark brown to grey on mature and greenish grey on juveniles trees, with vertical markings (3). 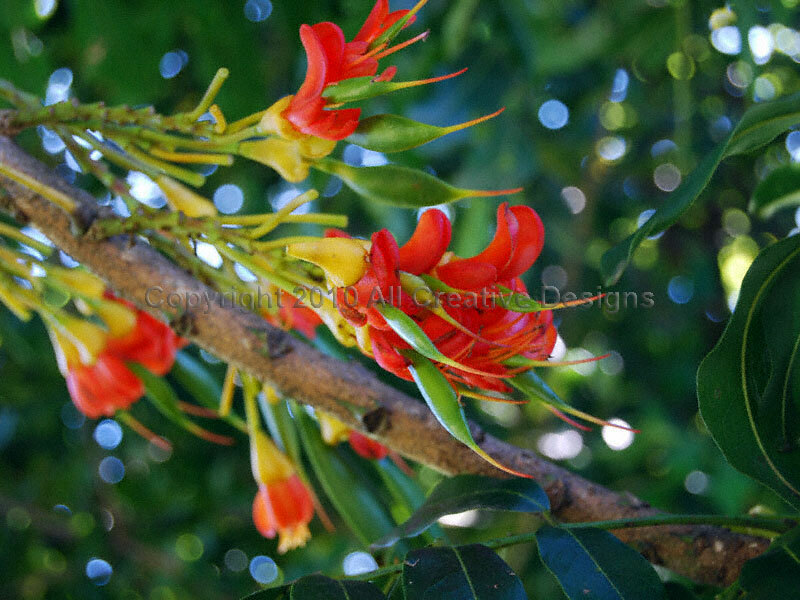 The very attractive red and yellow coloured flowers are up to 4cm long and bloom over spring. They are typical for the pea & bean family (FABACEAE) (4.) 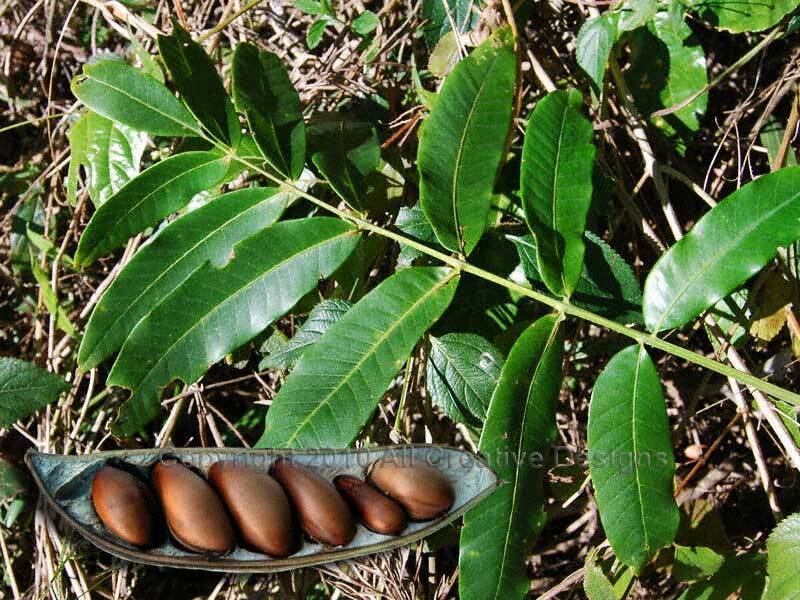 Pinnate compound leaves consist of 15 to 19 large leaflets, which are; up to 18cm long, lanceolate to oblong in shape with entire margins, hairless, firm and smooth in texture. The fruit is a very large pod more than 30cm long, which contains 2 to 6 large brown seeds (5). Distribution: From the north coast of NSW to north Qld. 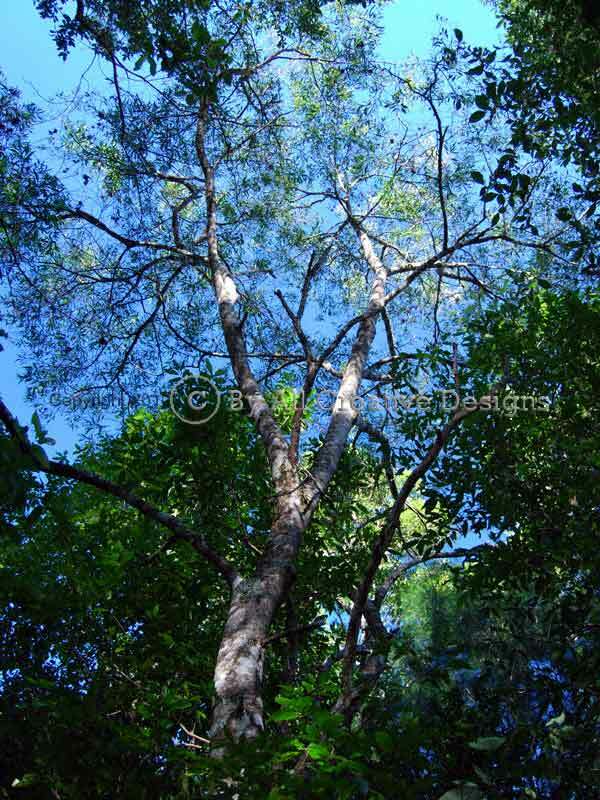 This giant subtropical rainforest tree can reach heights of more than 50m. 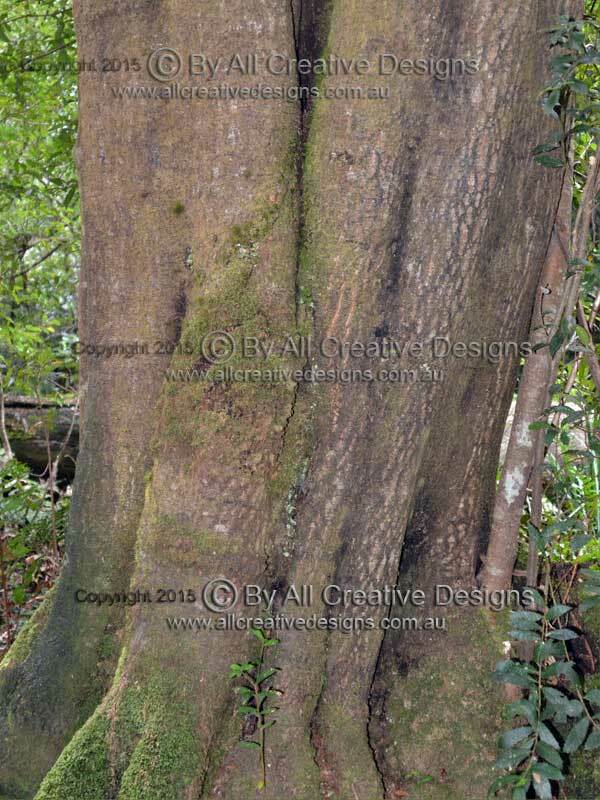 Older specimens develop extensive buttress roots and a column like trunk up to 2m in diameter (Image 1). 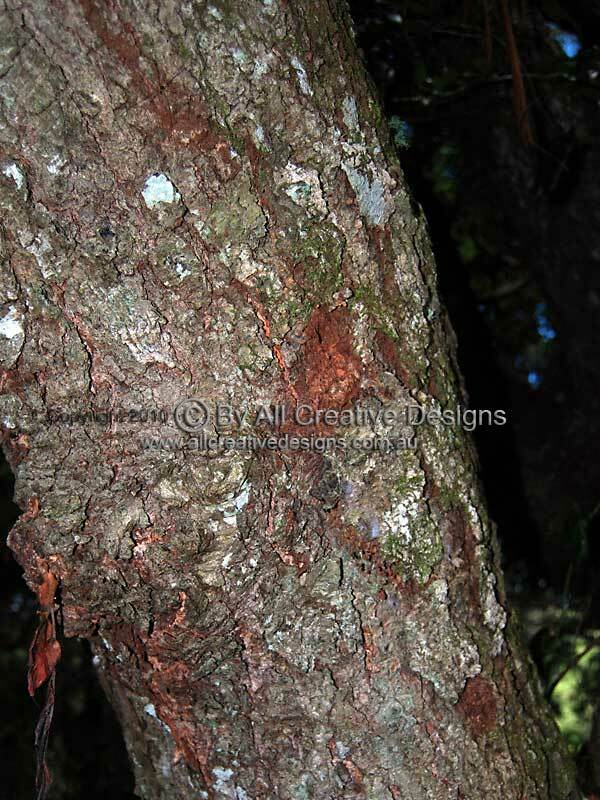 Bark is a dark reddish brown colour and has a scaly texture with shallow fissures. 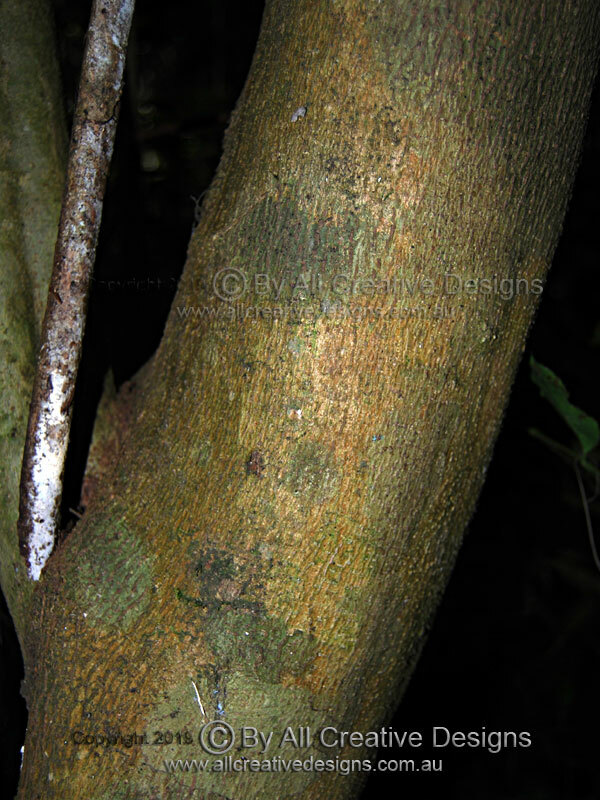 Its close relative, the White Booyong (A. trifoliolatum) has firmer and deeper fissured bark (2). The distinct foliage, consisting of large palmate compound leaves, is a feature when identifying this species (3). Leaves with an alternate arrangement feature 7 leaflets (sometimes 9), which are; up to 20cm long, oblanceloate (reverse lance-shaped) or obovate (reverse egg-shaped) with entire margins, dark green and semi glossy on top, mid-green below, hairless and strong in texture. Apex is acute, leaflet base shape is attenuate. The prominent petiole (primary leaf stalk) is rigid and up to 15cm long, petiolules (leaflet stalks) are up to 2cm long (Photos 4 & 5). Distribution: NSW central coast to Qld. 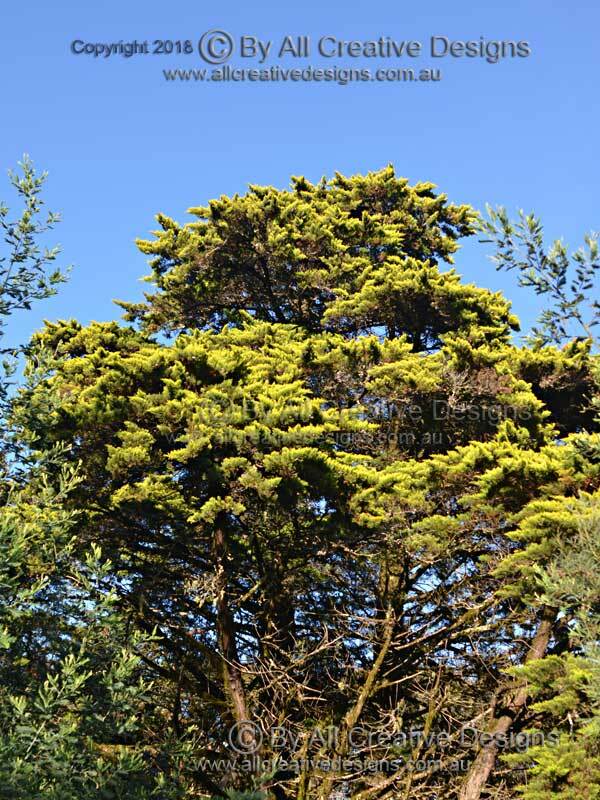 This attractive conifer tree reaches a height of up to 20m and features a characteristically dense and spreading canopy. 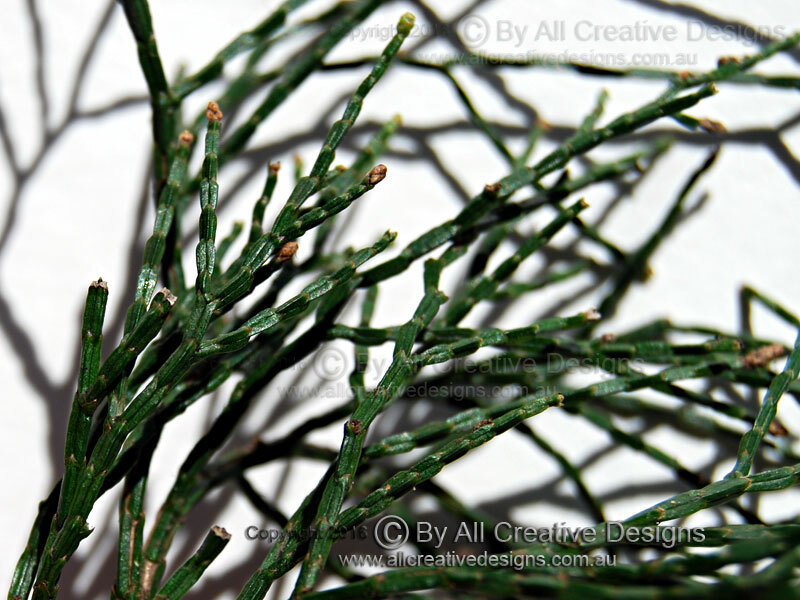 The Black Cypress Pine is an abundant and widely distributed tree, which inhabits woodlands and open Eucalypt forests. It prefers to grow in rocky terrain, ranging from coastal areas to the tablelands at higher altitudes (Image 1). 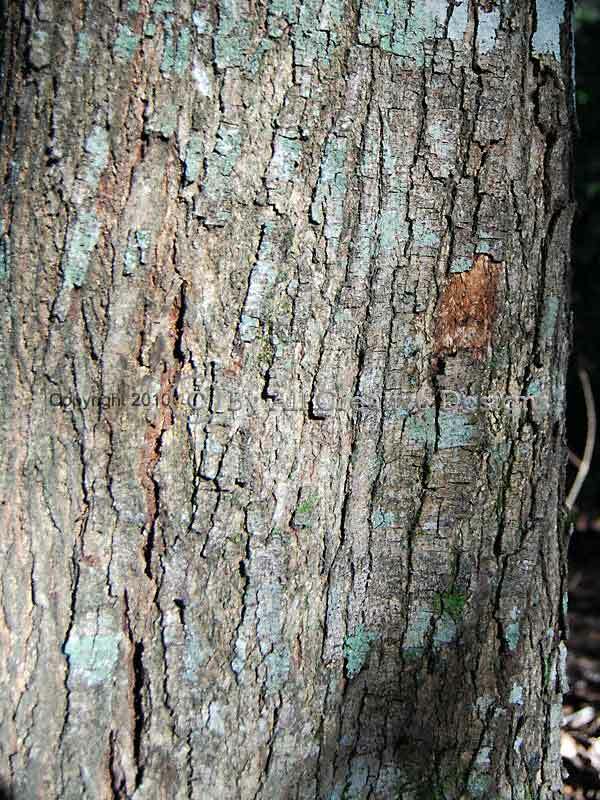 Bark is brown, weathering to grey, and on the base of older trunks becomes very rough and fissured (2). 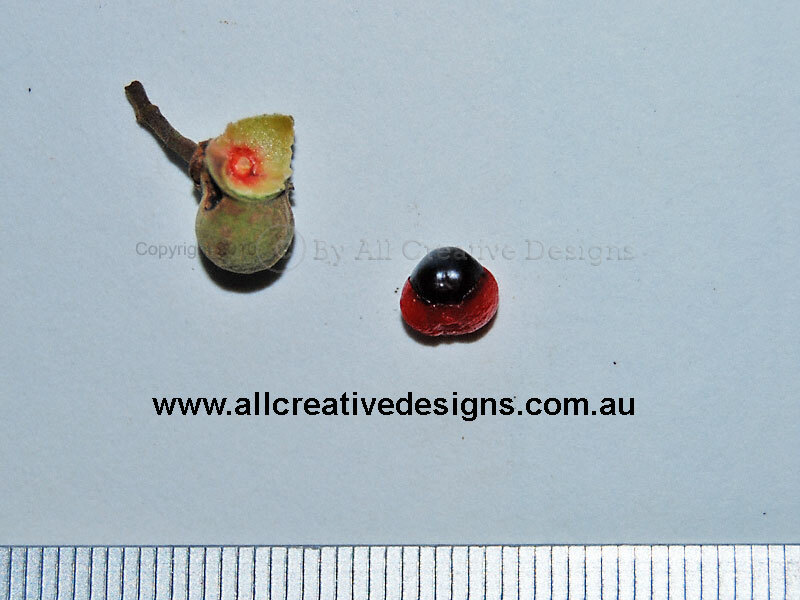 The woody female cone is globe-shaped and measures up to 20mm in diameter. Typically, it splits into 4 to 6 valves (or cone scales), which show a prominent protrusion on the outer surface. The stem in the centre of the cone, called the columella, is distinct for this species and separates into 3 free parts at the apex (3 & 4). The tiny and closely spaced scale-like leaves appear in whorls of 3. 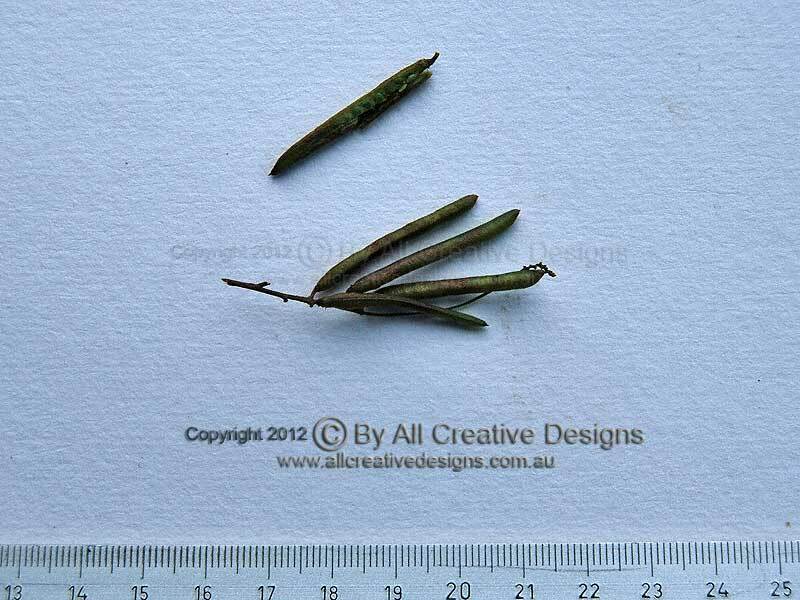 They are 2 to 3mm long, dark green and terminate in a blunt tip (5). Distribution: Vic., NSW and Qld. 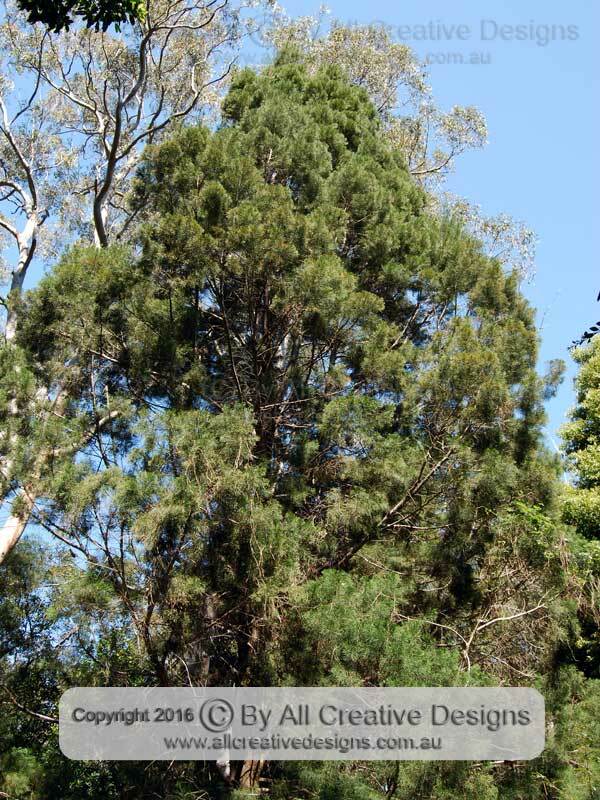 Use the Botanical Species List to locate related species under the genus Callitris. See Flower Characteristics Page and Leaf Characteristics Page for explanations of botanical definitions and concepts. 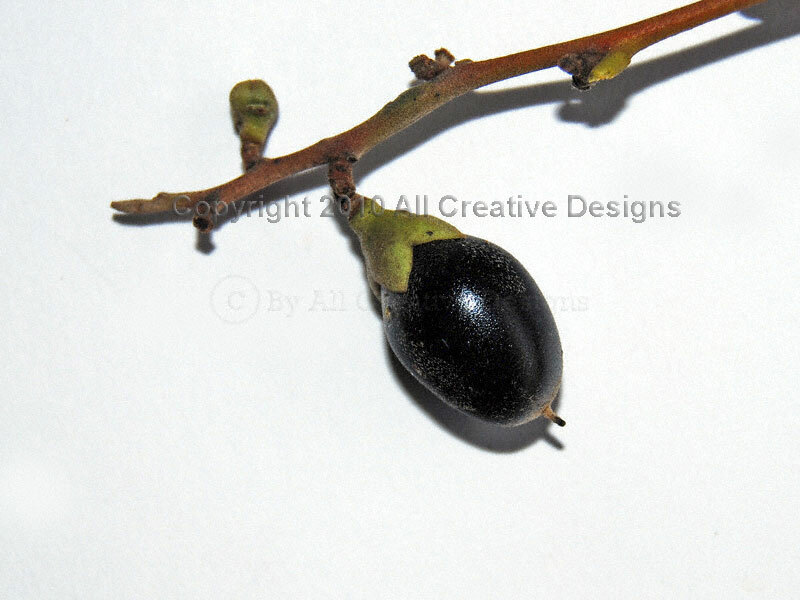 The Black Plum or Yellow Persimmon is a small to medium sized native tree species found within and on margins of different types of rainforests (Image 1). Bark on mature specimens is firm, light grey to beige-brown in colour and shows fine horizontal ridges. 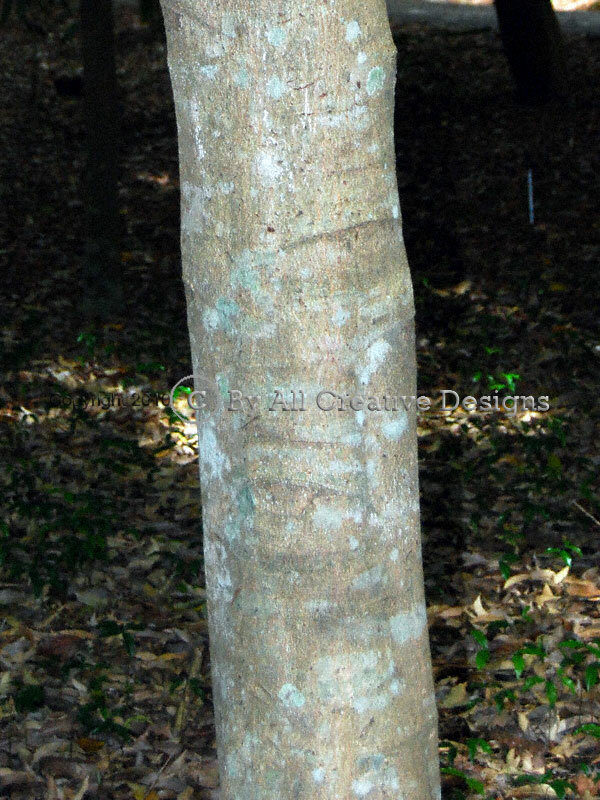 Immature trees feature a dark grey coloured bark with a smooth texture (2). 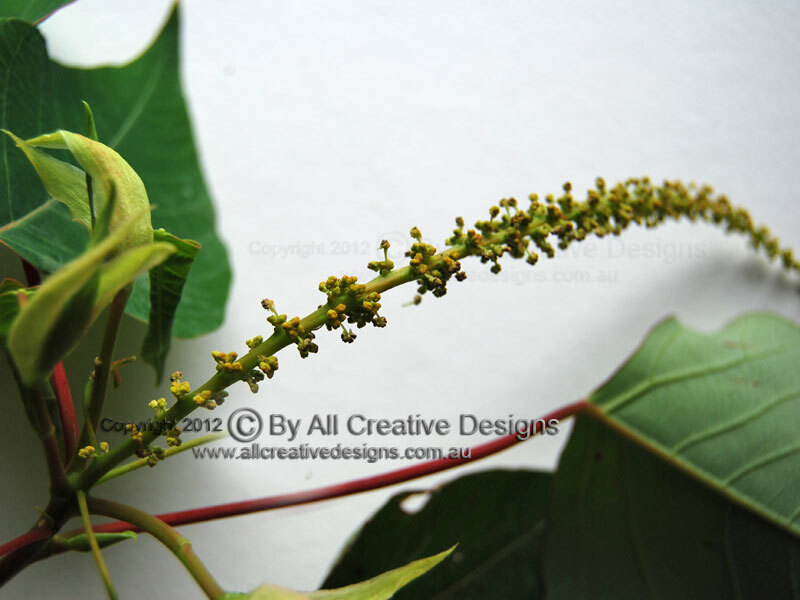 Female flowers emerge solitary from leaf axils (axillary buds), are yellowish green and up to 8mm long (3). The fruit is a shiny black berry; up to 20 mm long with dark plum like fruit flesh surrounding a single brown oblong-shaped seed (4). An alternate leaf arrangement with regular spacing between leaves and a zigzag shape of young branches are typical traits. 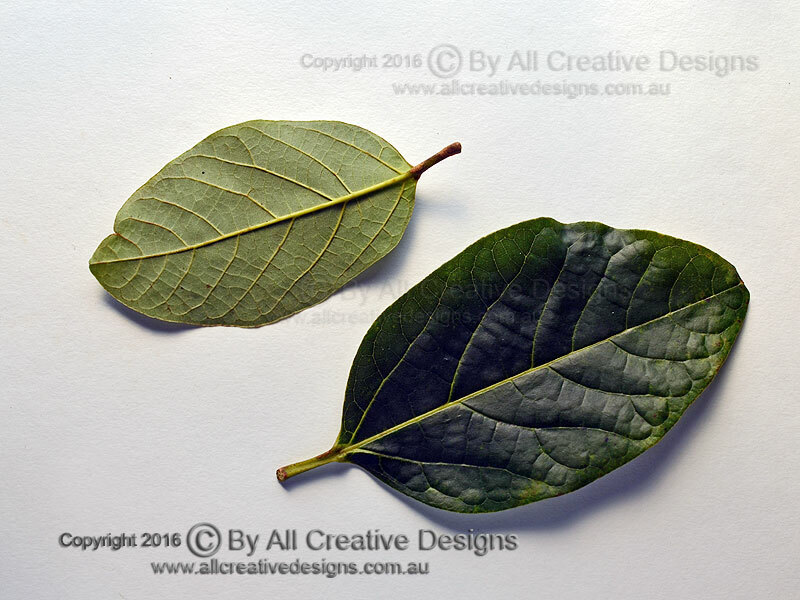 Simple leaves are; up to 8cm long, elliptic to lanceolate in shape with entire margins, dark green and glossy on the upper surface, dull yellowish green and sparsely hairy beneath, firm and strong in texture (5). Distribution: NSW south coast to north Qld. 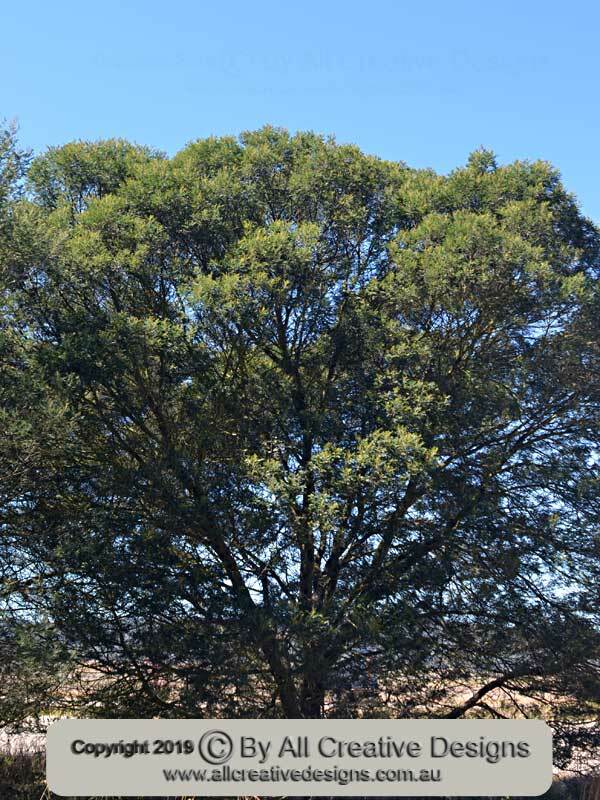 The Black She-oak is a hardy species that is able to flourish on sandy and impoverished soils in environments which are regularly exposed to fires. It reaches a maximum height of 15m and inhabits open forests and woodlands, not only in proximity to the coast (littoral) but also at higher altitudes on the tablelands (1). 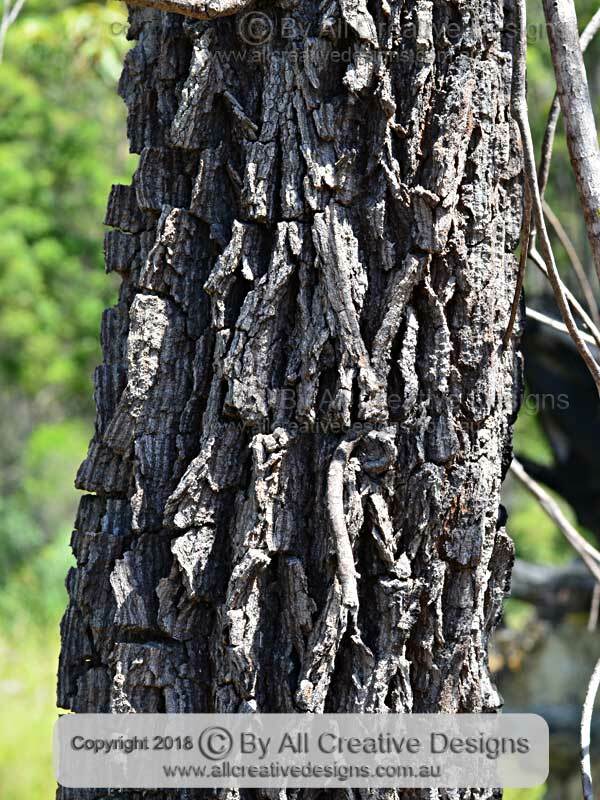 The deeply fissured bark is brown or black, hard, brittle (when dry) and provides some protection from fires (2). This species is dioecious, meaning that male and female reproductive organs are borne on separate trees. 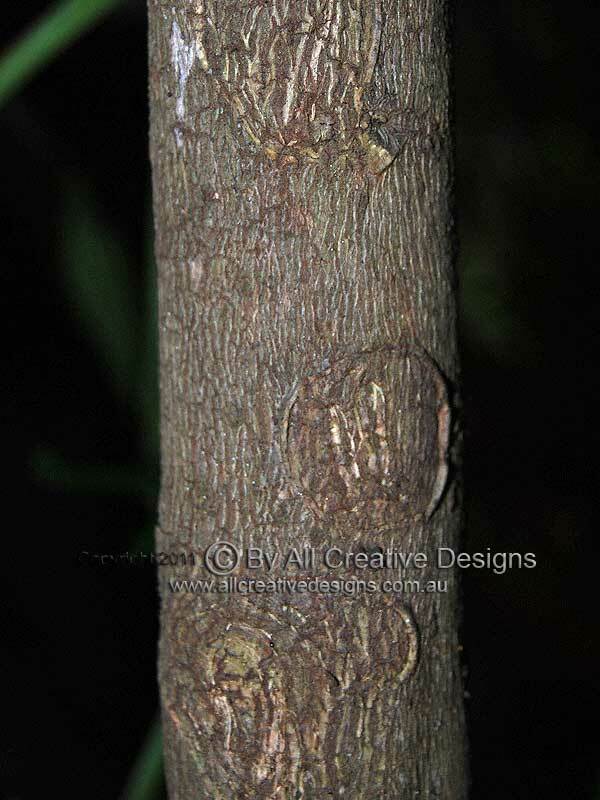 The female tree produces a barrel-shaped woody cone up to 30mm long and up to 20mm wide. The cone features rows of valves that open to release numerous dark brown and winged seeds (3 & 4). The thin and grooved branchlets measure only 1mm in diameter and reach a length of 20cm. The minute tooth-like leaves appear in a whorl of 6 to 8, at internodes (articles) up to 10mm apart (5). Distribution: Widespread in Vic., NSW and Qld. 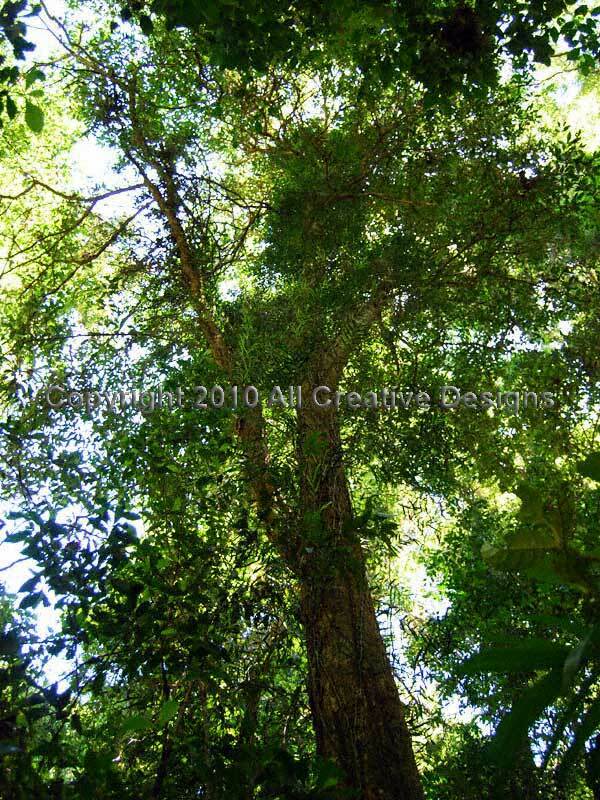 Note: The similar Forest Oak (Allocasuarina torulosa) is shown on Page 6. This species with a very wide distribution range across Australia has adapted to different habitats, ranging from dryer inland regions to margins of rainforests. Best development occurs along stream banks and in other damp locations, where specimens compete for light in a forest situation. Under these conditions trees can reach heights of more than 15m. 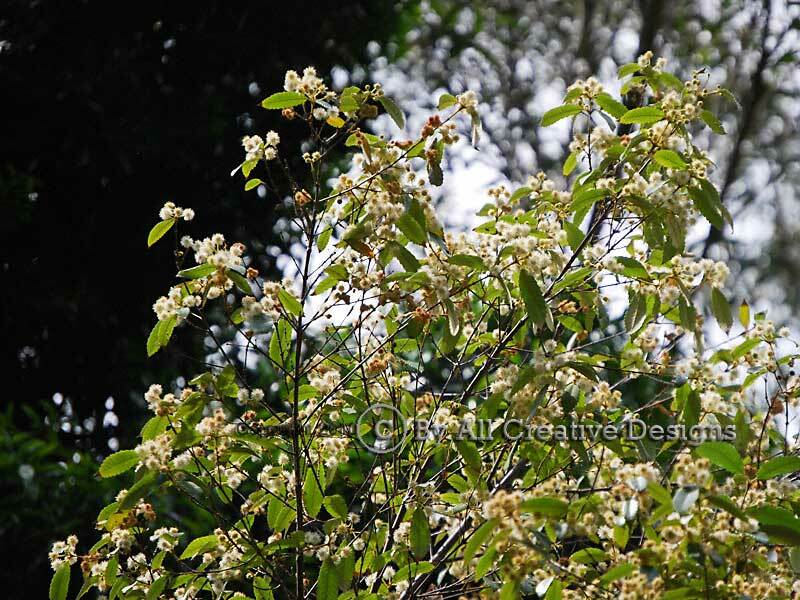 This species is a popular tall ornamental shrub with a number of cultivars in existence (Image 1). 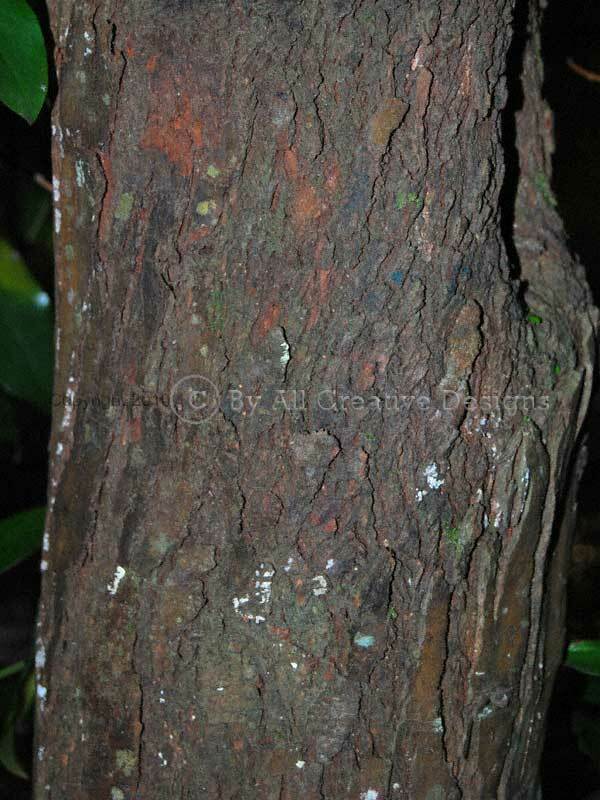 Bark is brown in colour, deeply fissured or more furrowed with a hard rough texture (2). 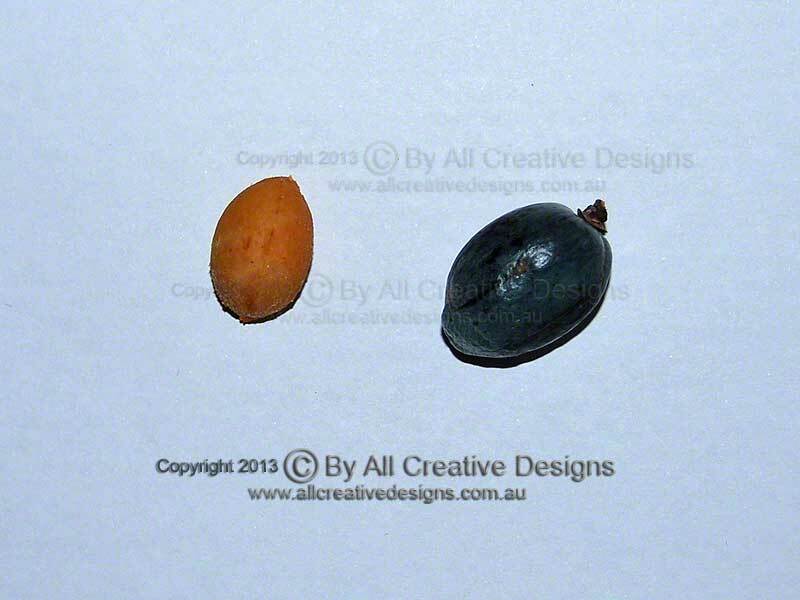 The tiny hard (woody) fruit (a capsule) splits at the apex to release very fine light brown-coloured seed. Capsules form tight clusters around stems and are sessile (attached without a stalk). They are up to 3mm long and feature 5 persistent pointed calyx lobes at the apex (3). 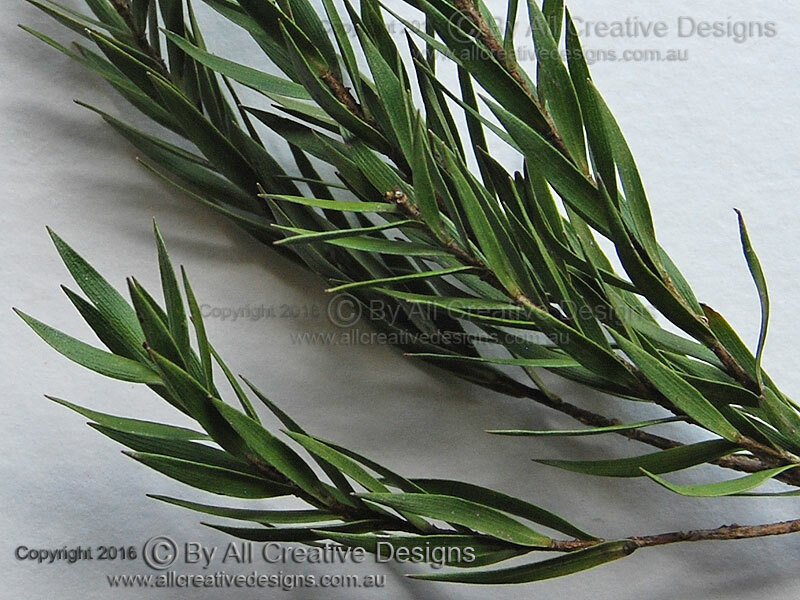 Simple leaves with an alternate arrangement are; up to 2.5cm long, lanceolate (lance-shaped) with entire margins, hairless (when mature), firm in texture and scented when crushed. Leaf apex ends in a sharp tip; base is rounded and attached to the stem without a petiole (leaf stalk). Longitudinal venation is visible on both surfaces. Distribution: Northern NSW, Qld, NT, SA & WA. 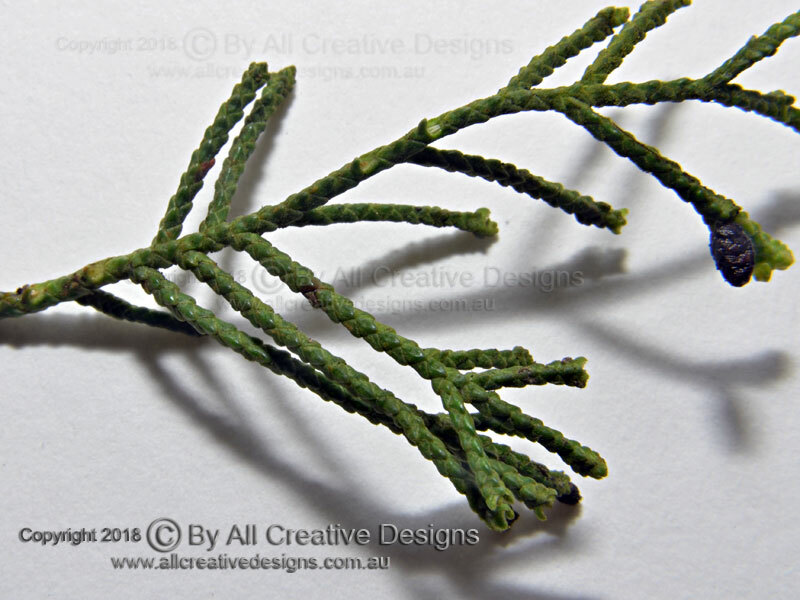 Note: This species is similar in appearance to a Bottlebrush (Callistemon species), but differs in that veins on the lamina run parallel, whereas Callistemon species are more likely to have a pinnate vein arrangement. 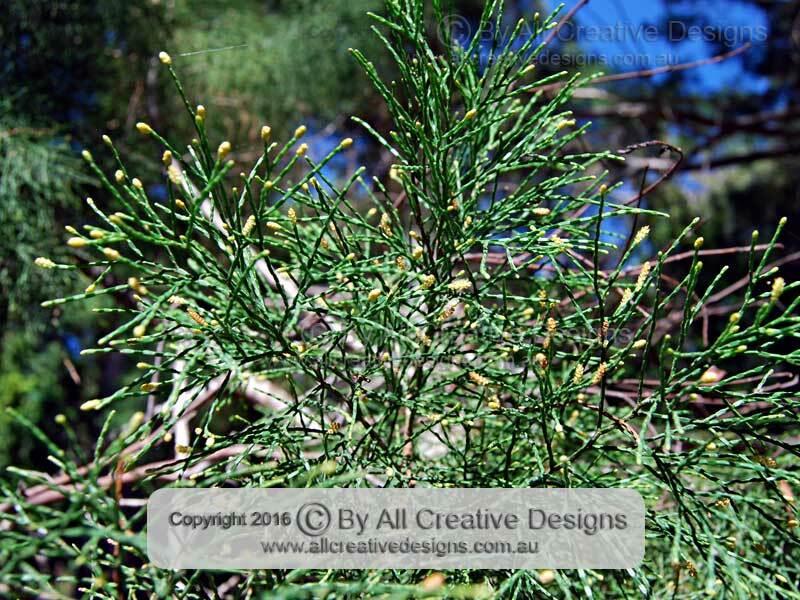 The handsome appearance, adaptability and hardiness have made this Acacia species a popular ornamental tree, which subsequently naturalised in many parts of Australia and throughout the world. 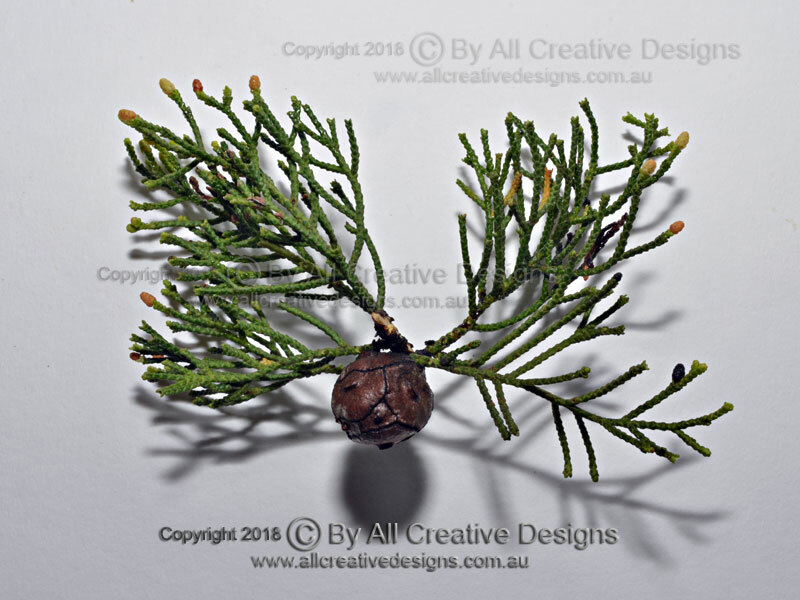 It is a small tree up to 10m tall (more exceptional specimens may reach 15m) and inhabits open Eucalypt forests, woodlands and regrowth areas including roadsides and wastelands. 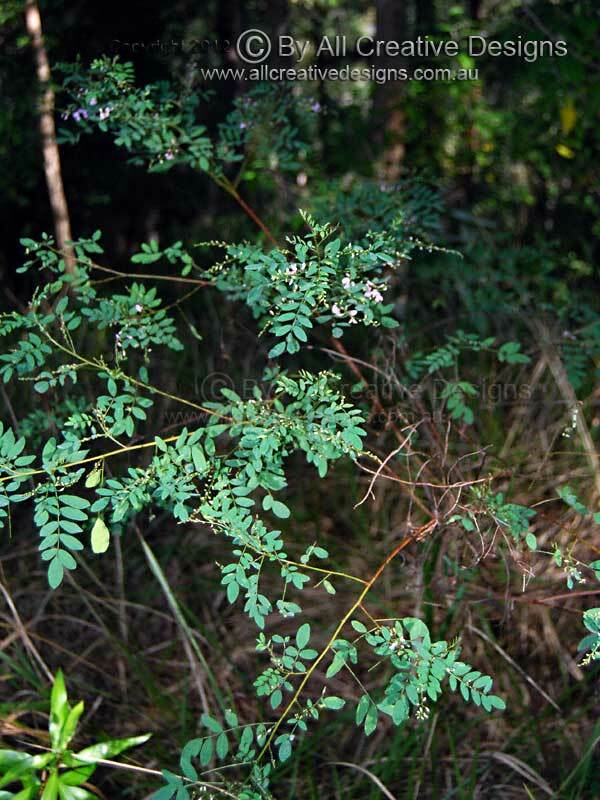 It is known by various common names, some of which are also used for other Acacia species and for the unrelated Callicoma serratifolia, shown below (Picture 1). Bark on the trunk of older trees becomes brown or blackish and fissured, whereas bark on branches and young trees is rather smooth and green (2). 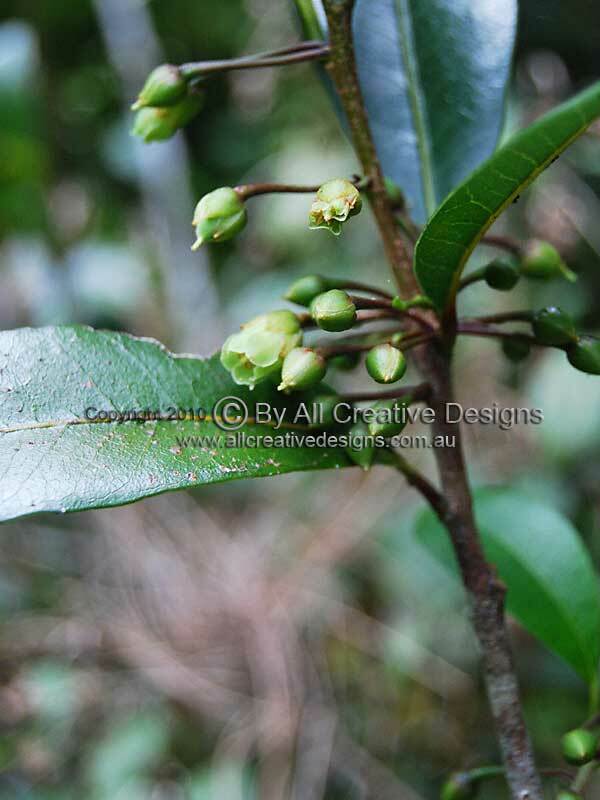 The flattened pods are up to 10cm long and contain shiny black-coloured seeds (3). The yellow rounded flower heads (shown before opening) are borne on racemes or sometimes on panicles. The bipinnate (twice divided) compound leaves feature petioles (leaf stalks) that continue along branchlets as distinctive ridges (decurrent) (4). Circular glands (red circle) are visible at the base of pinnae ('leaf branches'). 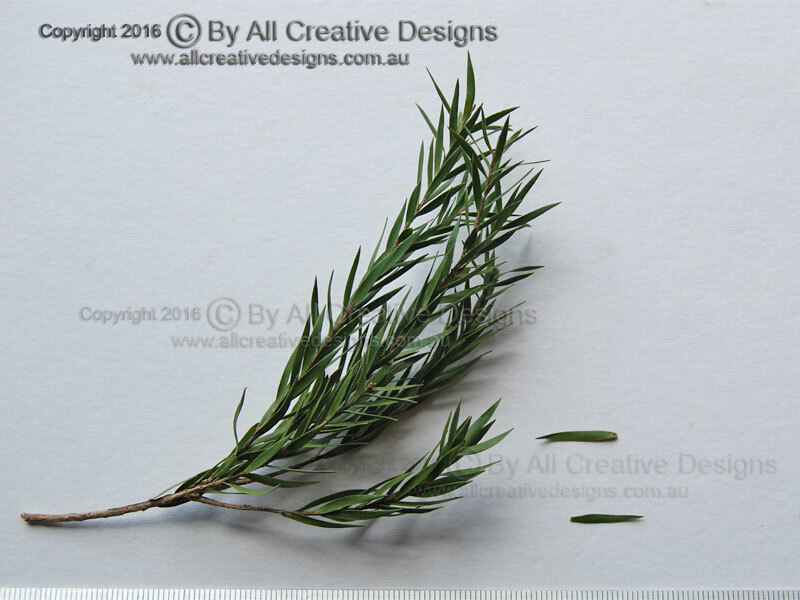 The widely spaced pinnules (leaflets) are; up to 15mm long, linear in shape, dark green on both sides, hairless and stiff in texture (5). Natural distribution: Central coast (Sydney) and central tablelands of NSW. Note: Use the Botanical Species List to locate other Acacia species. 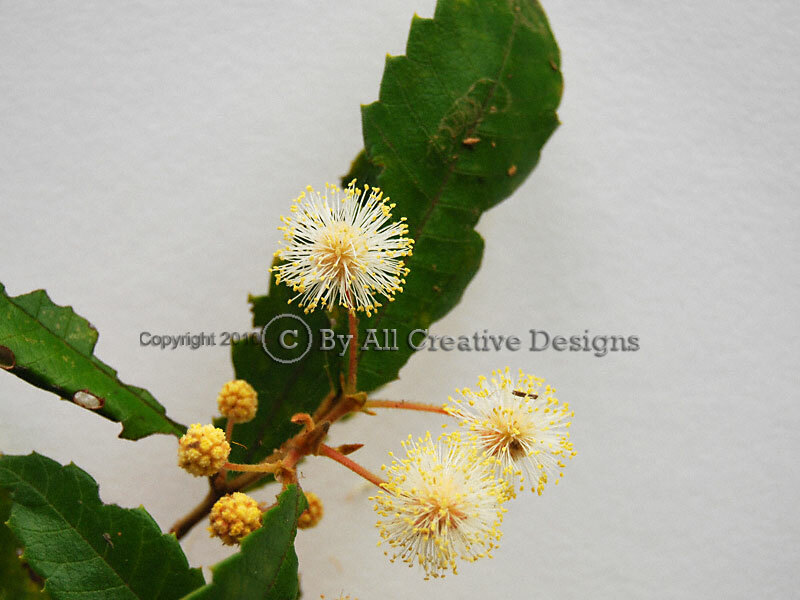 Similar to the Green Wattle (Acacia irrorata) (Page 6). 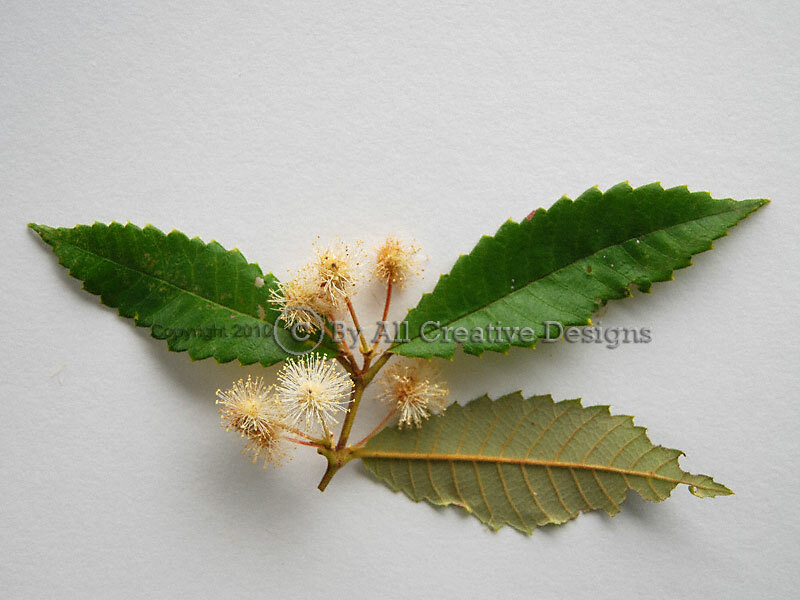 Despite its common name this species is not related to Wattle Trees (Acacia spp.) 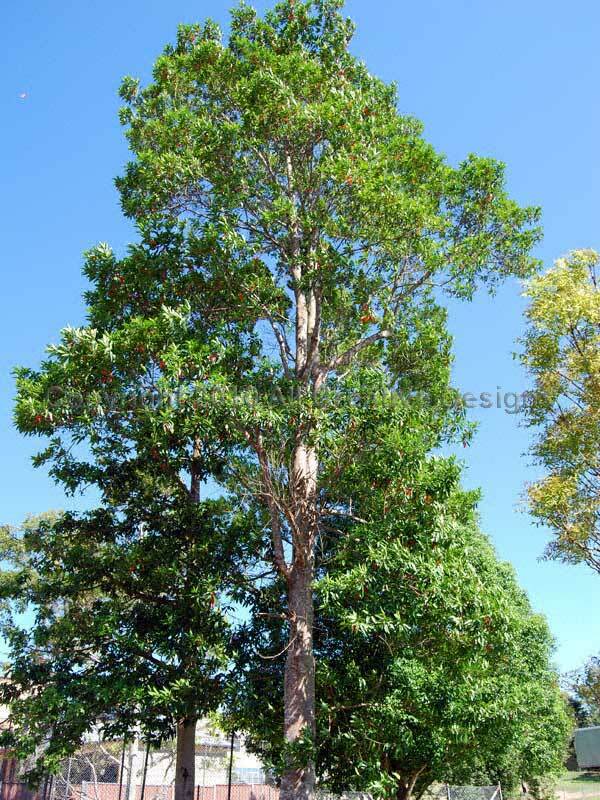 It is a small to medium tree up to 25m tall that inhabits open tall Eucalypt forests, and the margins of temperate and subtropical rainforests (Image 1). 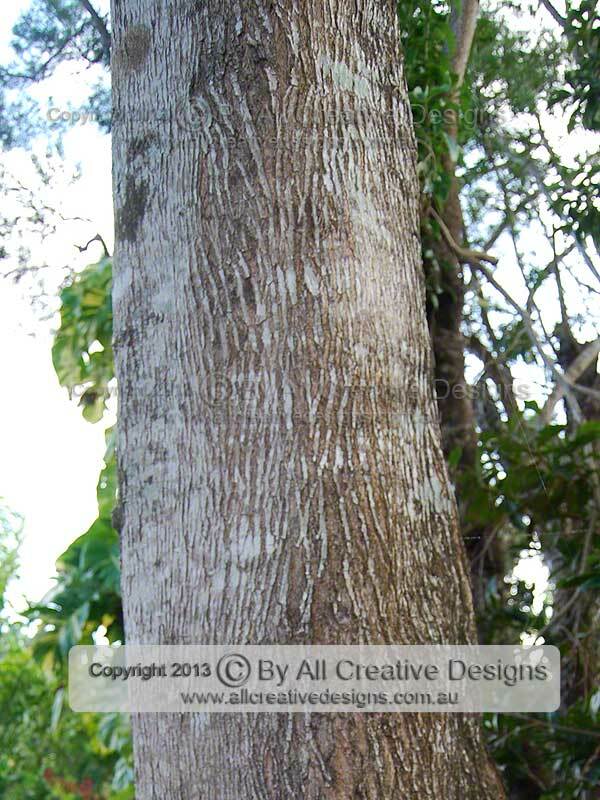 The trunk features a dark grey to nearly black coloured bark, which has a rough and flaky texture (2). Appearing In early spring, masses of white to cream-coloured flowers are up to 2cm in diameter and give the tree a distinctive appearance. Flowers with stamens forming the globular shape feature no petals and a stalk (pedicel) up to 3cm long (3 & 4). 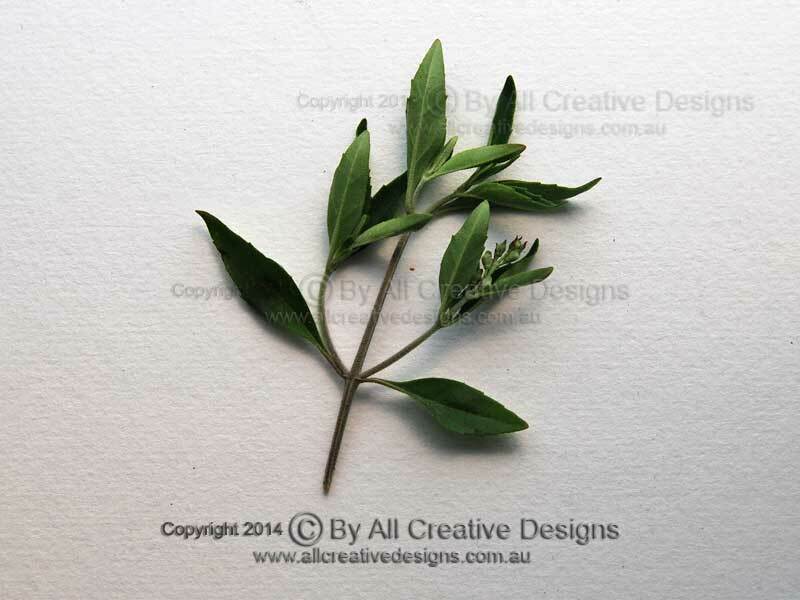 Simple leaves with an opposite arrangement are; up to 12cm long, mainly elliptic in shape with regularly toothed margins, mid-green and hairless on top, pale whitish to grey green beneath due to dense whitish hair, firm and rather stiff in texture. 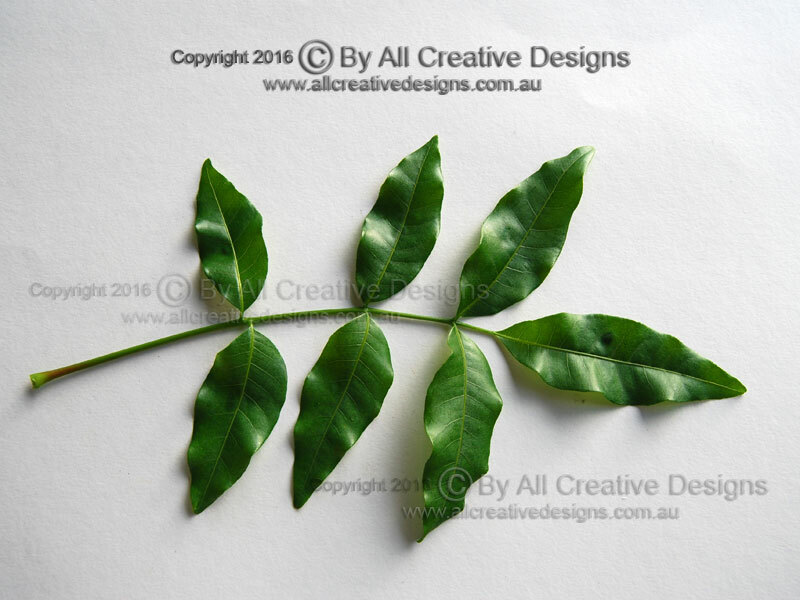 Apex is acute or short acuminate, base shape is cuneate. 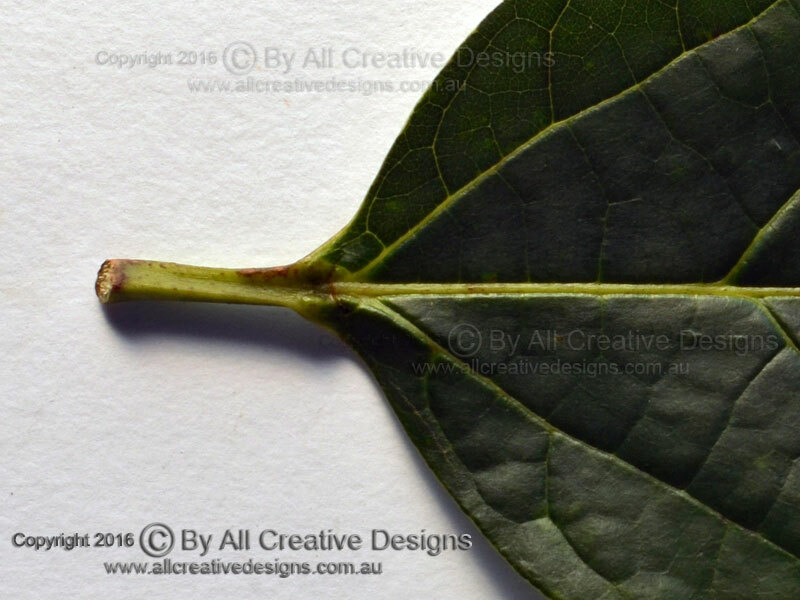 Petiole (leaf stalk) is on average 5 mm long. 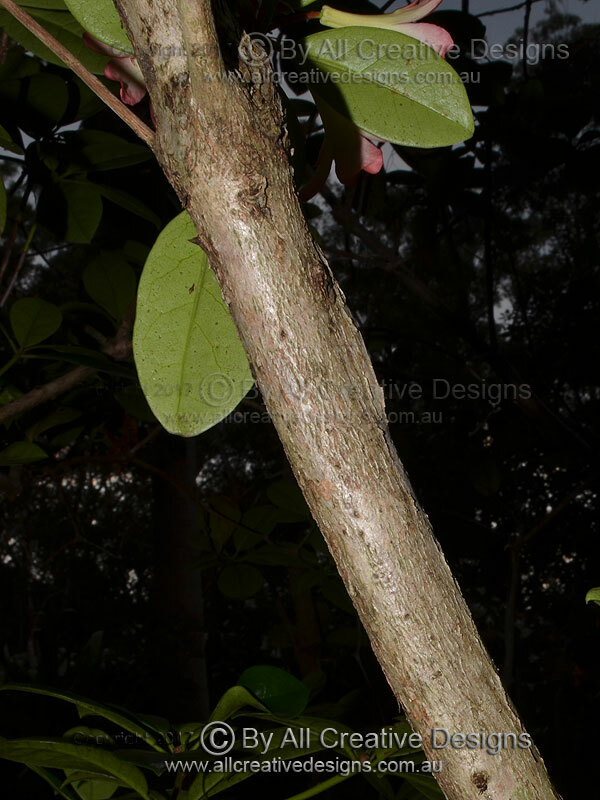 Mid vein and strongly raised lateral veins on the lower leaf surface are covered in fine rusty brown hair, which also covers young stems (Images 4 & 5). Distribution: Widespread from NSW south coast to central Qld. See Flower Characteristics Page for more information. 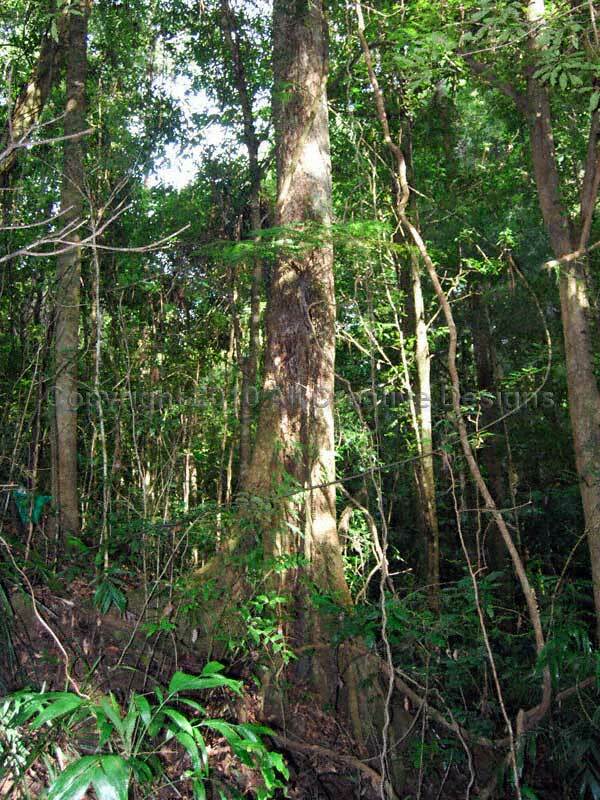 The Black-leaved Socketwood reaches a height of 15m and inhabits warm temperate and subtropical rainforests (1). 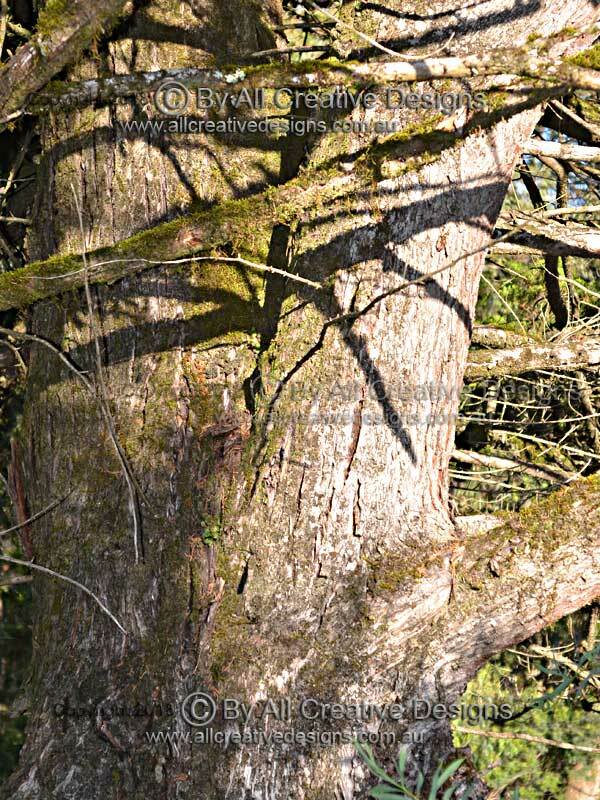 Bark at the base of the trunk becomes finely rough due to fine wrinkles and is cream or more olive green coloured (2). 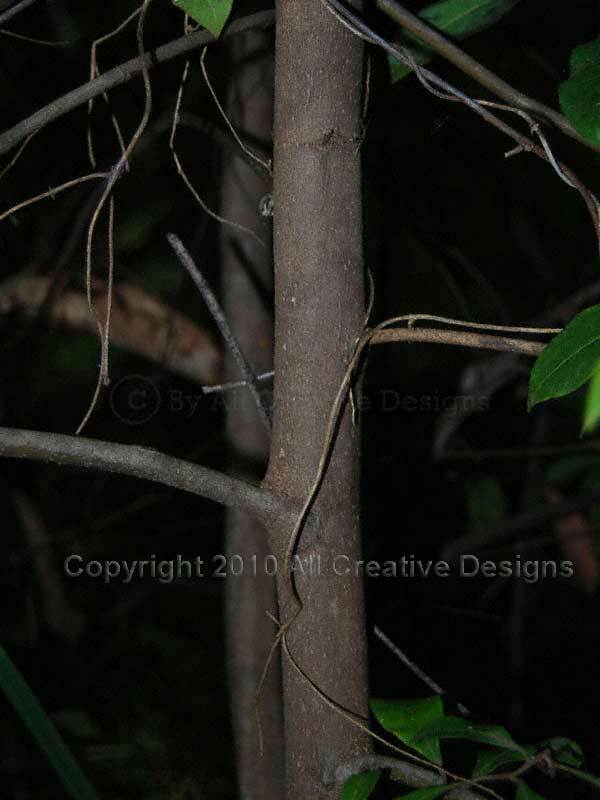 Young branches are distinctively flattened at junctions (3). The swollen receptacle (the apex of the flower stalk) is up to 20mm long and becomes woody at full maturity. It splits to release a number of hairy achenes, the actual fruit (4). 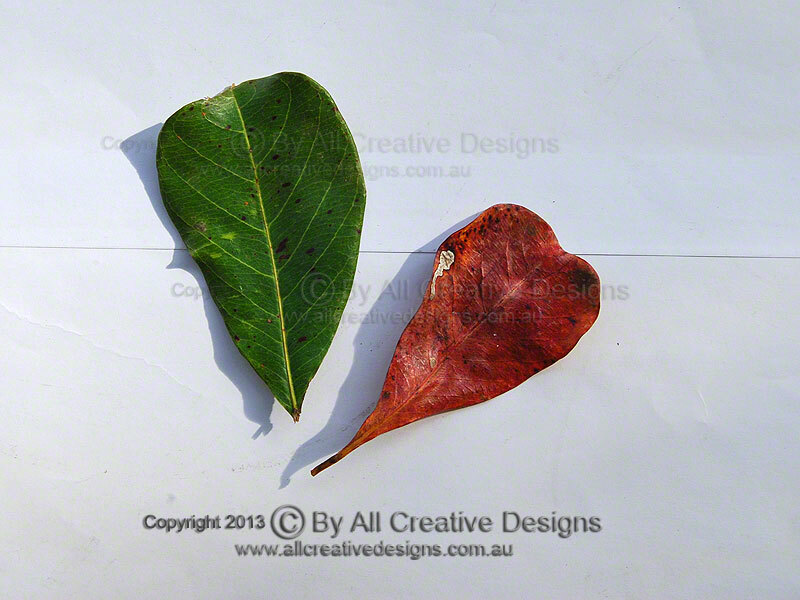 Simple leaves with an opposite arrangement are; up to 10cm long, broadly elliptic or ovate (egg-shaped) with toothed margins, hairless, dark green, glossy above, paler green beneath, scentless, relatively thin and turn black when fully dried (shown right) (5). Distribution: mid-north and far north coast of NSW. 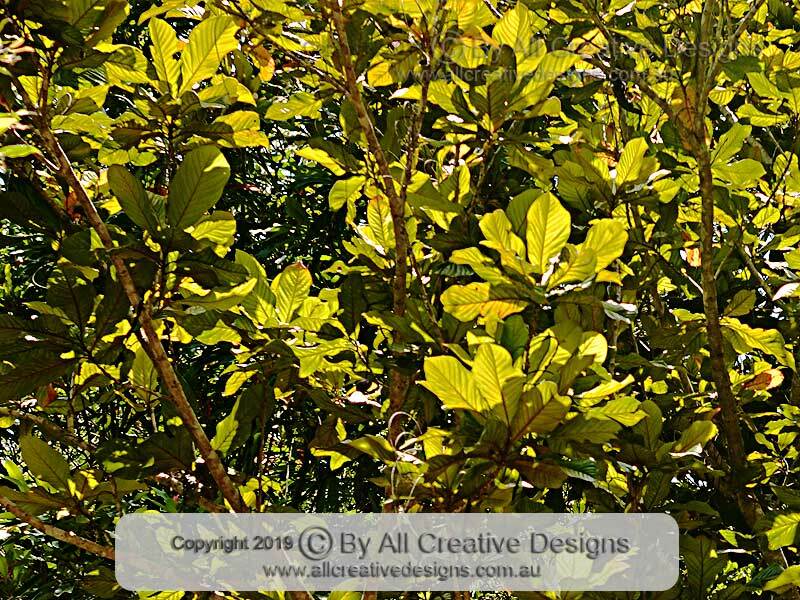 Note: The genus Daphnandra consists of 6 small to medium sized tree species called Socketwoods, which are endemic to New South Wales and southern Queensland. Common characteristics of these similar species include simple leaves with serrated margins and an opposite leaf arrangement. Typically young branches are flattened at internodes and fruits (hairy achenes) are enclosed in an enlarged receptacle. 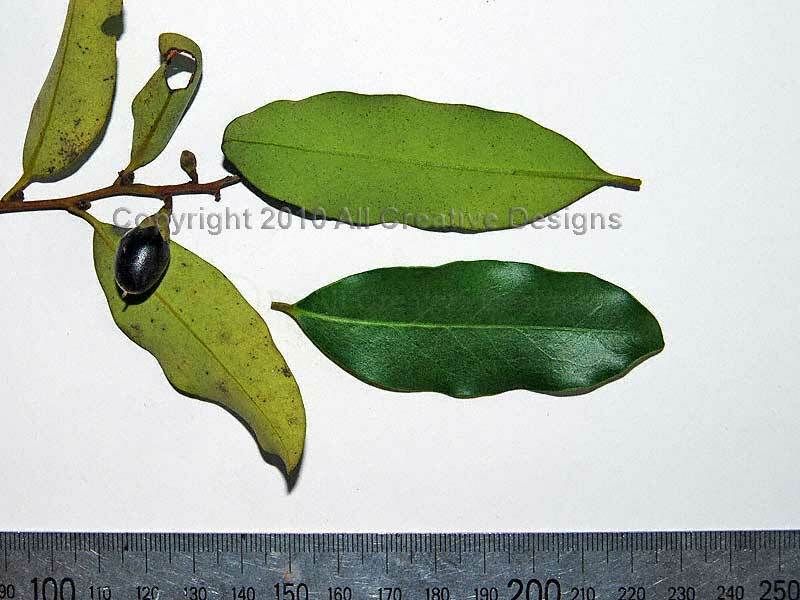 Leaves of the similar Sassafras, Doryphora sassafras (Page 9), are thicker and scented when crushed. 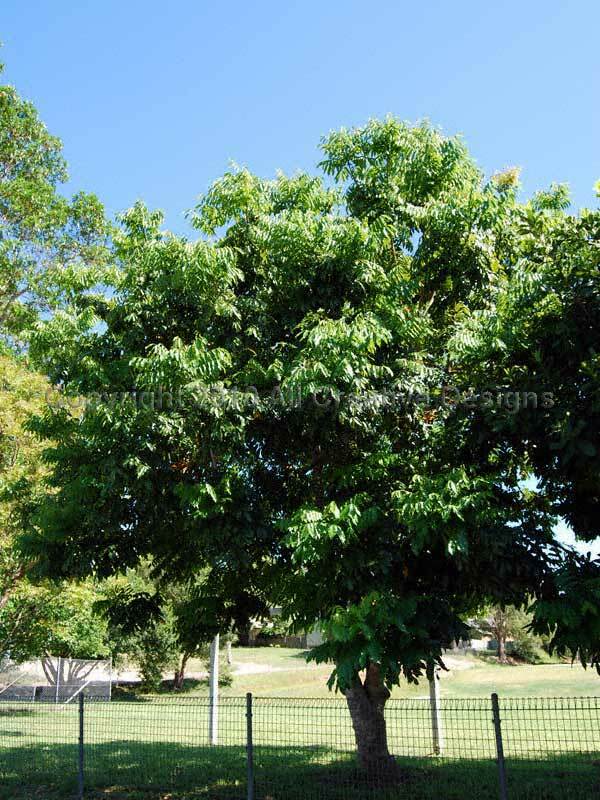 Due to its extensive distribution range, this native tree is known under an array of common names. 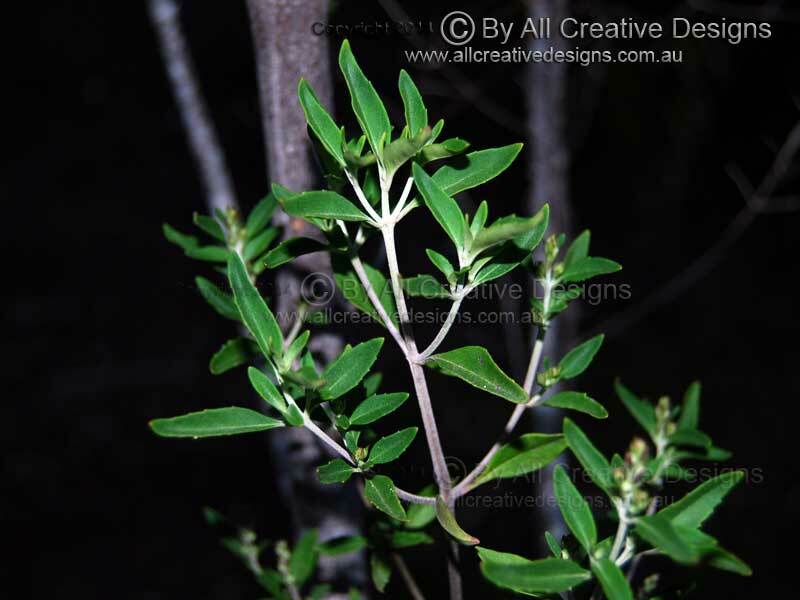 The Blackwood is very adaptable and grows in different habitats from mountainous areas to within lowland subtropical rainforests. 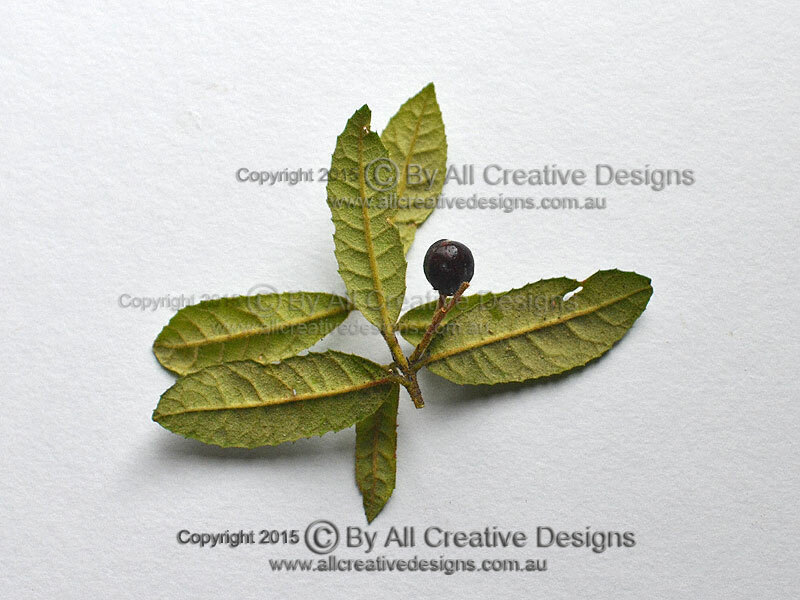 It can be a woody shrub under 5m high or under favourable conditions a tall tree up to 30m high in Tasmania (Image 1). 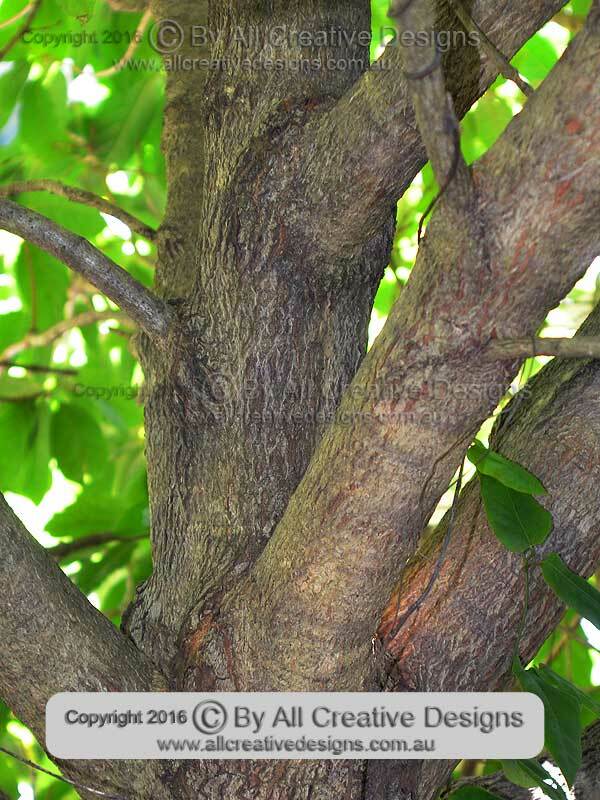 Bark on mature specimens is greyish brown in colour, firm, hard and furrowed in texture (2). 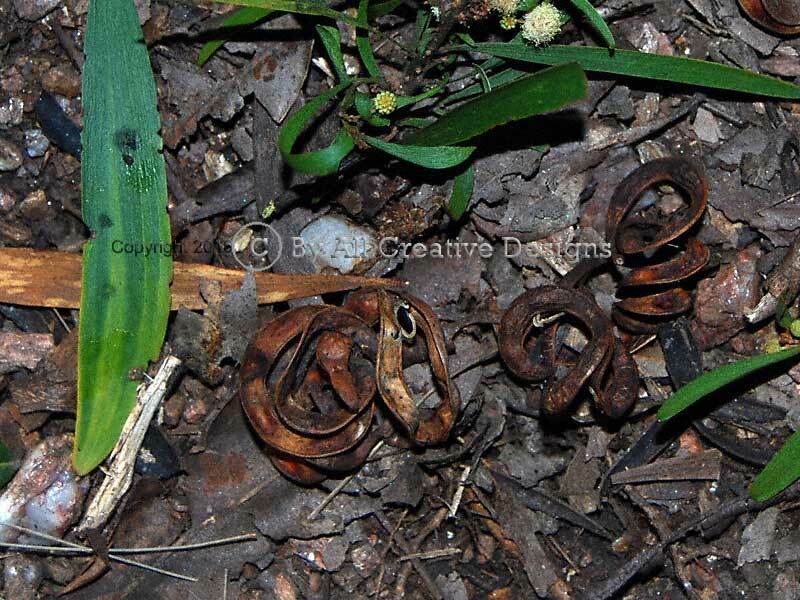 The coiled fruit pods can be found on the forest floor at most times of the year and are helpful when identifying this species. 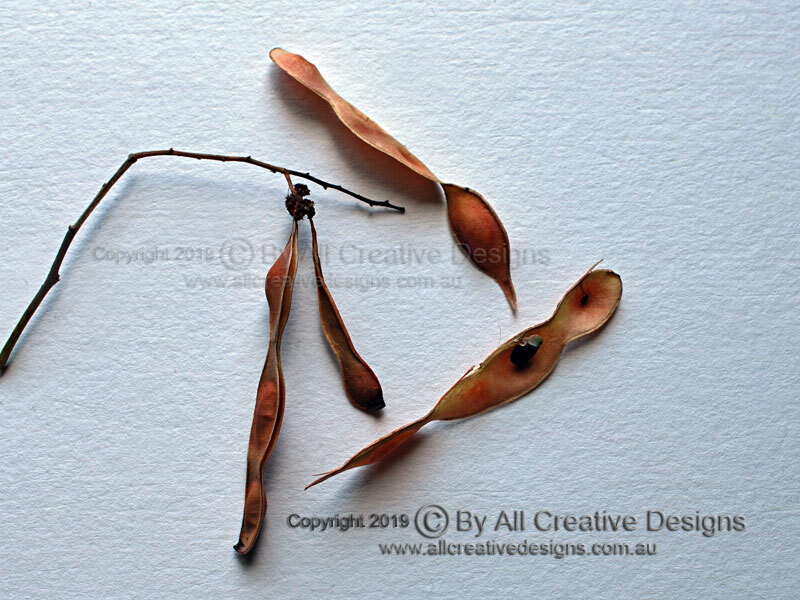 The flattened pods (when uncoiled) are up to 12cm long and contain a number of shiny black seeds (3 & 4). 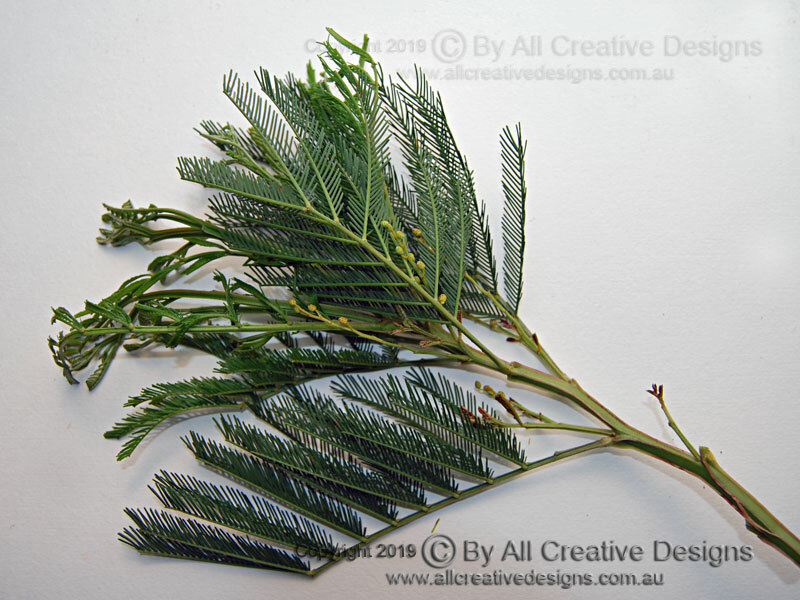 Simple leaves (phyllodes) with an alternate arrangement are; up to 15cm long, narrow oblanceolate (reverse lance-shaped) to elliptic with entire margins, hairless, fairly thin but firm in texture. Venation is longitudinal. Globular shaped flowers are cream to pale yellow coloured and bloom in spring (4 & 5). Distribution: Tas., Vic., NSW to northern Qld. 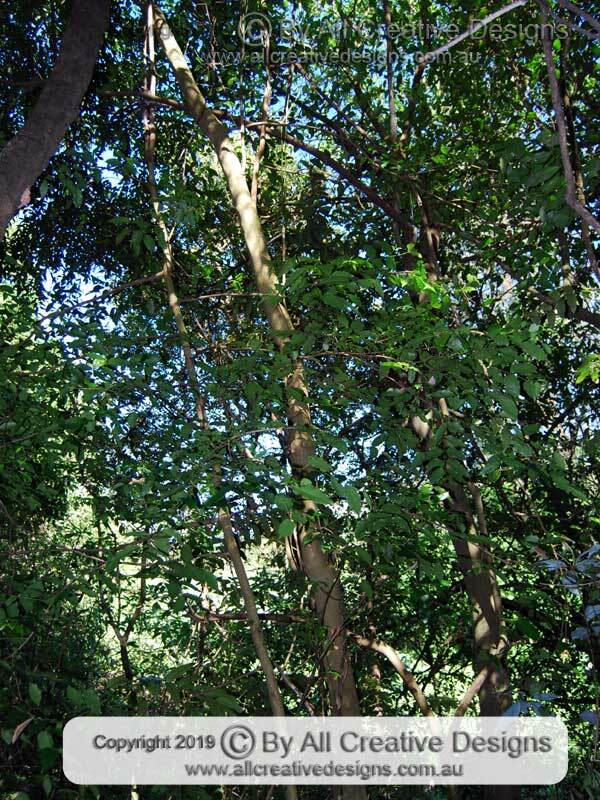 This abundant shrub or small tree species reaches a height of 6m (sometimes taller). 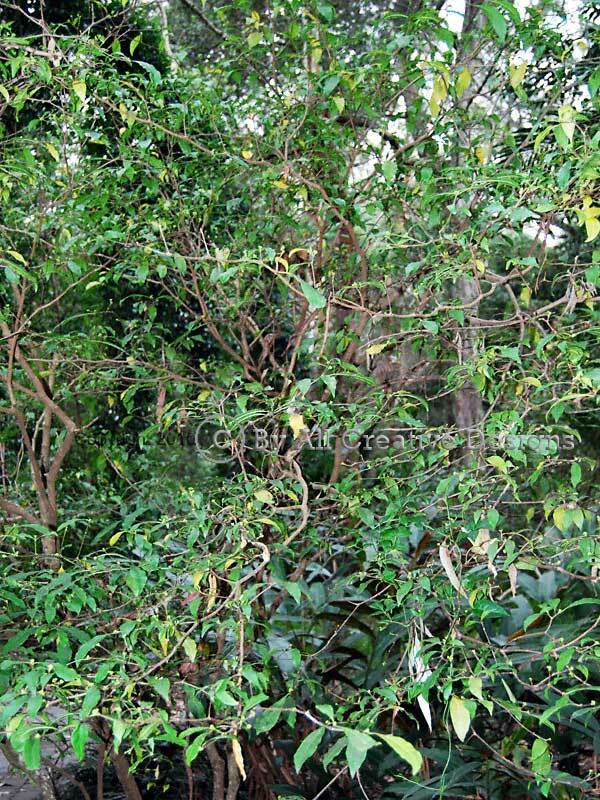 It favours moist locations in different types of rainforests and is often found as regrowth along watercourses (Image 1). 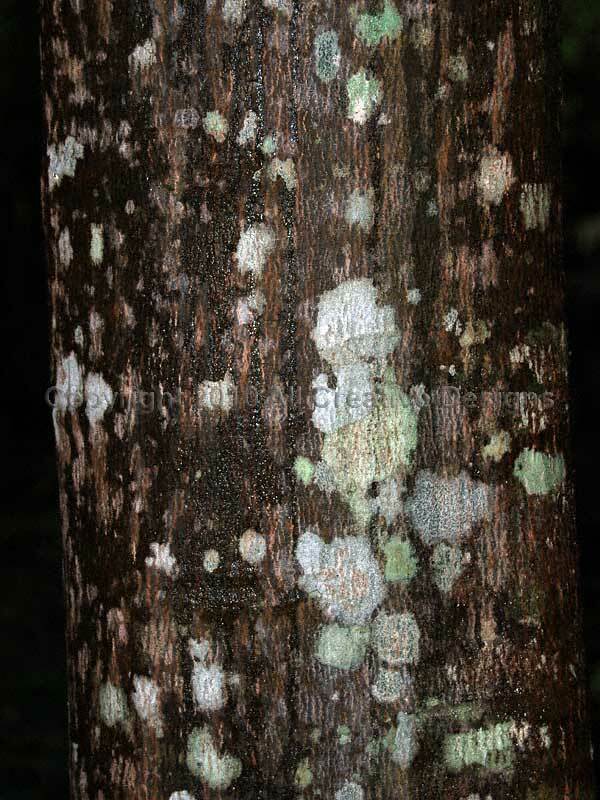 Bark on mature specimen is grey brown or olive brown in colour with a firm and rather smooth texture, (white patches are caused by lichen) (2). 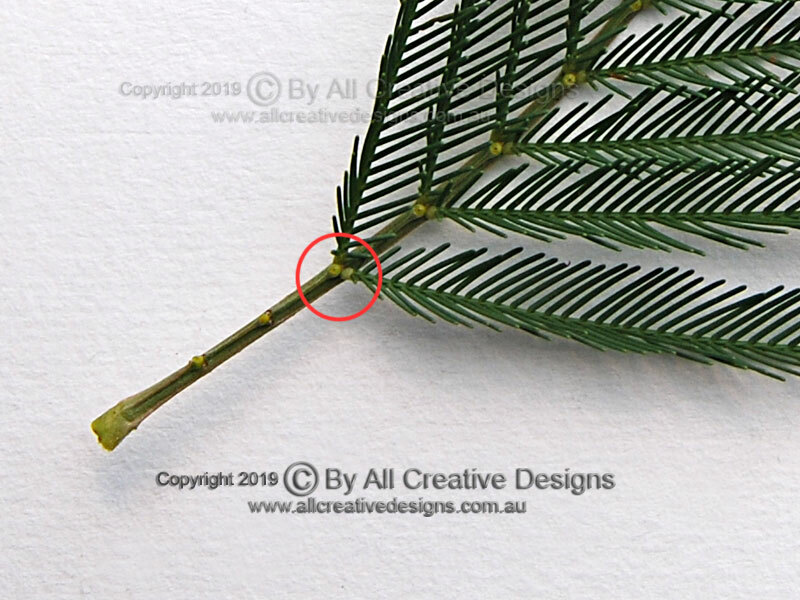 Small yellowish green flowers are borne on racemes more than 20cm long, which emerge at the very end of young branches (terminal) and bloom over spring (3). The fruit is a bluish green capsule divided into 2 sections (lobes or valves), each containing a seed less than 10mm in diameter, which is covered in a yellowish fleshy aril (4). 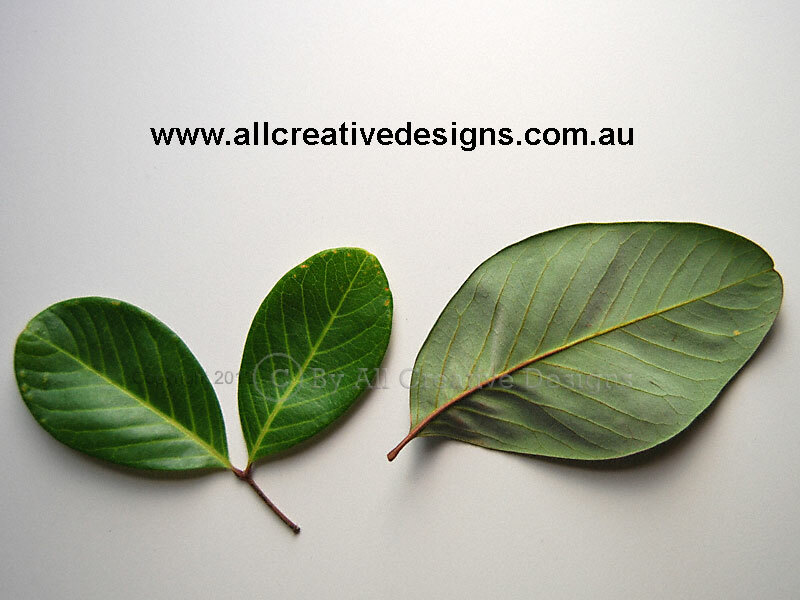 Simple leaves with an alternate arrangement are; up to 15cm long and 10cm wide, broadly ovate in shape with entire margins, dark green and glossy on top, paler grey-green beneath, hairless with a thin and soft texture. 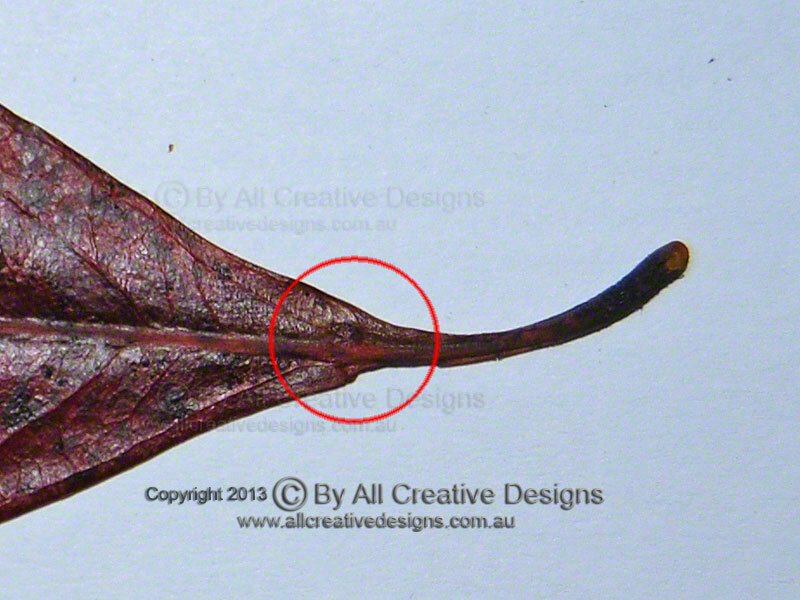 Glands (inset 5) at the top of the red petiole, which is up 10 cm long and exudes a milky sap when broken, are useful identification features. Leaf apex is acute, base shape is rounded. Venation is clearly visible on both leaf surfaces (Images 4 & 5). Distribution: Widespread in northern Vic, NSW and Qld. 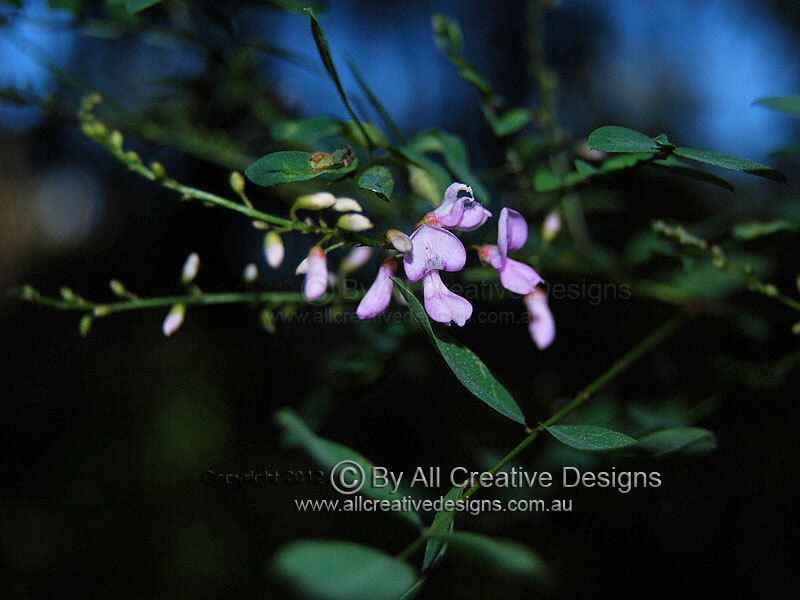 There are numerous different Mint Bushes (Prostanthera spp.) 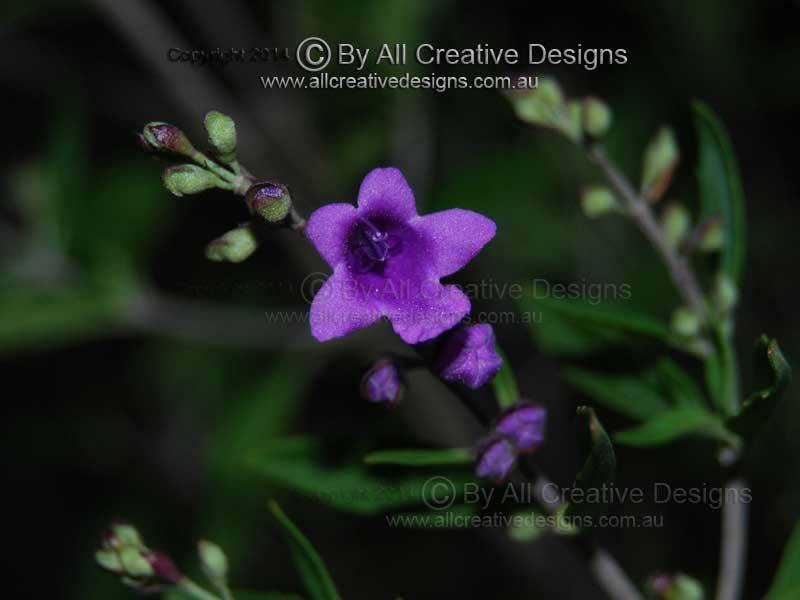 native to Australia, with many of them grown in cultivation for their beautiful flowers. 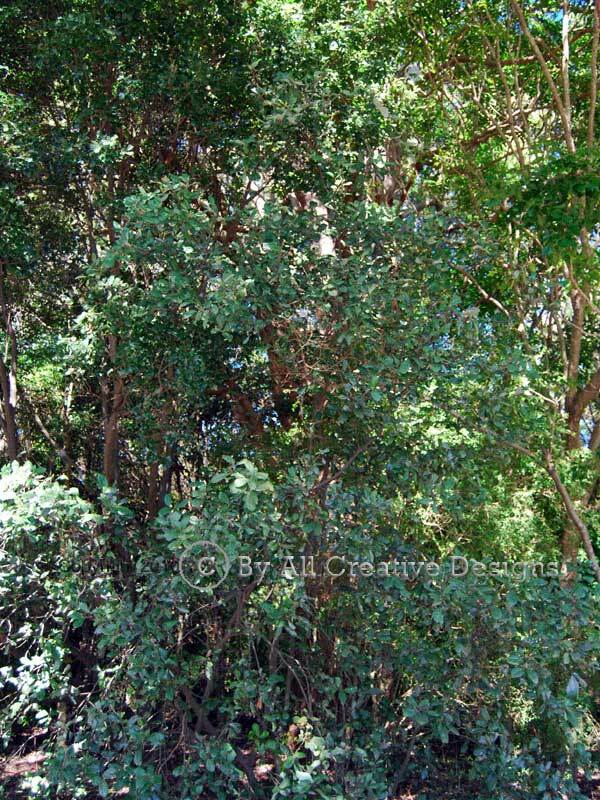 The majority of species are wooden shrubs less than 4m tall and the leaves of all of them are mint scented when crushed. 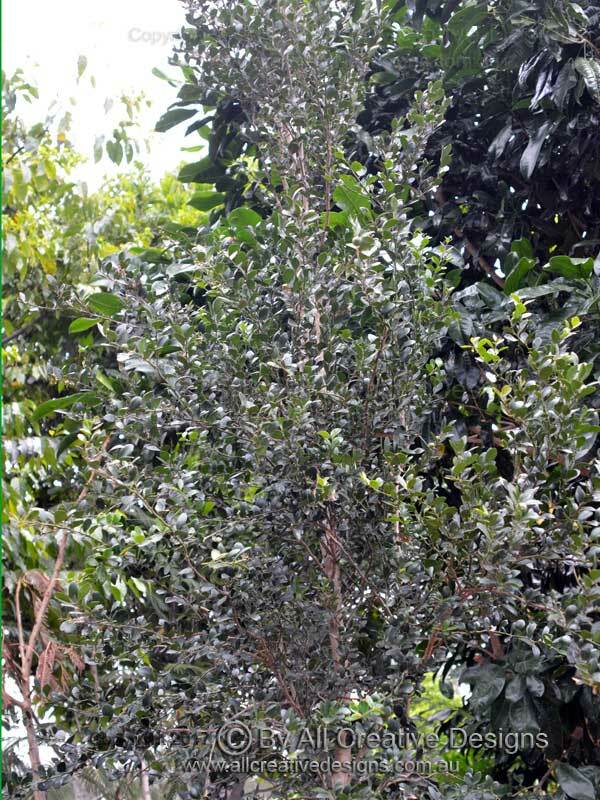 The Blue or Lilac Mint Bush (shown) can reach a height of 3m and inhabits tall Eucalypt forests as an understorey plant (1). 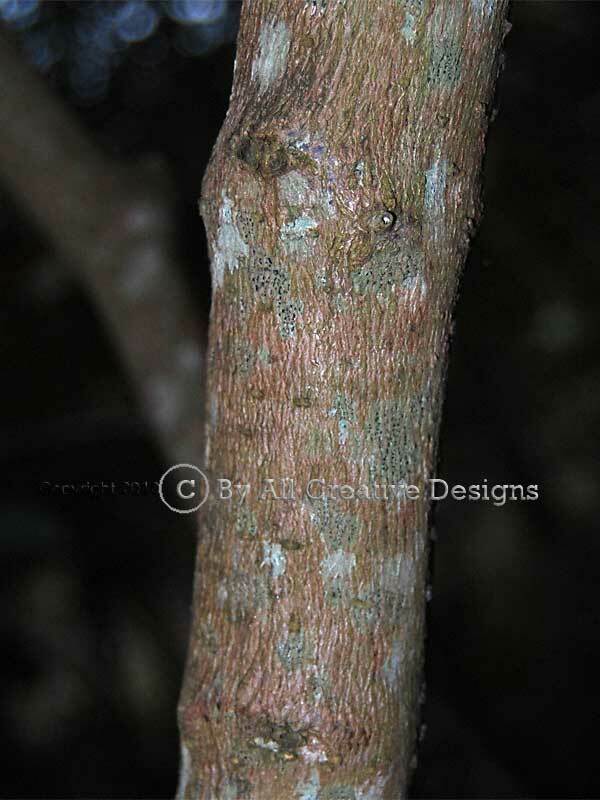 Bark on older stems is grey in colour, firm and finely rough in texture (2). Flowers can vary in colour from blue to mauve or more lilac and under closer inspection show tiny white dots. They measure about 10mm across and flower over spring (3). Young stems and the emerging leaves are covered in fine, short hair. 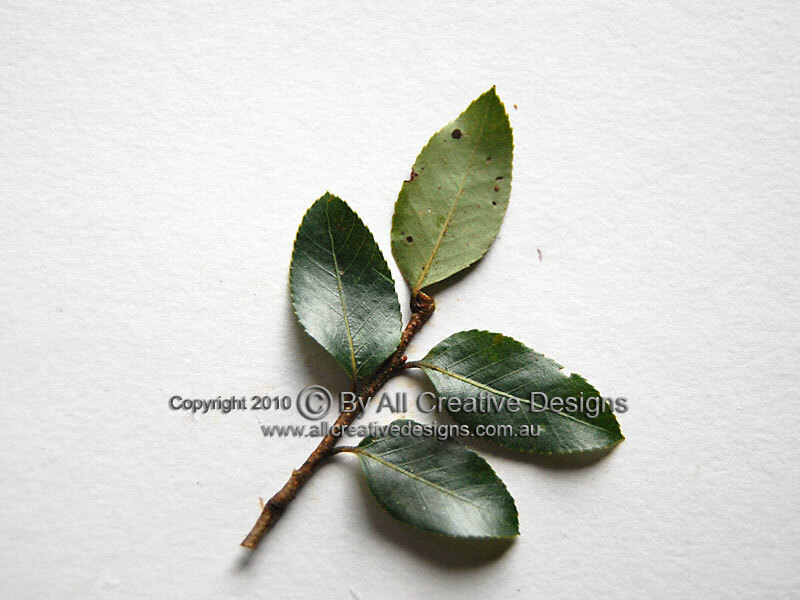 Simple mature leaves have an opposite arrangement and are; up to 6cm long, varied from lanceolate (lance-shaped) to elliptic or narrow ovate with toothed margins, mostly hairless, soft in texture and compared to other Prostanthera spp. only mild scented when crushed. 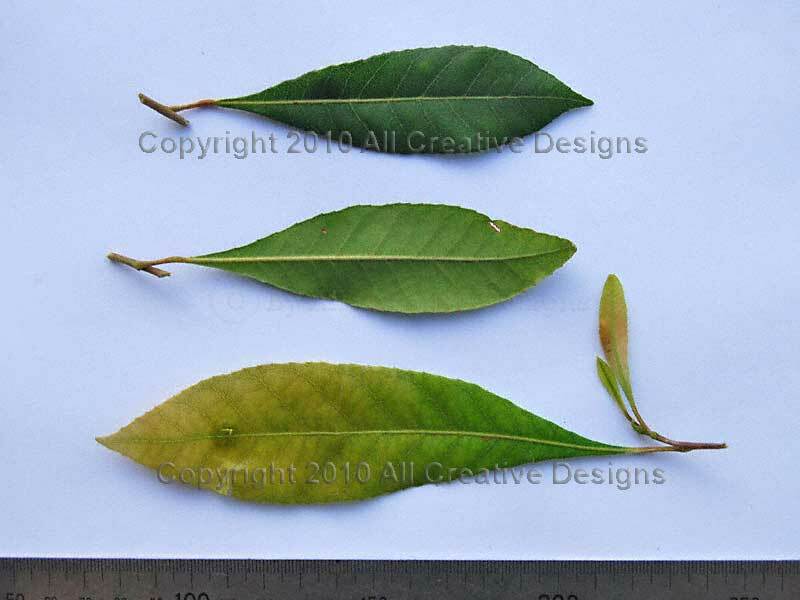 Leaf apex is acute, base shape is cuneate. 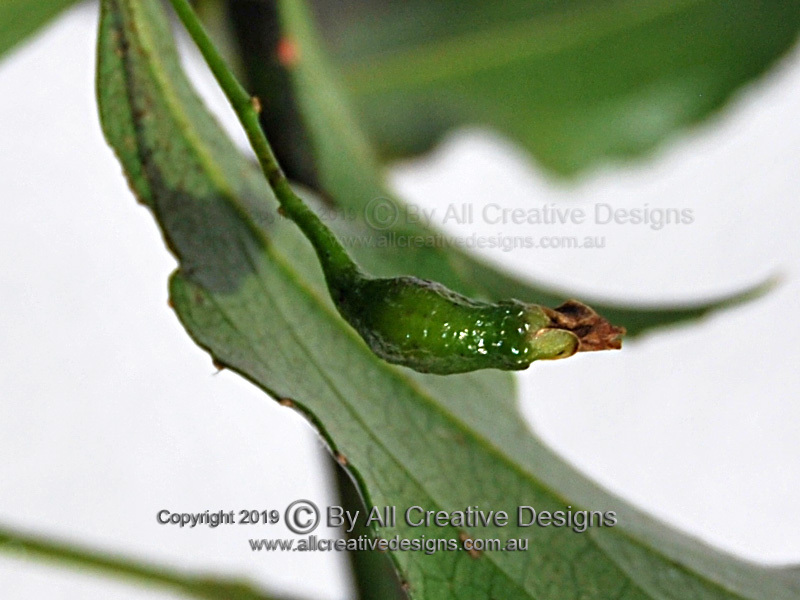 Petiole (leaf stalk) is up to 10mm long. Venation is faint with lateral veins being more visible on the lower leaf surface (4 & 5). Distribution: NSW only. 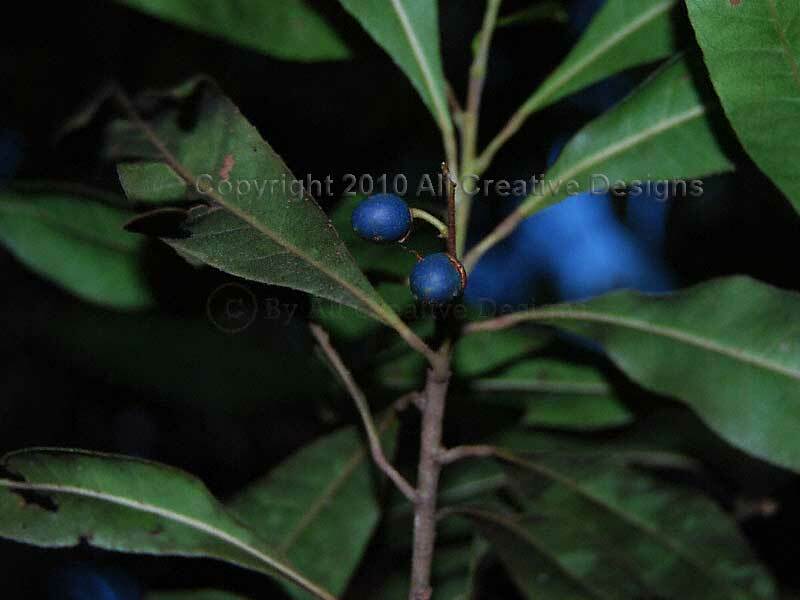 The Blue Quandong is a tall tree that attains more than 40m in height and often forms the highest canopy in subtropical rainforests. 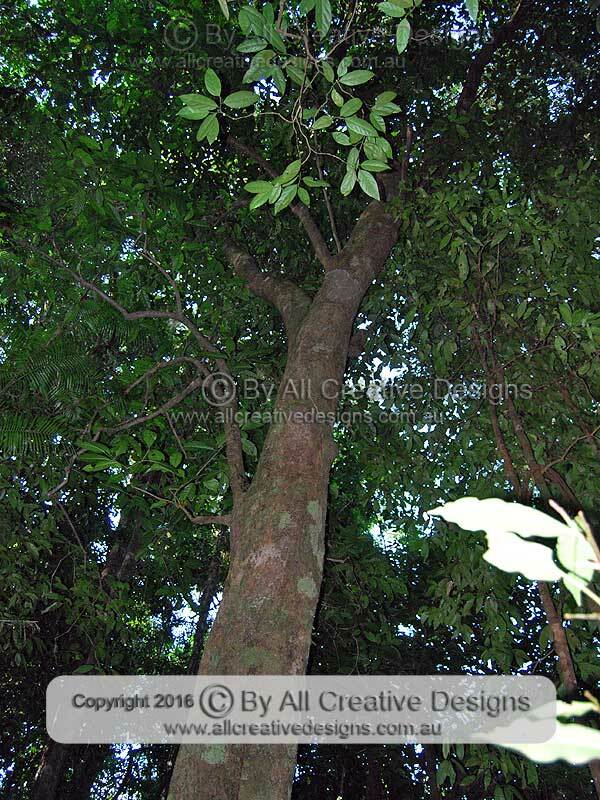 The image (1) is showing a street tree about 20m high. 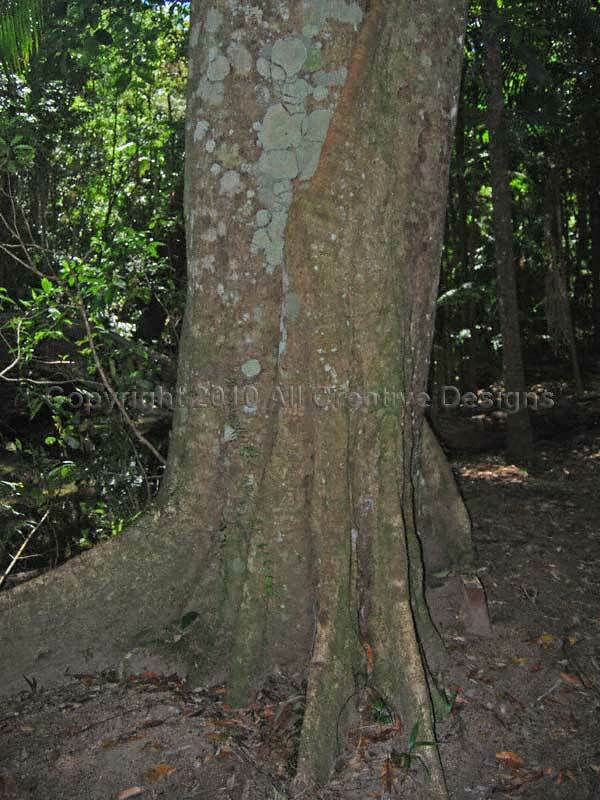 Large buttress roots are a common feature of mature trees in their natural habitat (Image 2). 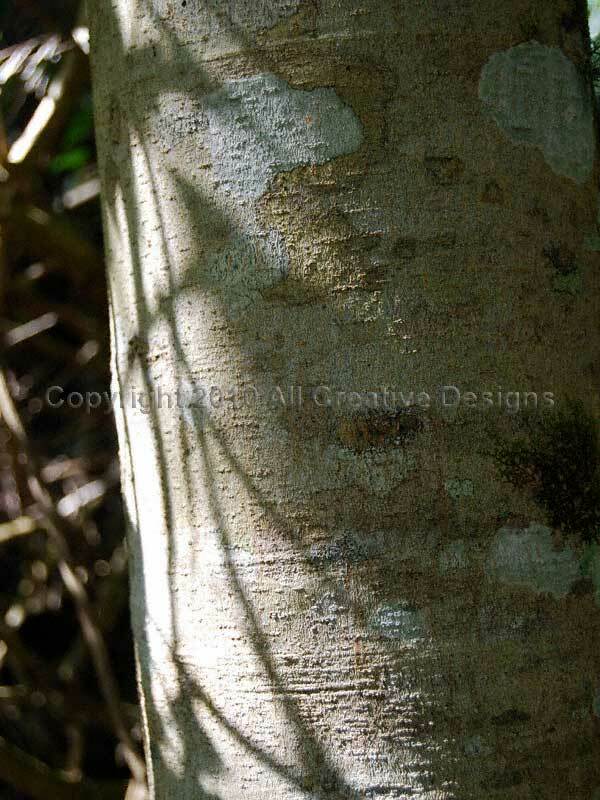 Bark is greyish in colour with a firm texture and horizontal ridges (3). 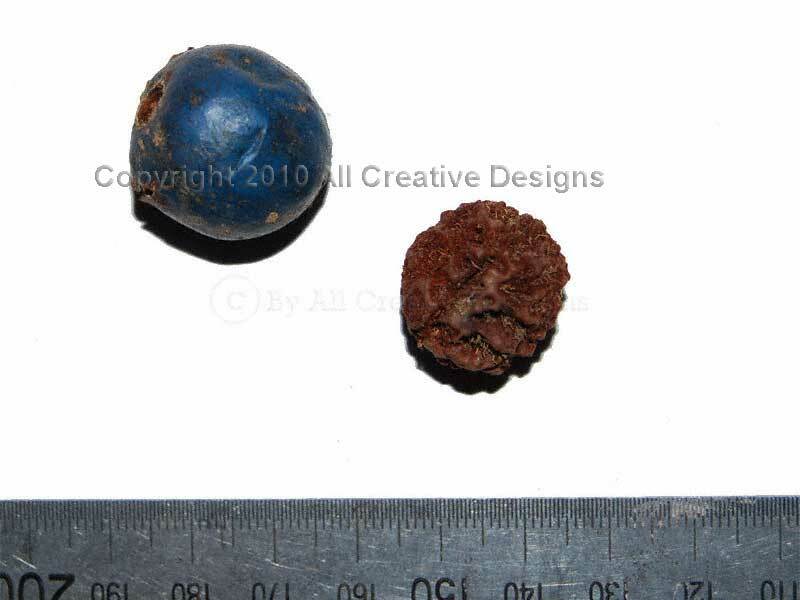 The vivid blue fruit (a drupe) is up to 25mm in diameter and contains a deeply grooved and very hard seed, characteristic for the genus (4). 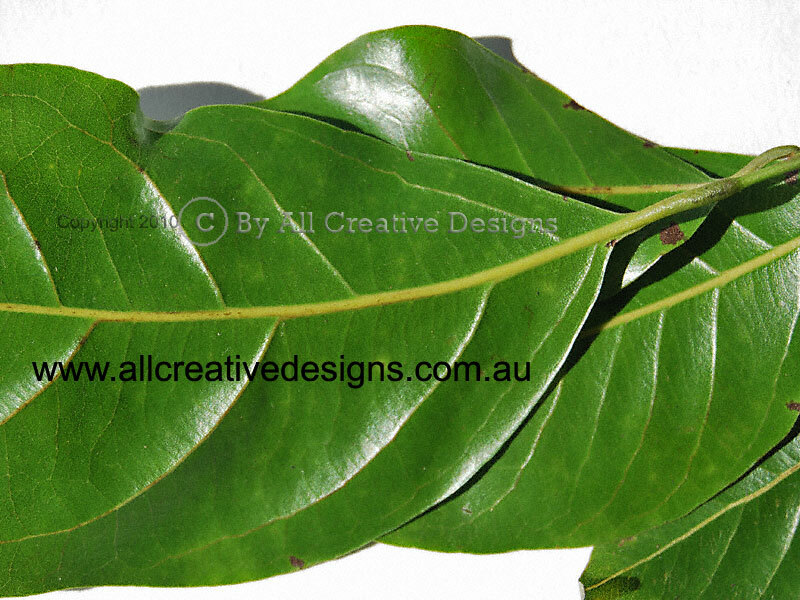 Alternately arranged simple leaves are; up to 16cm long, oblong in shape with finely toothed margins, hairless, glossy on both surfaces, paler green below and firm in texture. Apex is acute or more rounded; base shape is attenuate. 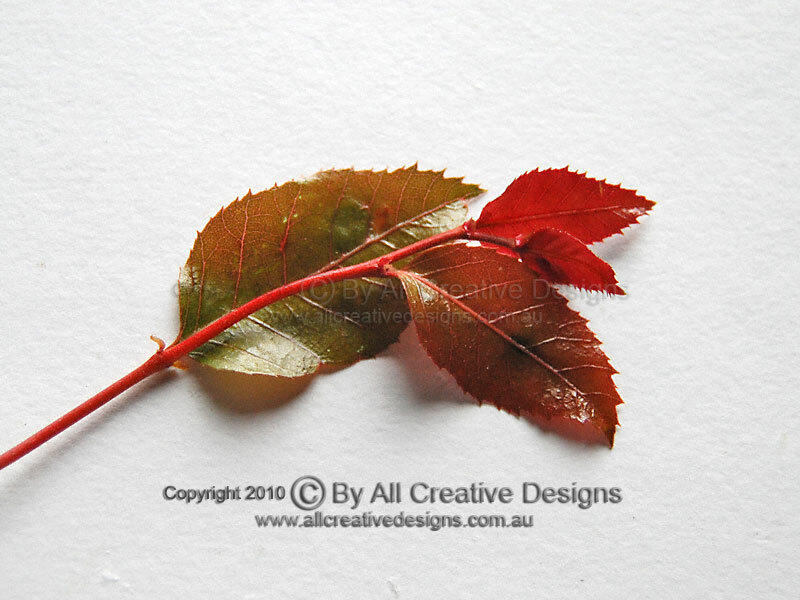 Older leaves will often turn red before falling. 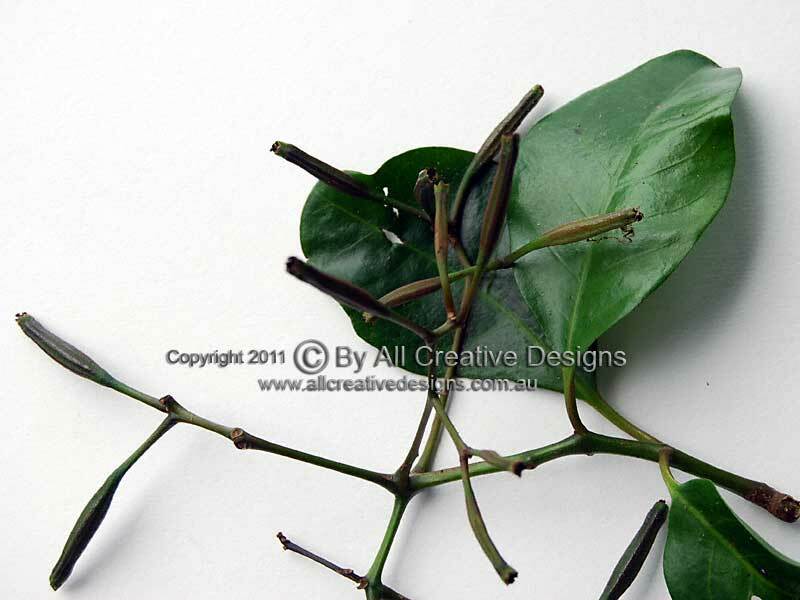 The strong petiole (leaf stalk) can be up to 25mm long. Several domatia along the centre vein are very evident, laterals are raised on lower leaf surface (5). Distribution: Mid-north coast of NSW to north Qld & NT. 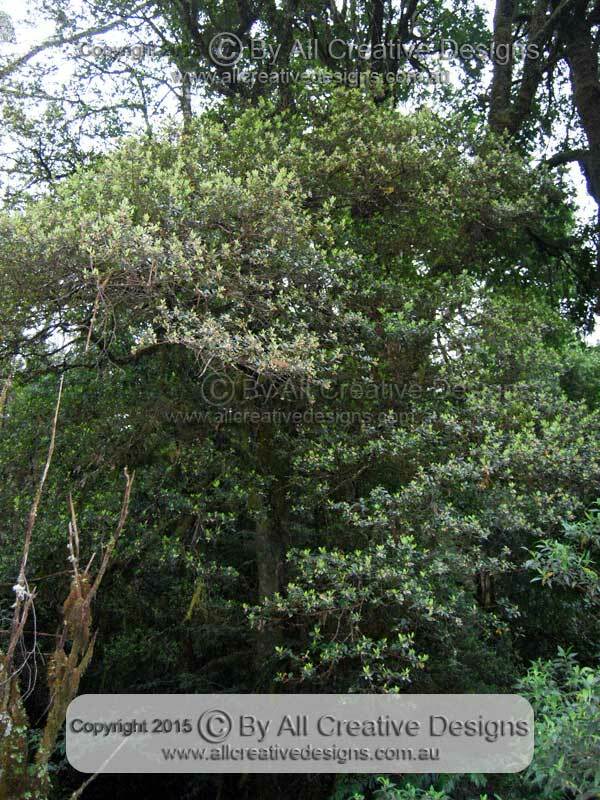 This widespread and eye-catching small to medium sized tree species reaches a height of 20m (depending on conditions). 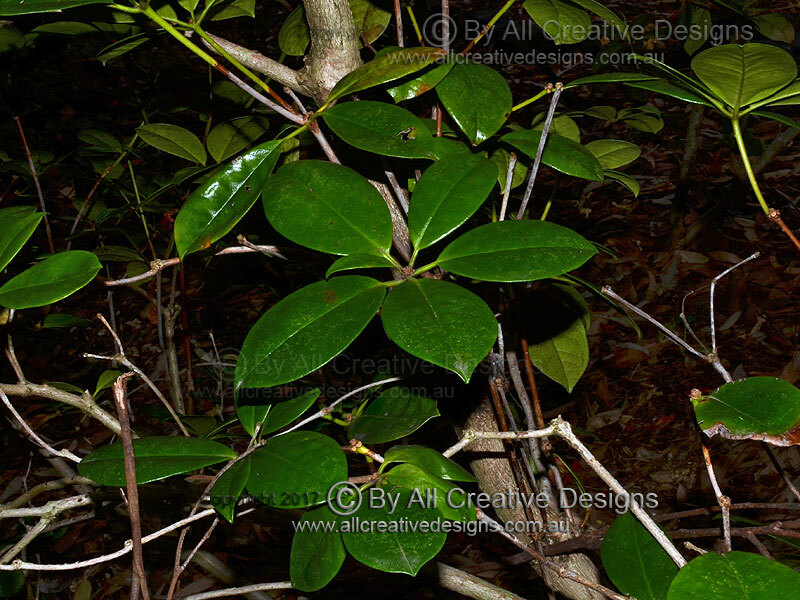 It is found in a variety of forest types along Australia's east coast (Image 1). 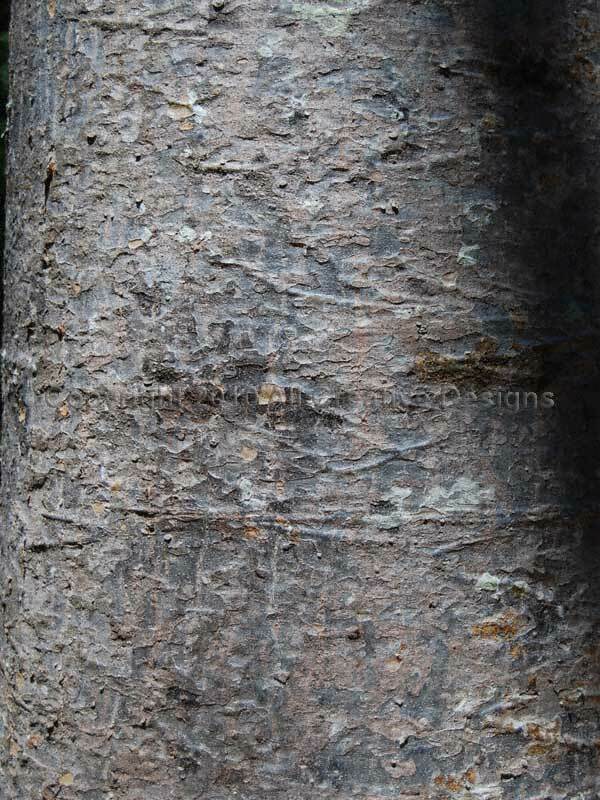 Bark is a dark grey colour with a firm and smooth texture (2). Masses of small white and scented flowers are arranged on panicles and bloom in early spring within warmer regions and late spring/summer in cooler environments (3). 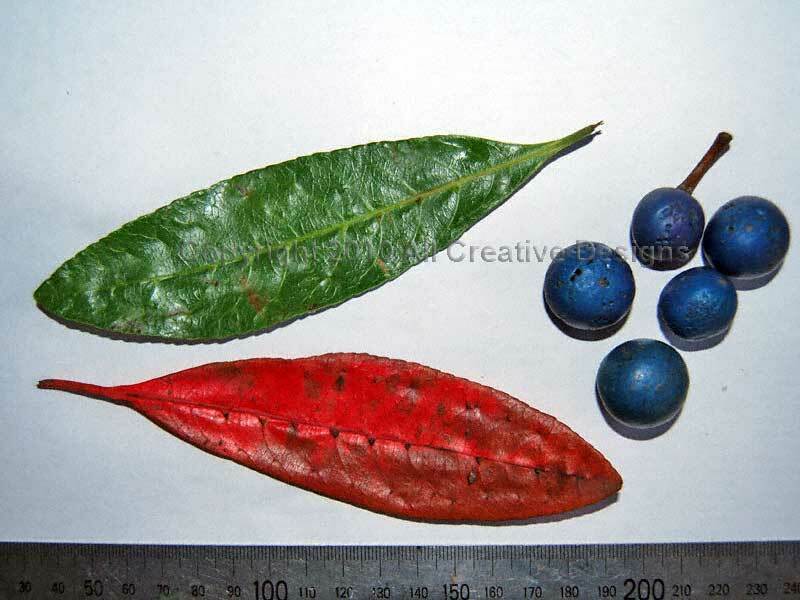 The beautiful small blue fruit (a drupe) resembles a blueberry in appearance and size, but beneath a thin layer of fruit flesh it contains a single very hard and deeply grooved seed. Fruit matures in autumn (4). 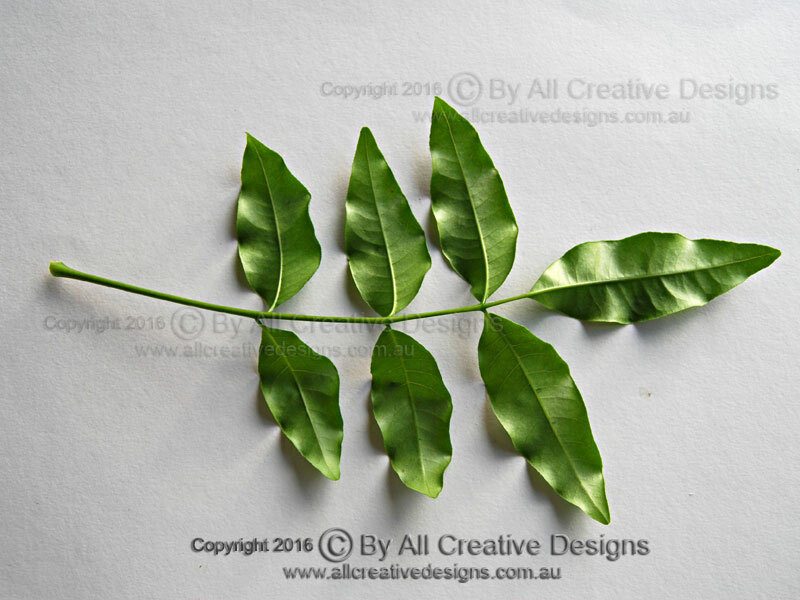 Simple leaves with an alternate arrangement are; up to 12cm long, elliptic or broadly oblanceolate (reverse lance-shaped) with regularly toothed margins, hairless, strong and firm in texture. Apex is acute or short acuminate; base shape is attenuate. 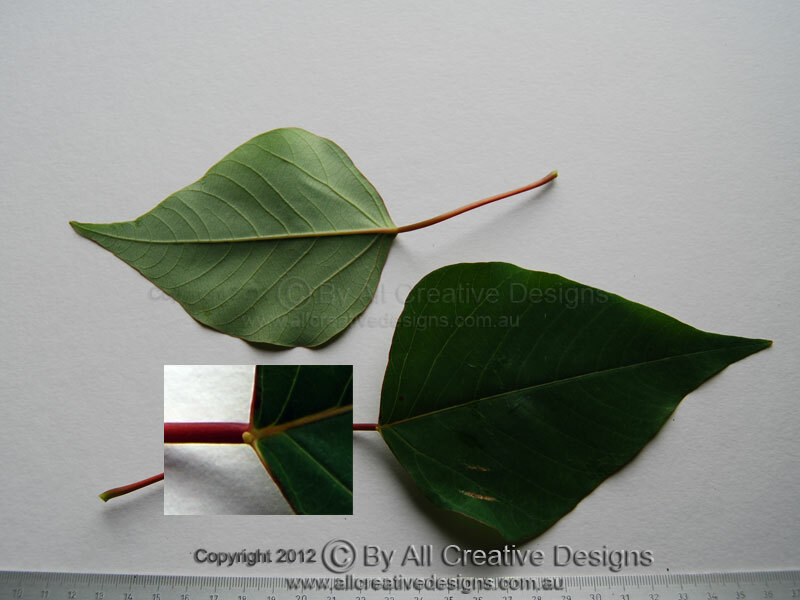 The often red coloured petiole (leaf stalk) is up to 10mm long. Fine reticulate venation is visible and domatia, as small bristles, are present on the lower leaf surface. Attractive young growth is often a salmon colour (5). Distribution: Common in Victoria, NSW and southern Qld. See Flower Characteristics Page and Leaf Characteristics Page for information on terms used. VISIT US ON FACEBOOK and if you like leave a comment. We cross referenced our tree images by using these Resources (click to view), to ensure correct botanical identification. All photos and information in accompanying descriptions have been compiled through a personal interest in our native flora over the last twenty five years. Details on distribution ranges of tree species has been gathered from a range of sources including Botanical Gardens (see link above). The aim of these web pages is to show the greater public the beauty and diversity of our remaining rainforests on Australia's east coast in an easy accessible way. We hope to raise the awareness to the high conservation value these remaining areas inherit. Please note all photos are copyright, watermarked and not to be used without prior permission by All Creative Designs® worldwide rights reserved.